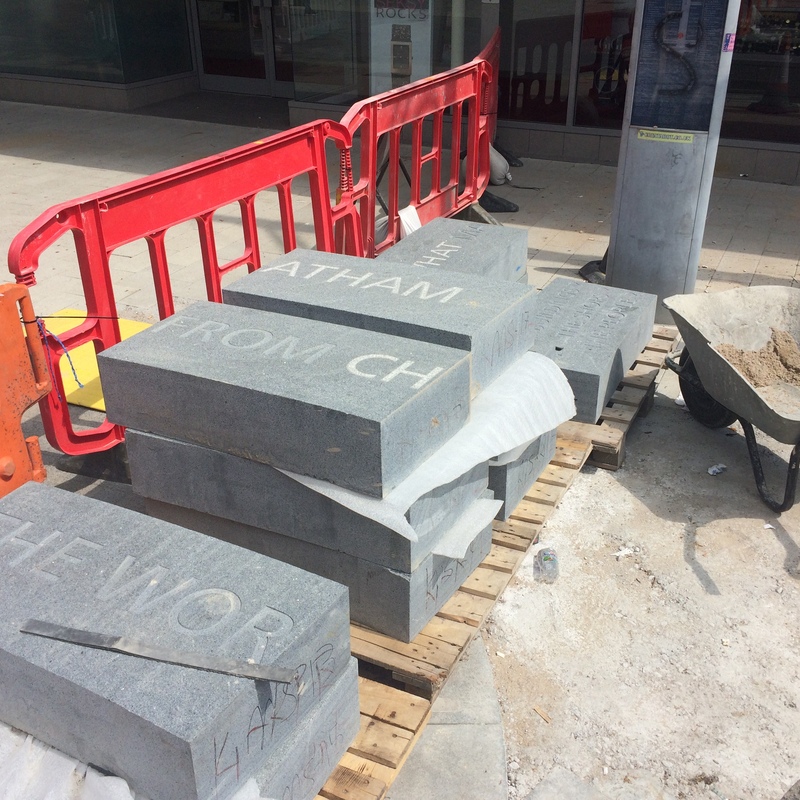 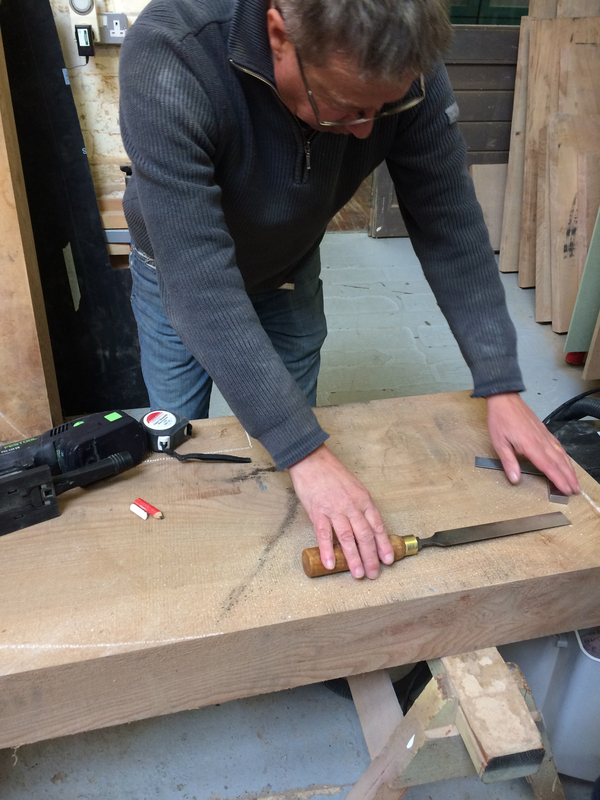 I have been working in collaboration with Andrew Lapthorn Furniture on a series of 6 monolithic granite and English Elm seats to be positioned at key anchor points within the streetscape of our Chatham Placemaking Project. 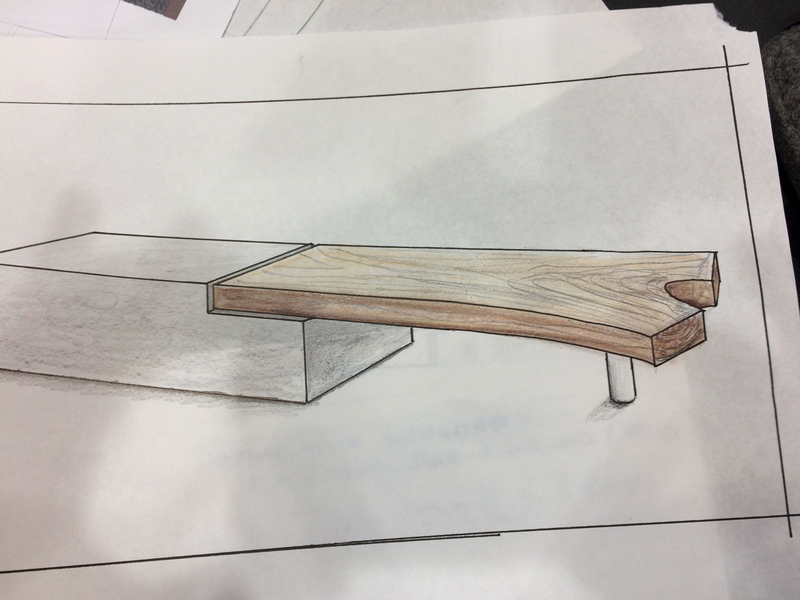 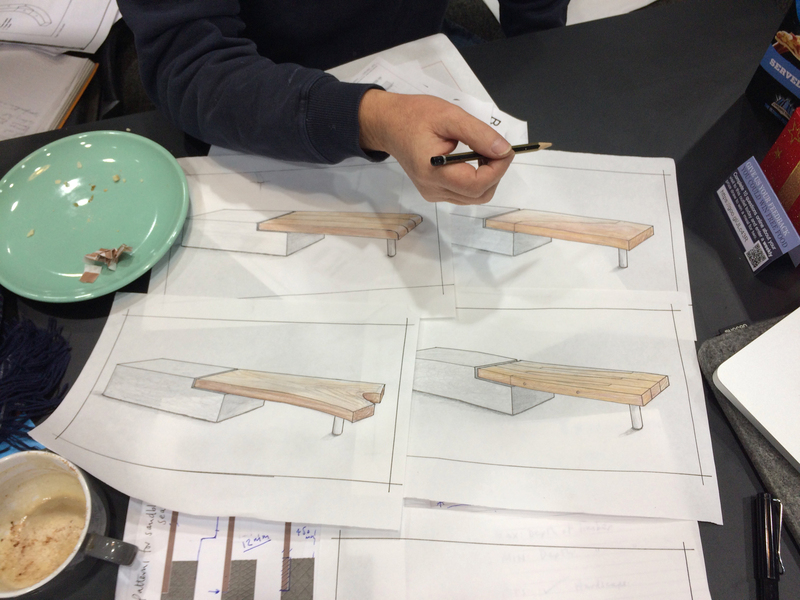 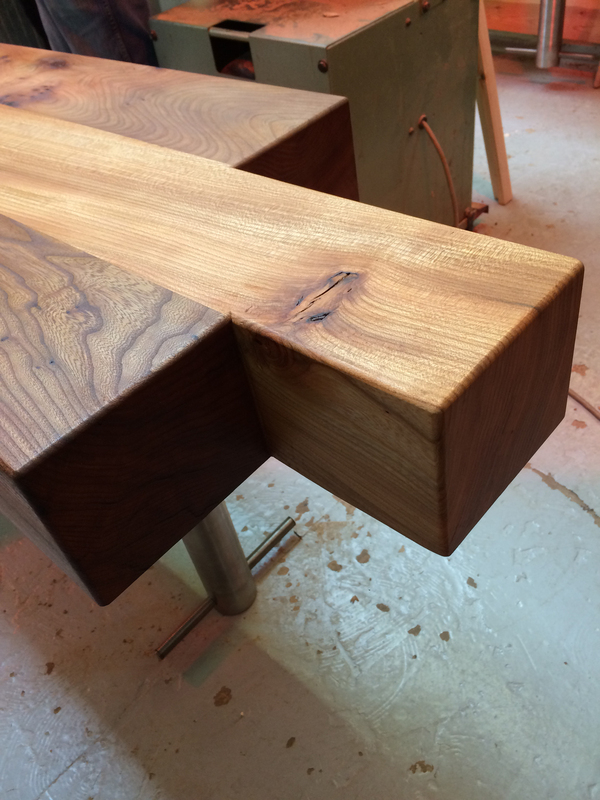 Andrew is a furniture designer and maker. 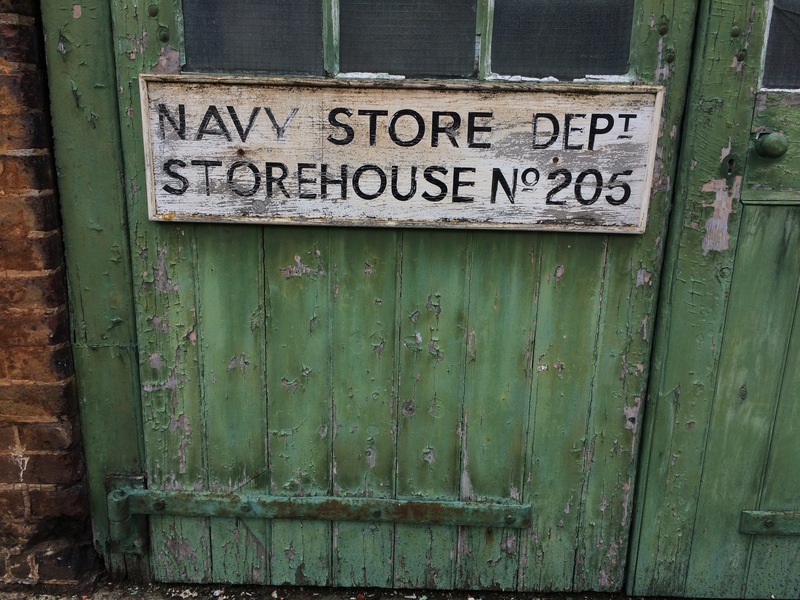 He has a workshop within the Historic Dockyard Chatham. 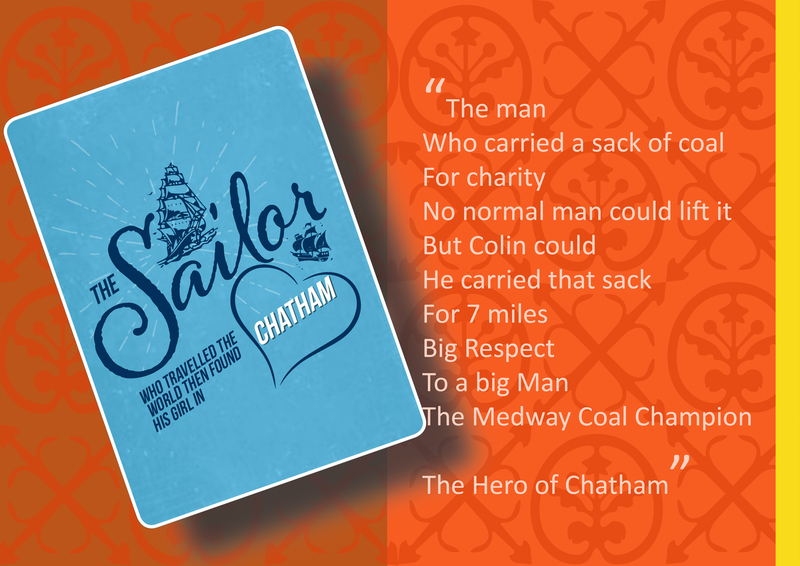 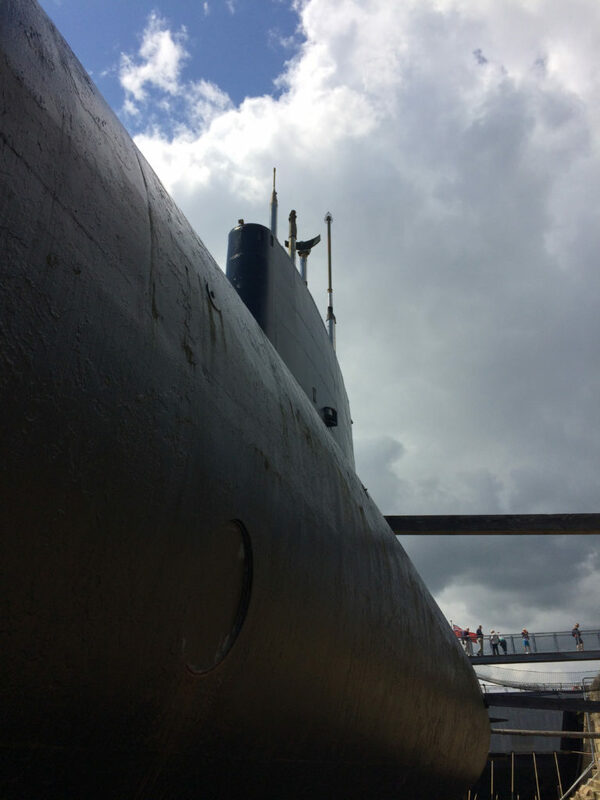 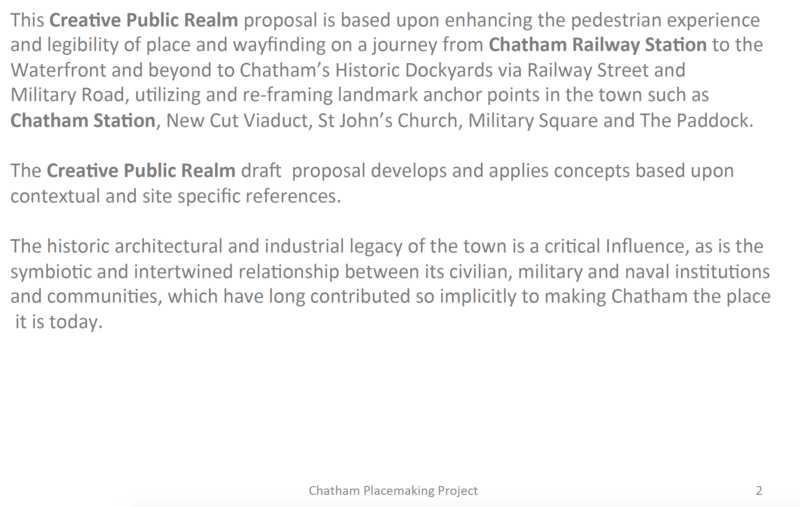 It is almost impossible to consider the historic and social fabric of Chatham without the Dockyard playing a major role. 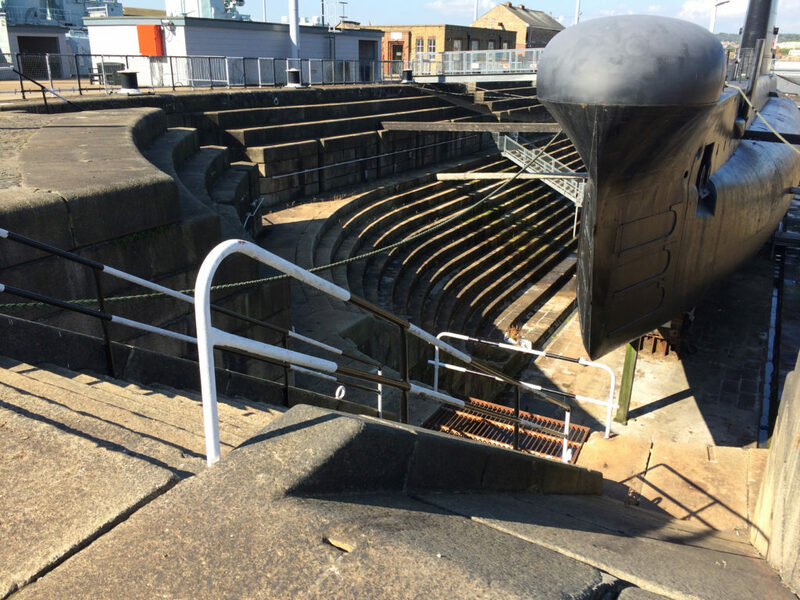 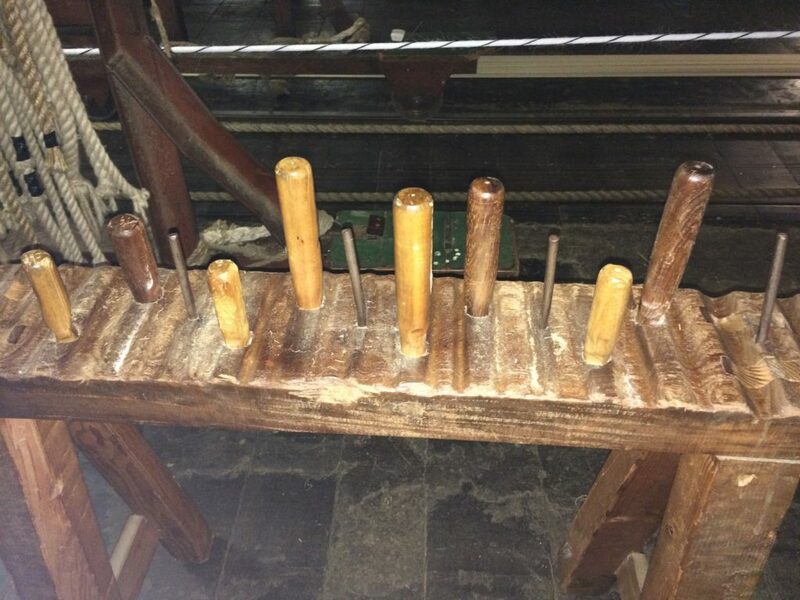 We have consulted with Nigel Howard, Historic Environment and Buildings Manager for the Dockyard throughout the project and have been granted access to their archives and buildings. 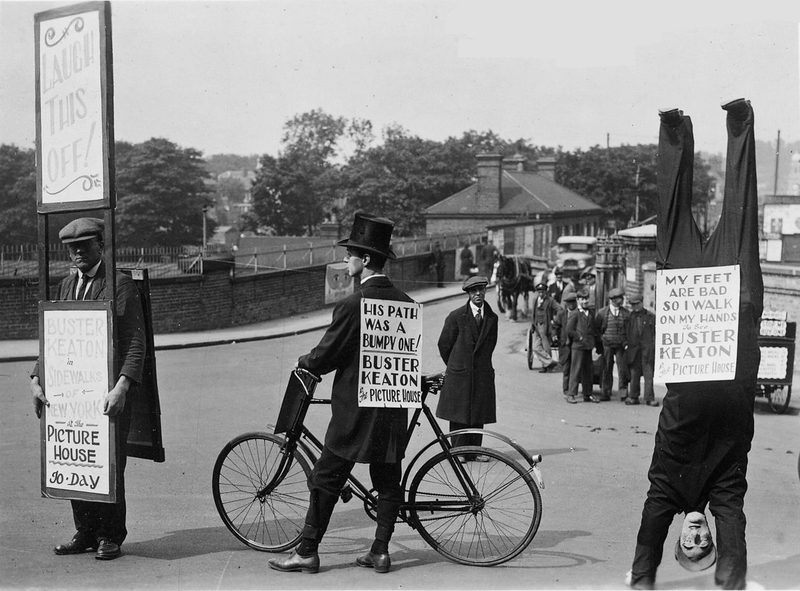 They have been very generous in their support. 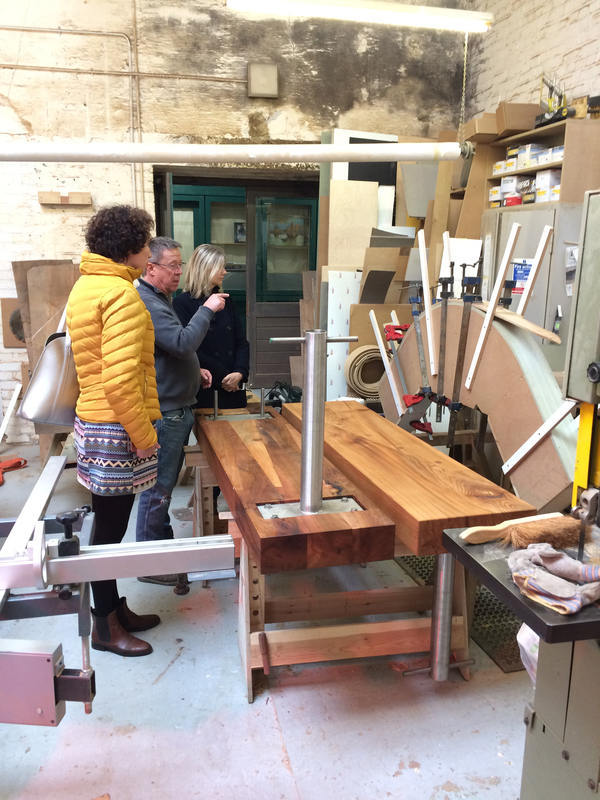 When Nigel was made aware we were proposing to work with Andrew on the project he made a very generous gift to the project of seasoned timber, free of charge from the historic Timber Seasoning Sheds. 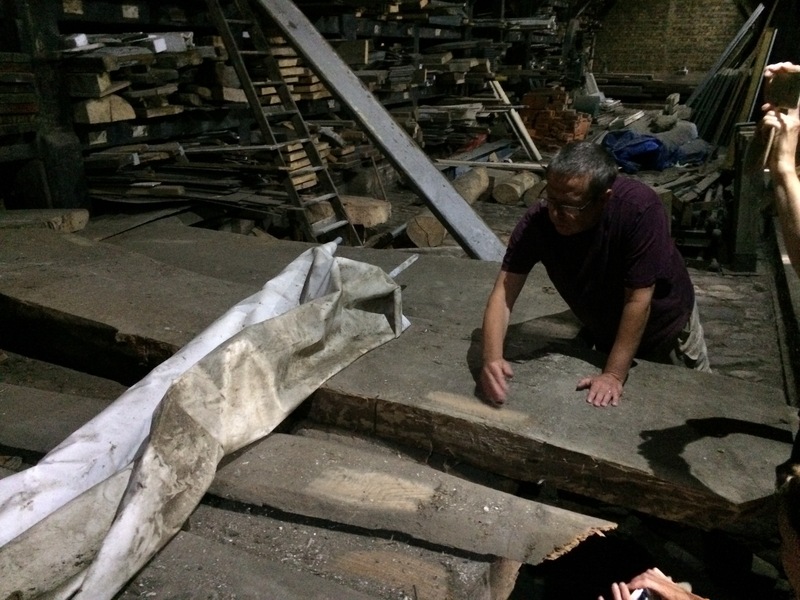 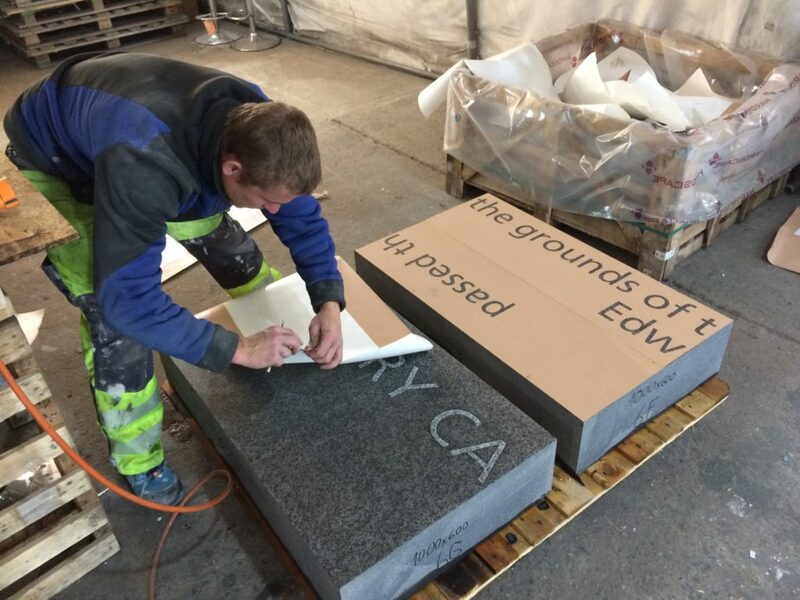 Nigel had also generously offered us some monolithic slabs of granite, which have great historic resonance to our project, which we have unfortunately not been in a position to use as yet – but never say never ! 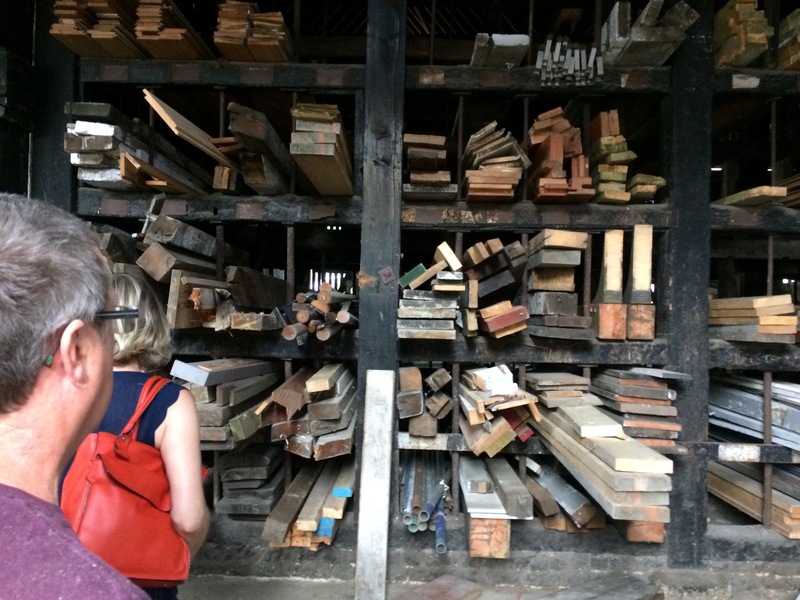 The quality of some of these images is poor I’m afraid, but the content is pretty amazing…the interiors of the seasoning sheds have an otherworldly feel about them. These buildings were erected in 1775, to provide the Admiralty with at least 3 years of timber. 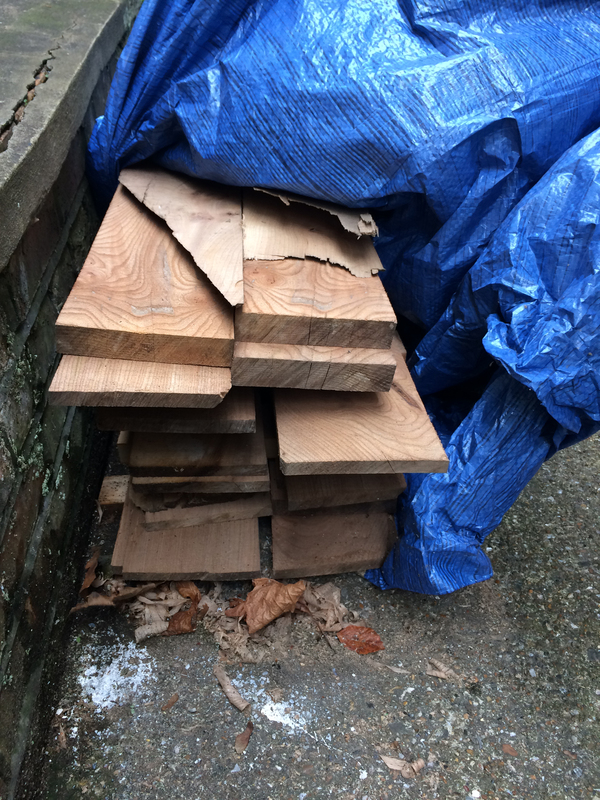 Andrew unearthed some massive planks of English Elm. 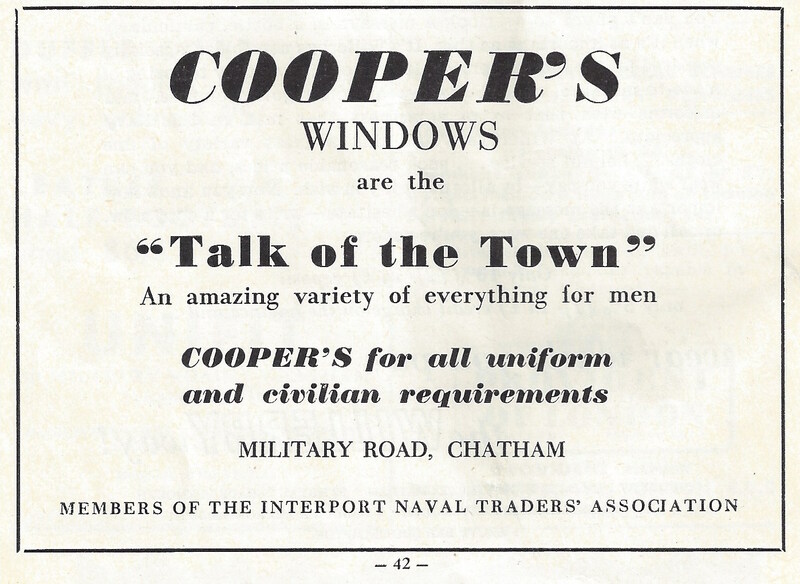 The age of the timber was hard to discern. 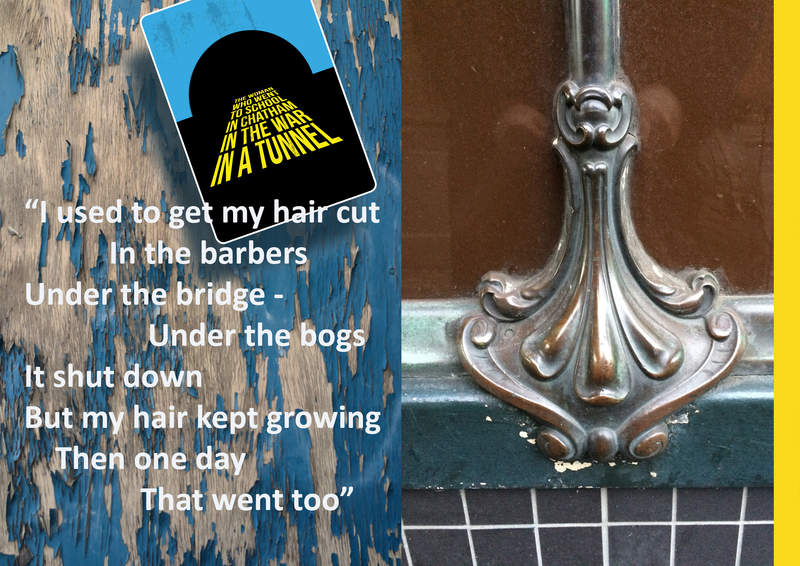 Andrew thinks it may have been here for decades as least. 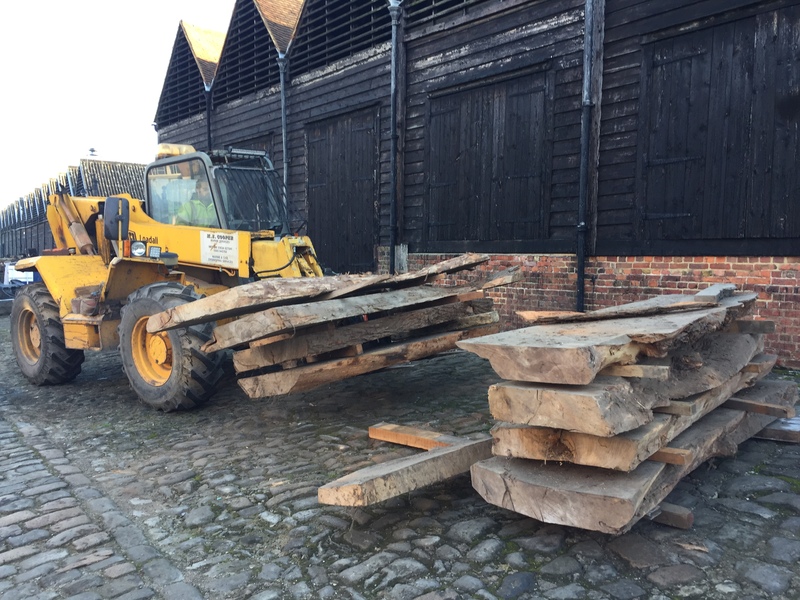 The actual tree or trees they were cut or salvaged from could have been well over a century old before felling or being toppled through the effects of storm damage. 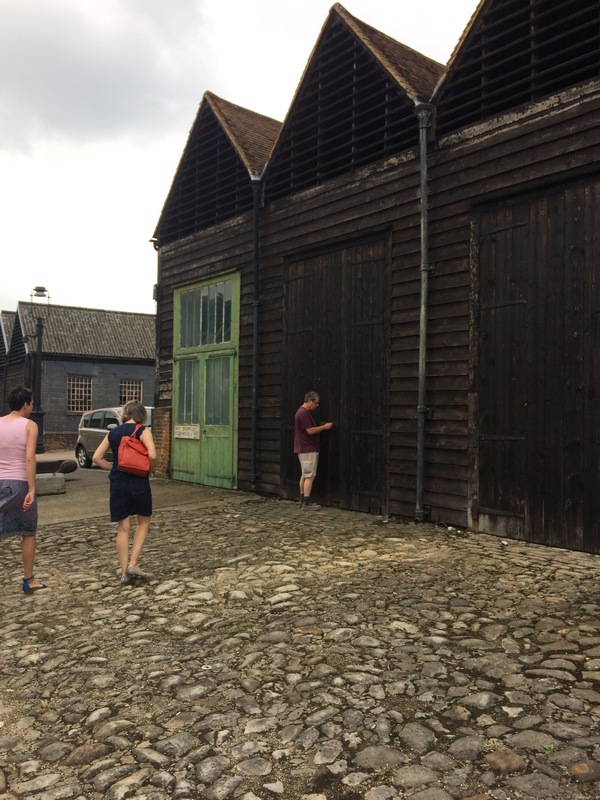 Timber Stores, Historic Dockyard Chatham, July 2017. 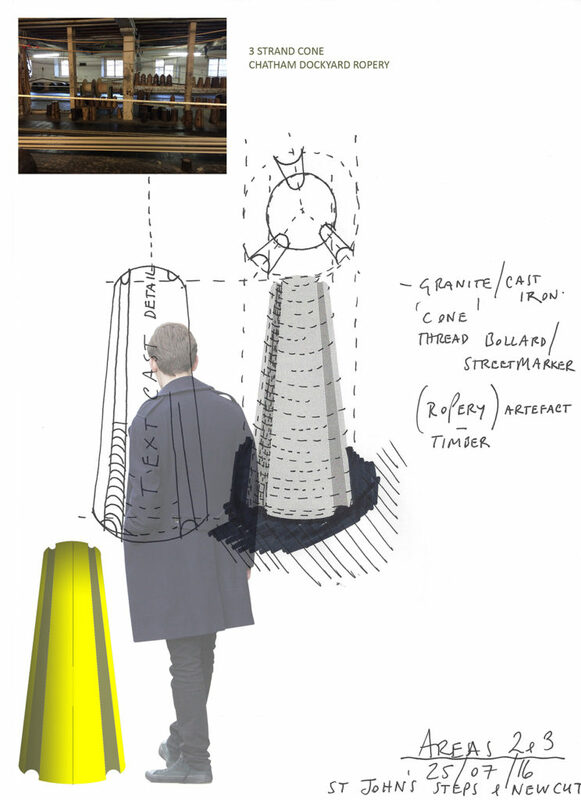 Image: Andrew Lapthorn. 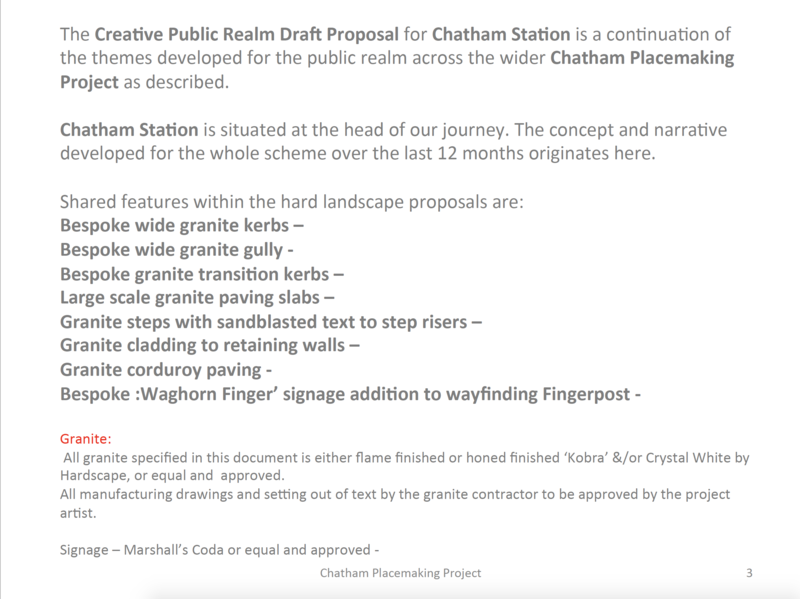 As with all creative proposals, we have been through various iterations, responded to challenges and made changes along the way. 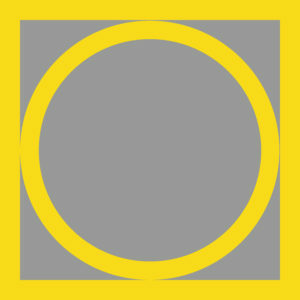 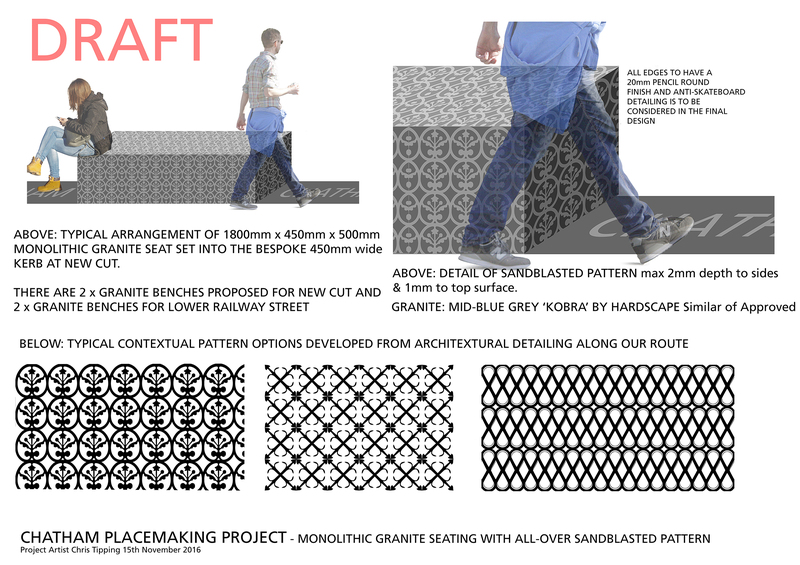 The following images relate to this design and creative process and show the evolution of the work and some of the outcomes on the street. 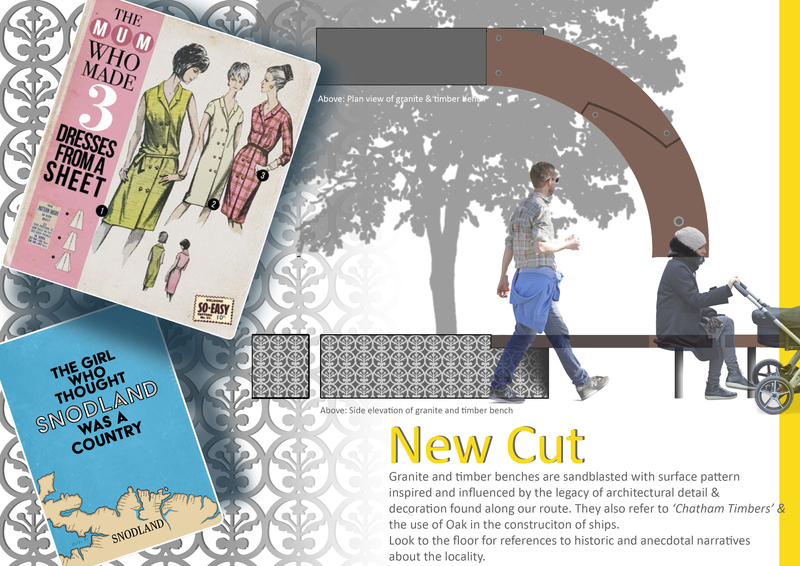 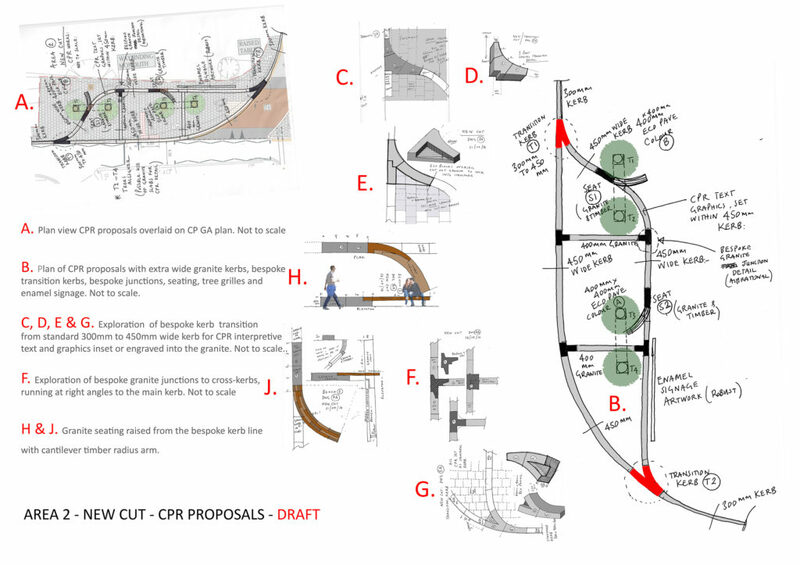 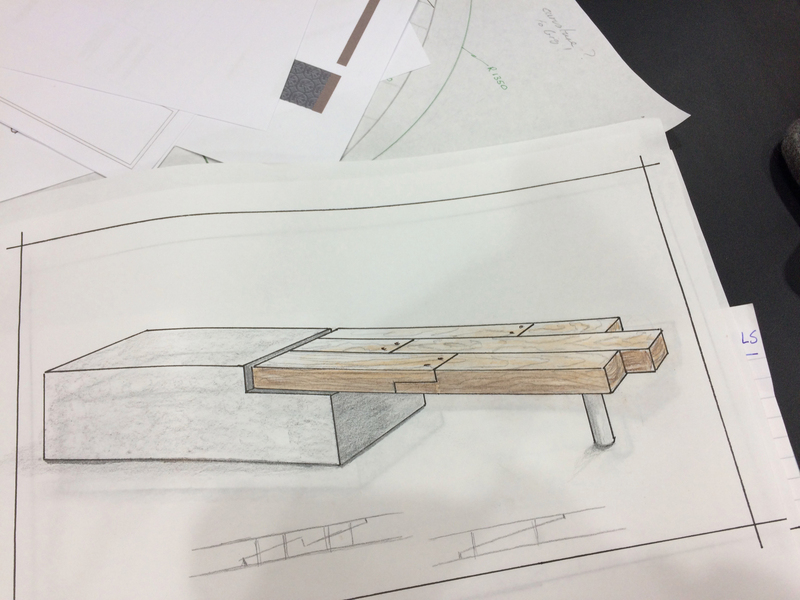 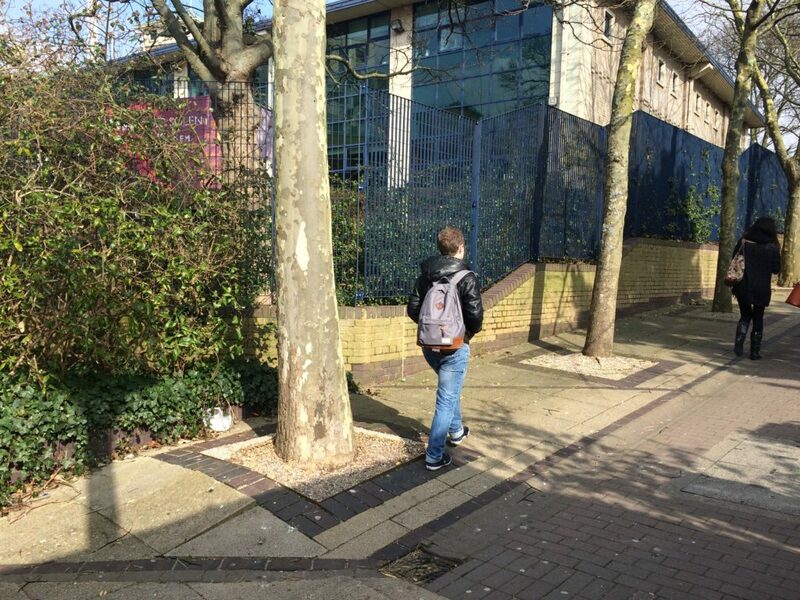 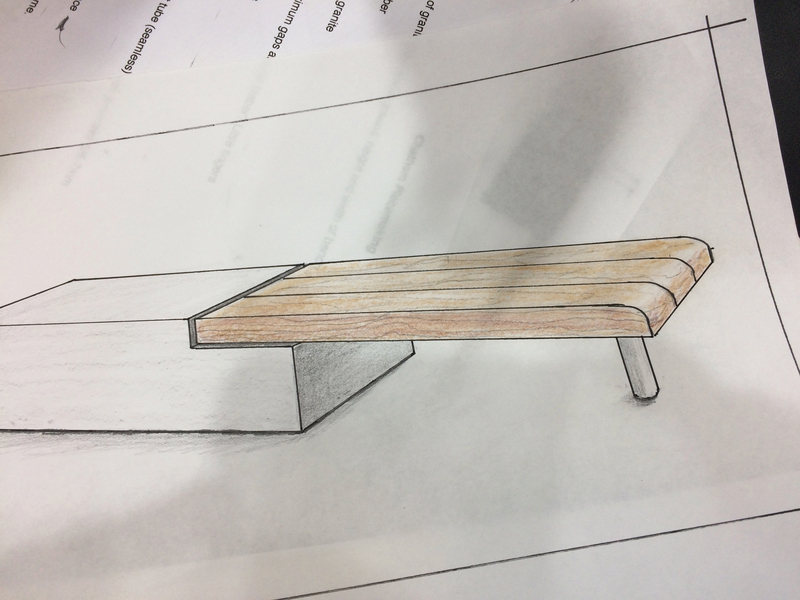 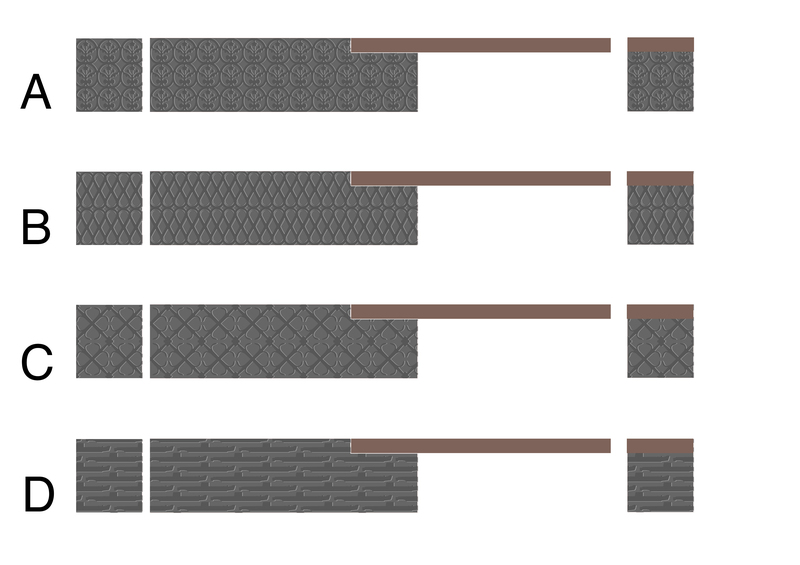 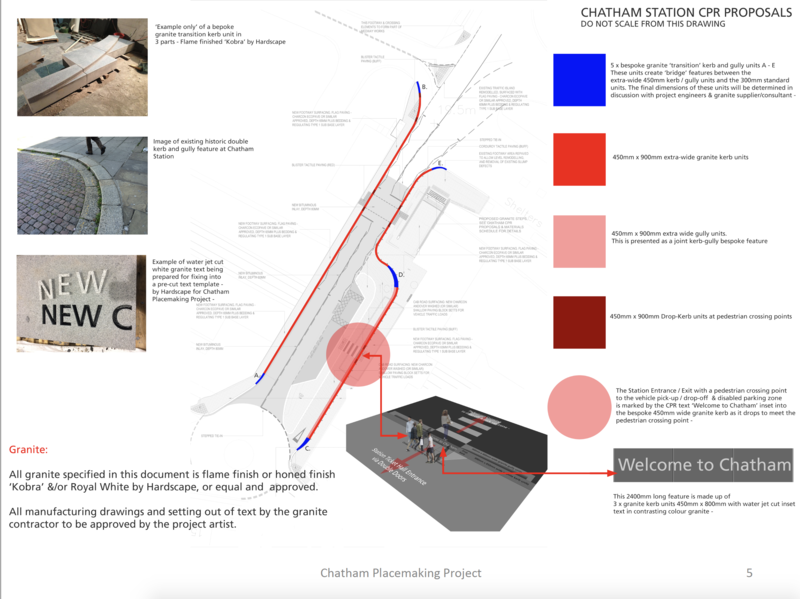 In 2016, during the early concept and development stages of the project, I had proposed this series of benches as a way of exploring the relationship between the significant building materials of the Historic Dockyard and the materials and contextual ideas being explored along out project route through Chatham Town. 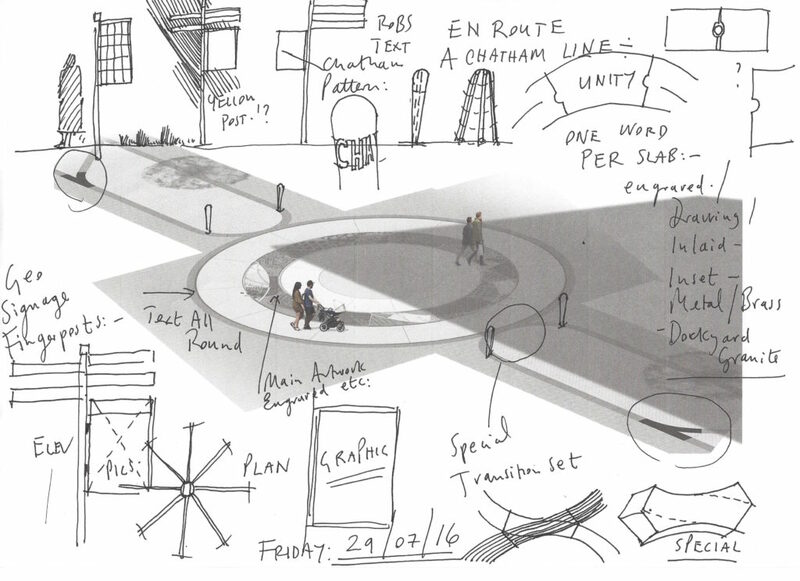 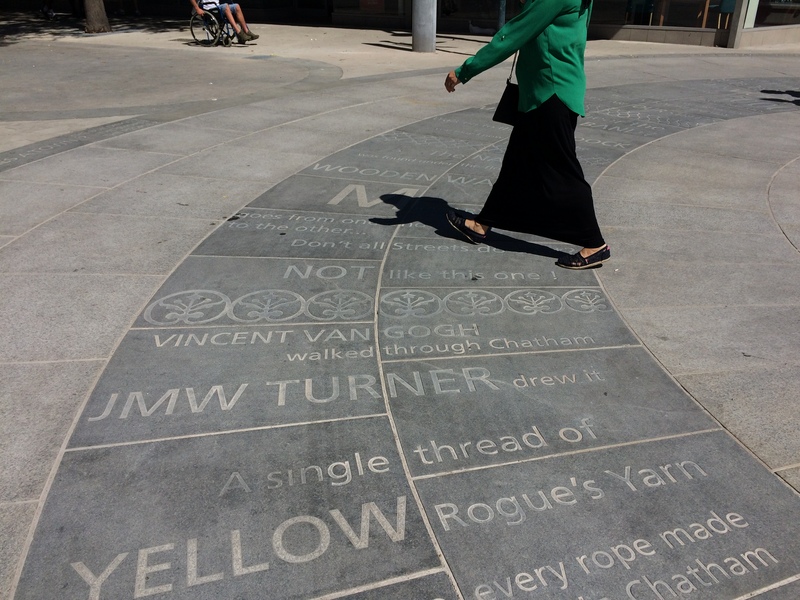 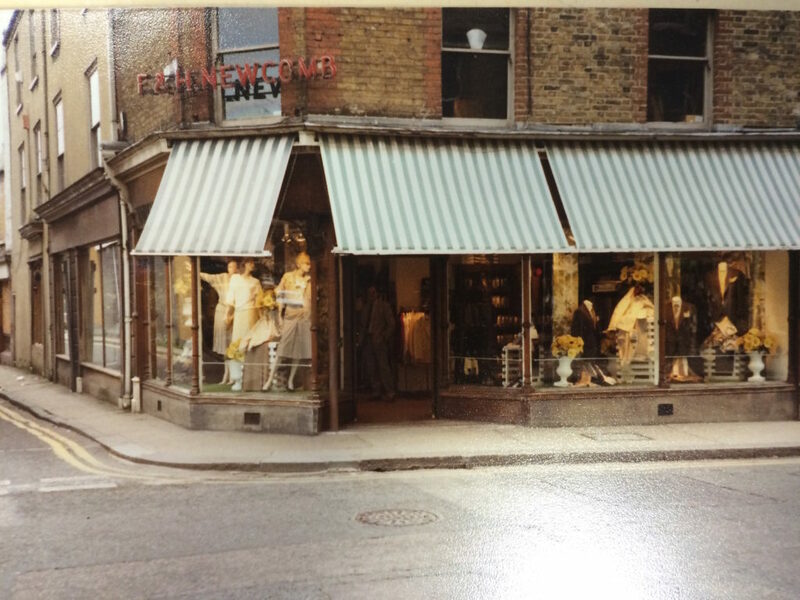 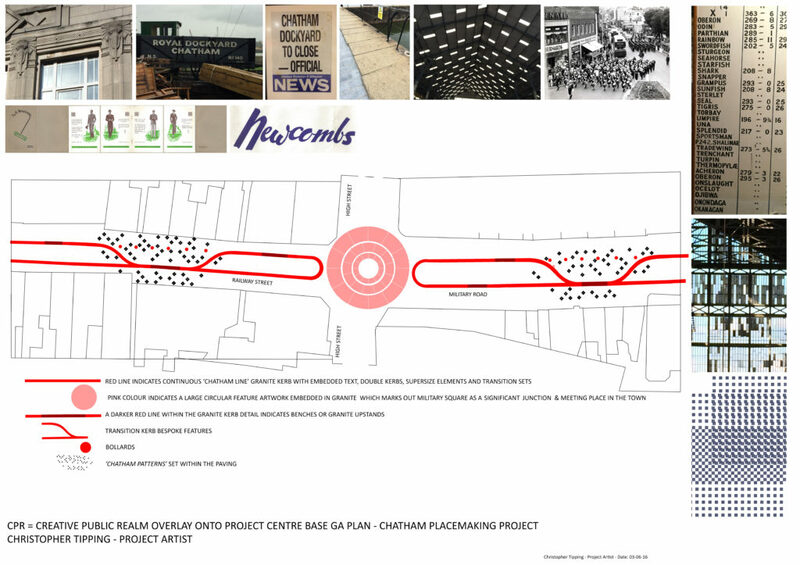 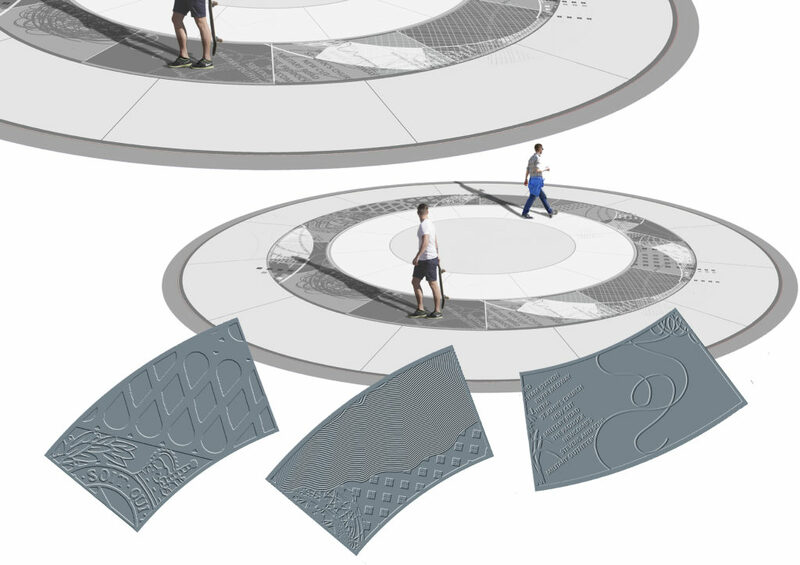 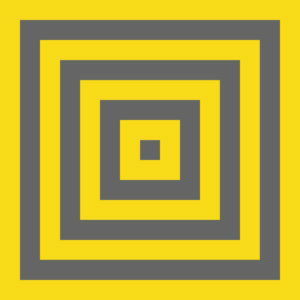 The Chatham Patterns were a significant part of our concept to develop a distinct and site specific visual language for the streetscape and our creative public realm work. 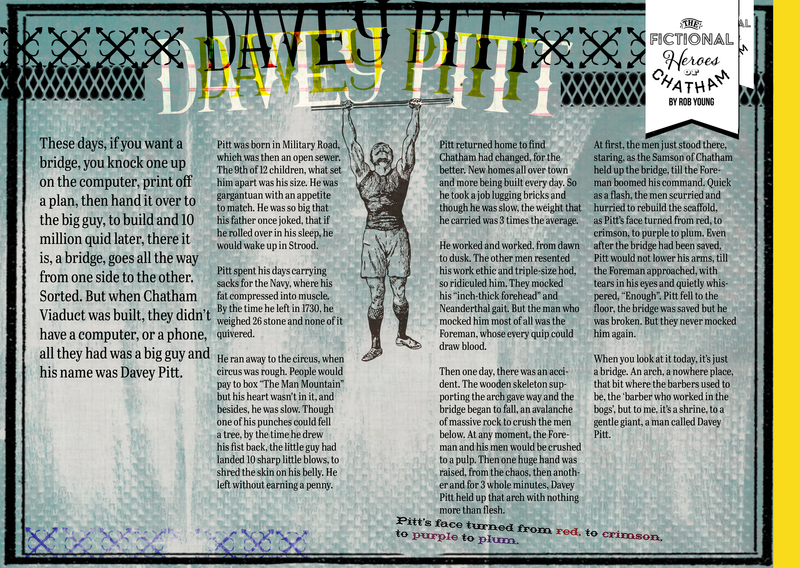 I collaborated with Xtina Lamb, Printmaker on this work. 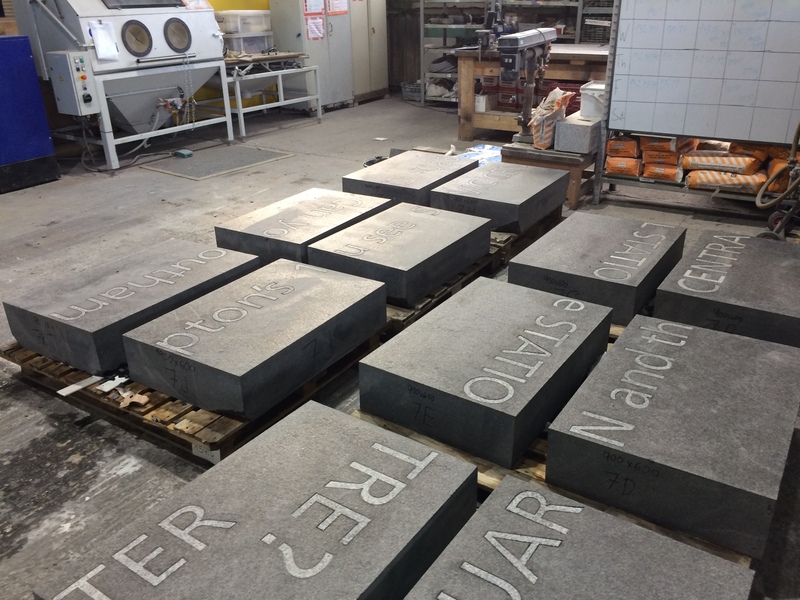 In this instance, the patterns were to be sandblasted into the honed surface of the monolithic granite blocks by Hardscape. 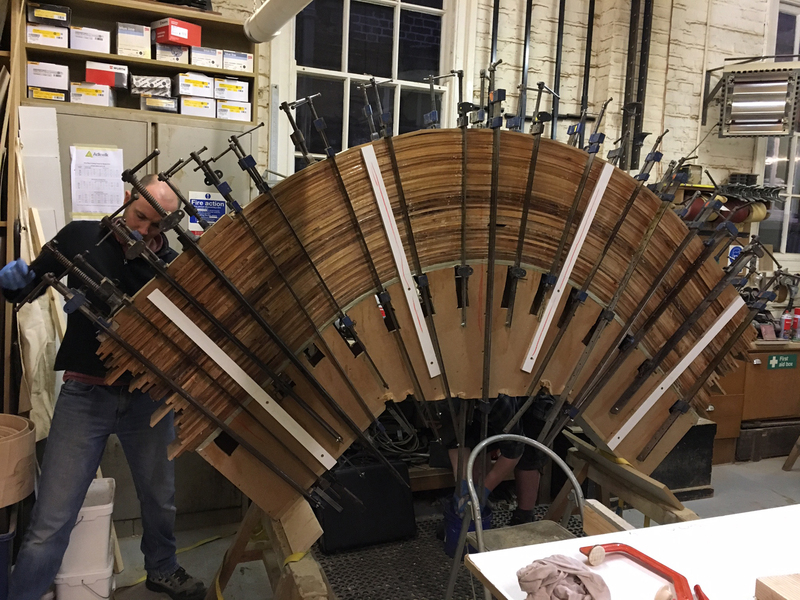 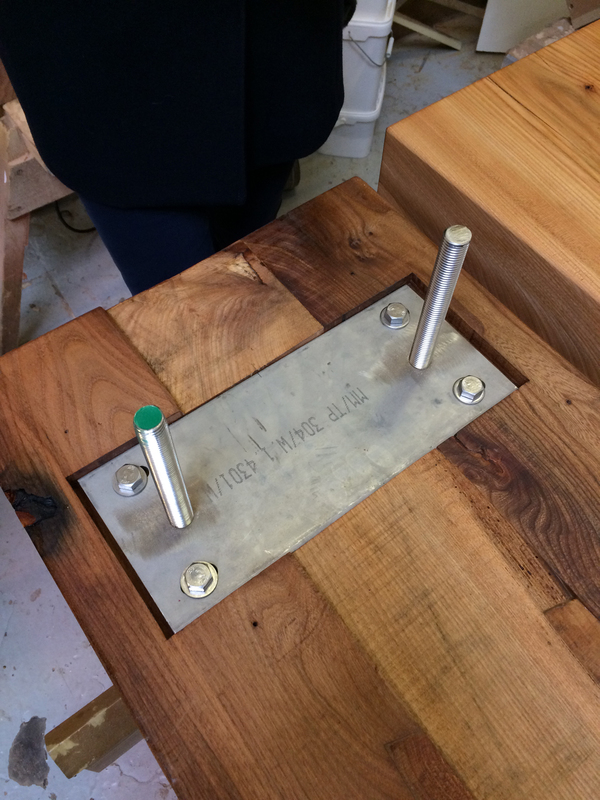 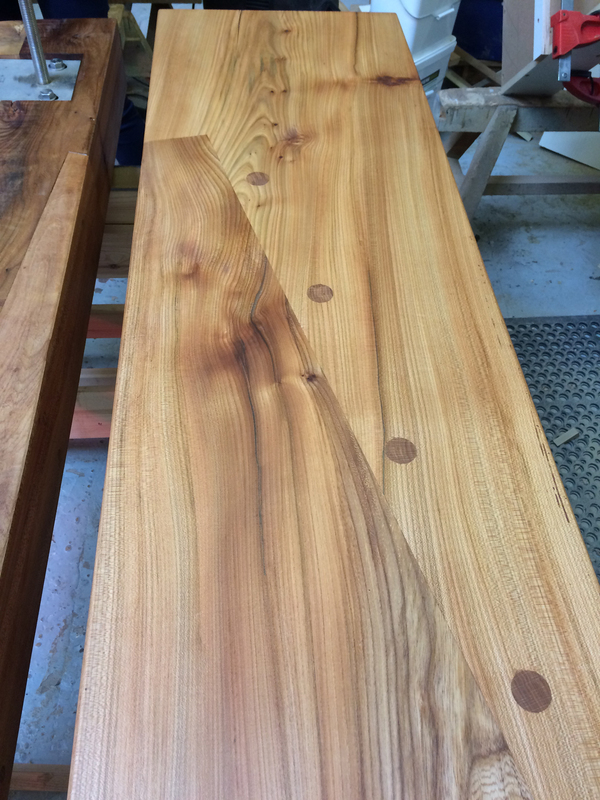 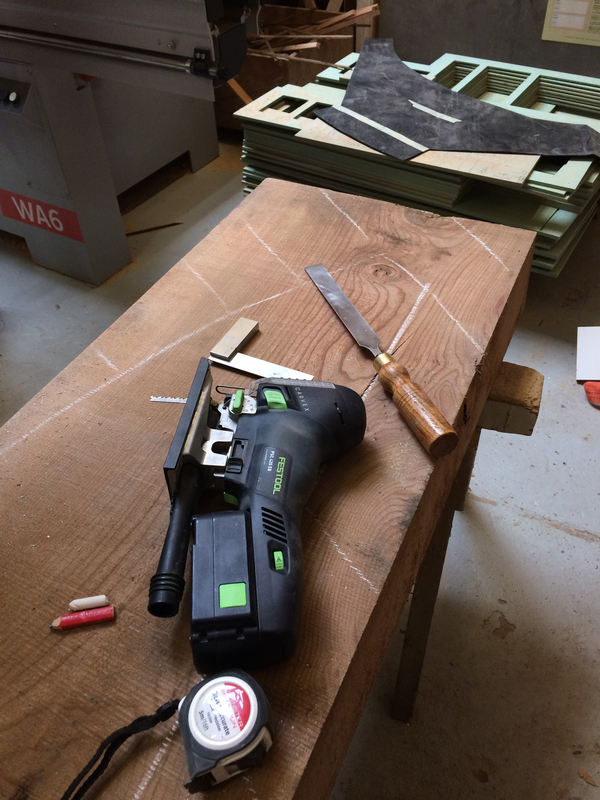 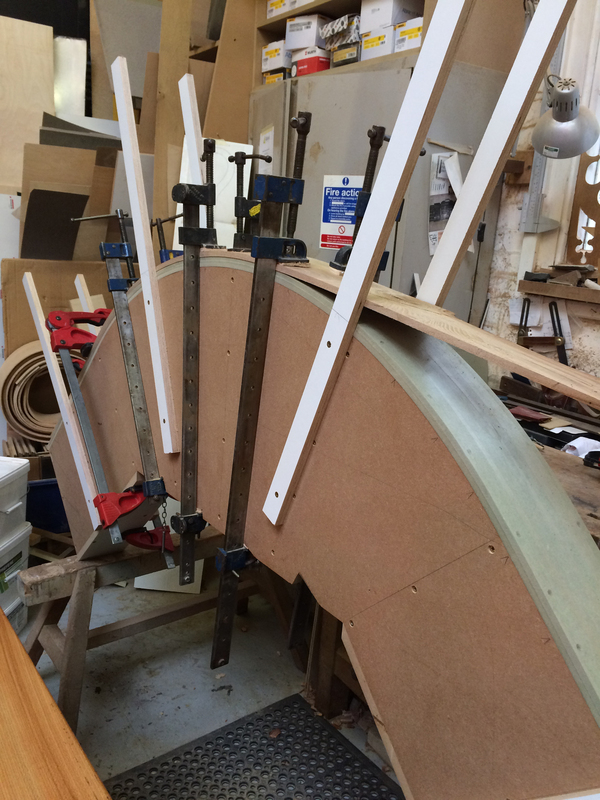 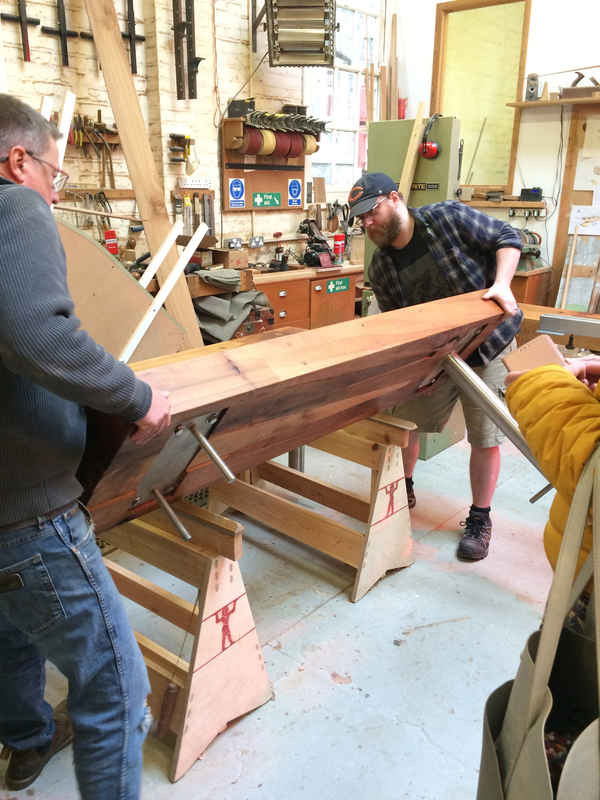 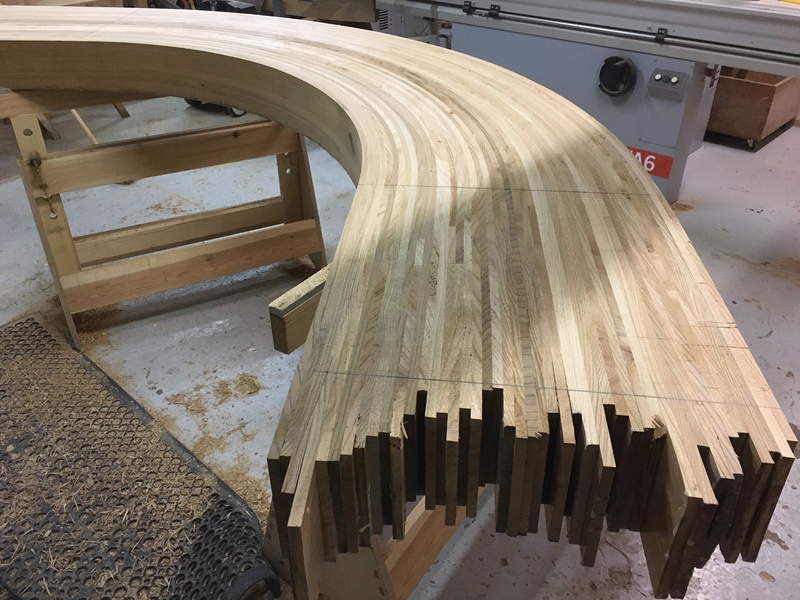 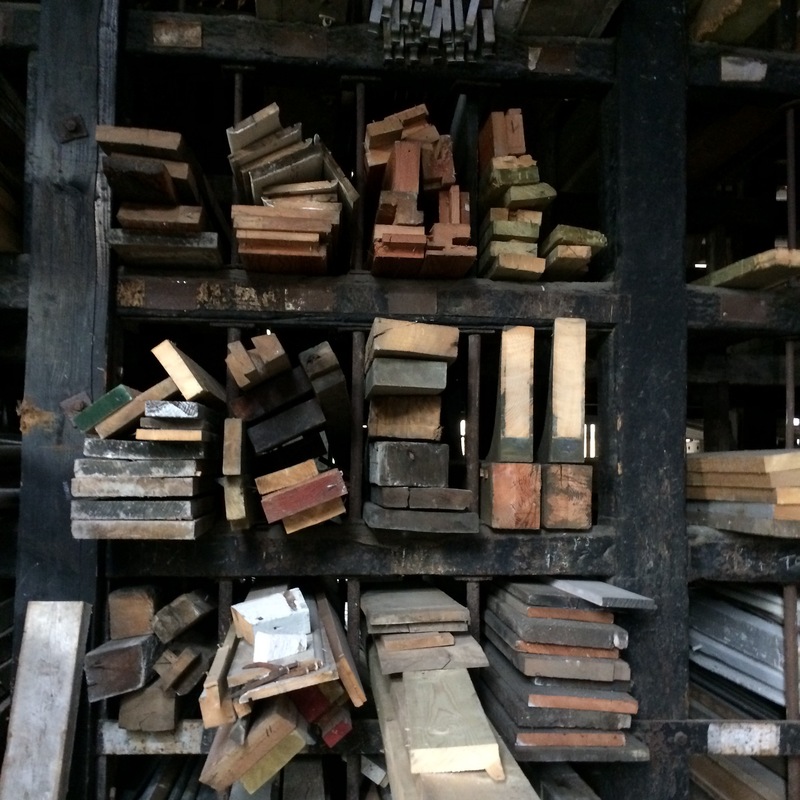 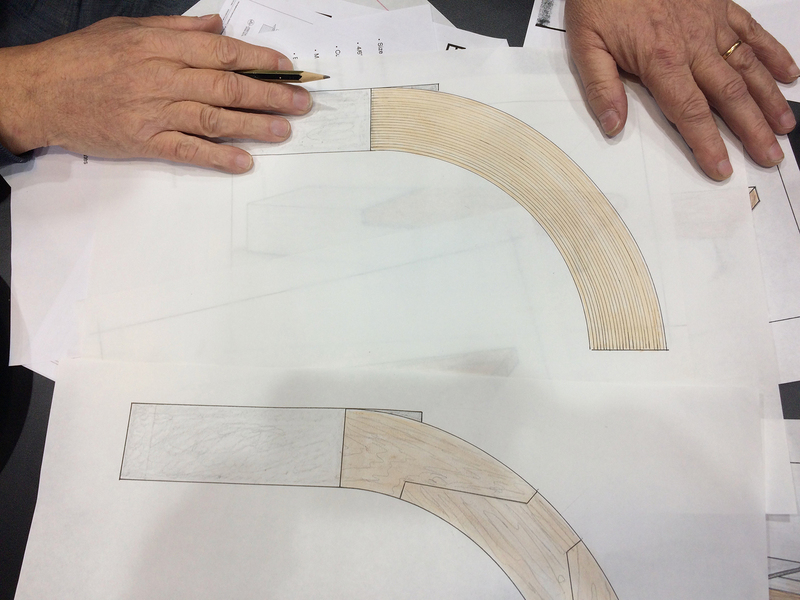 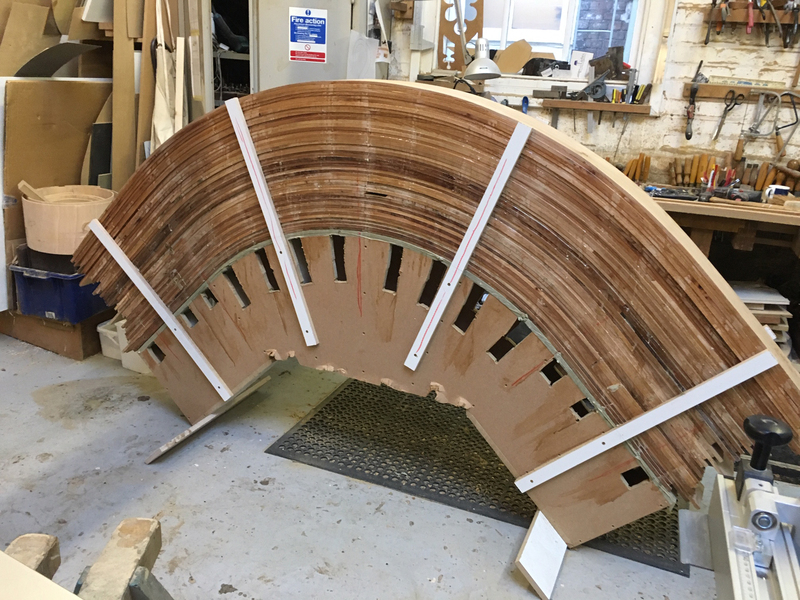 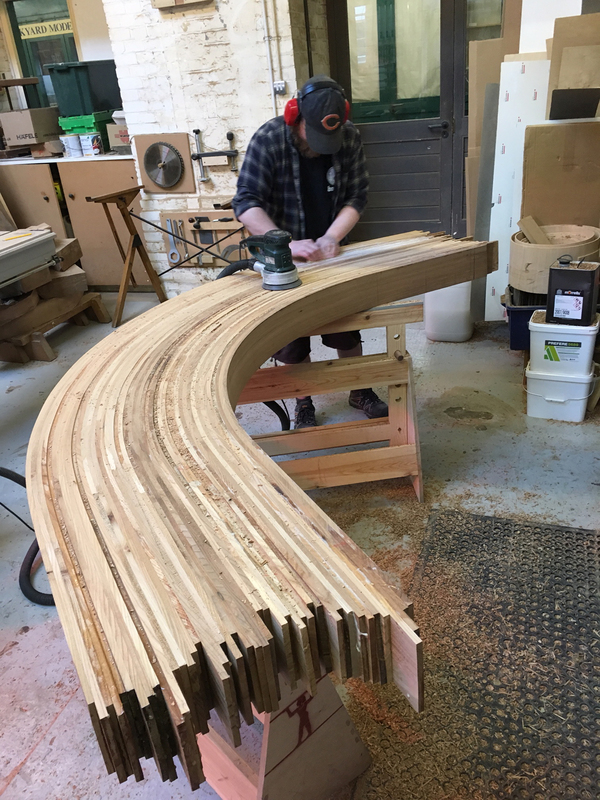 In early November 2018, FrancisKnight and I visited Andrew at his workshop to see progress on the benches. 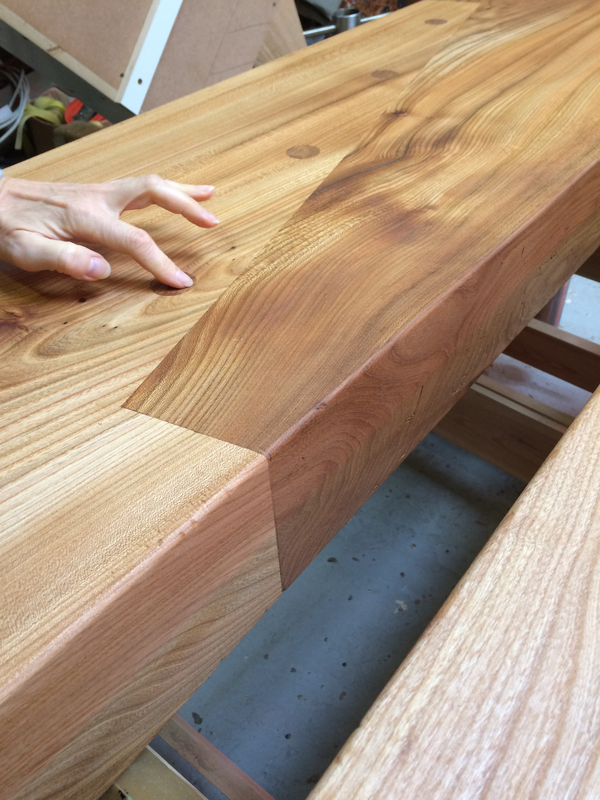 I was blown away by the beauty and craftsmanship around me. 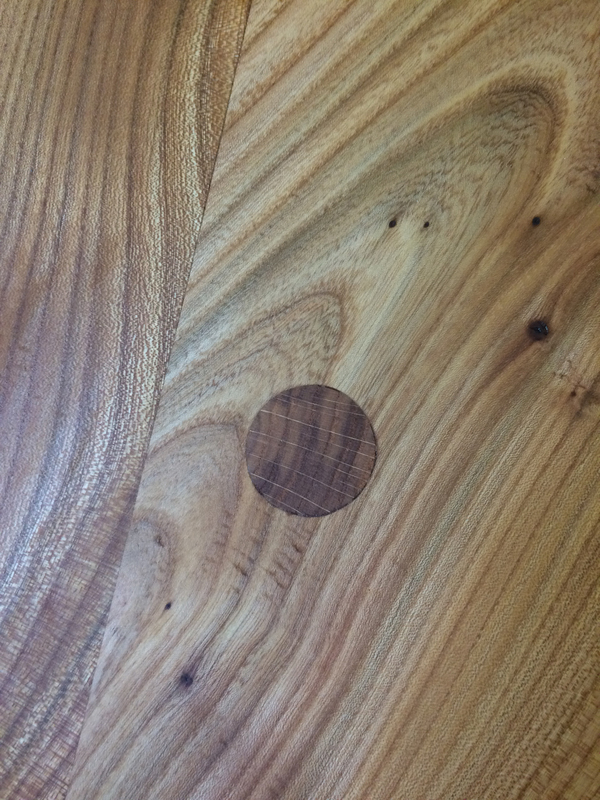 The English Elm has the most wonderful patterns and figures in the grain. 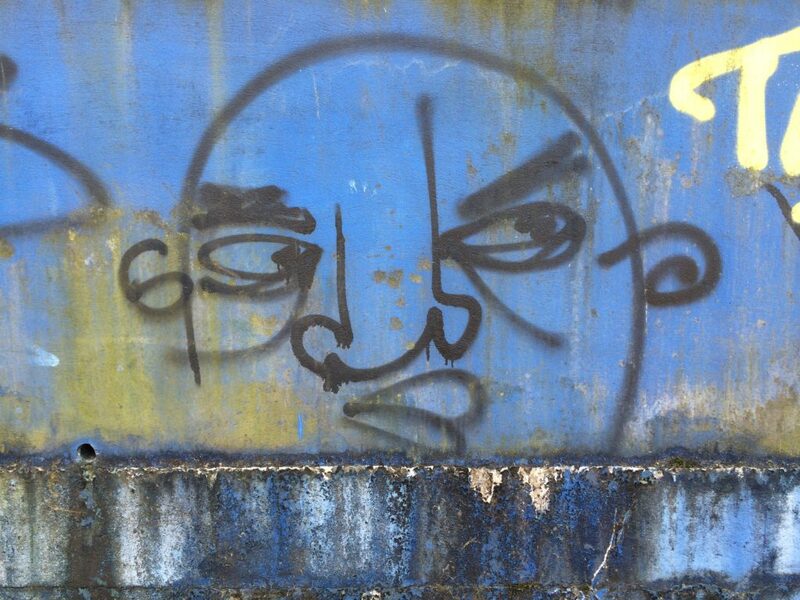 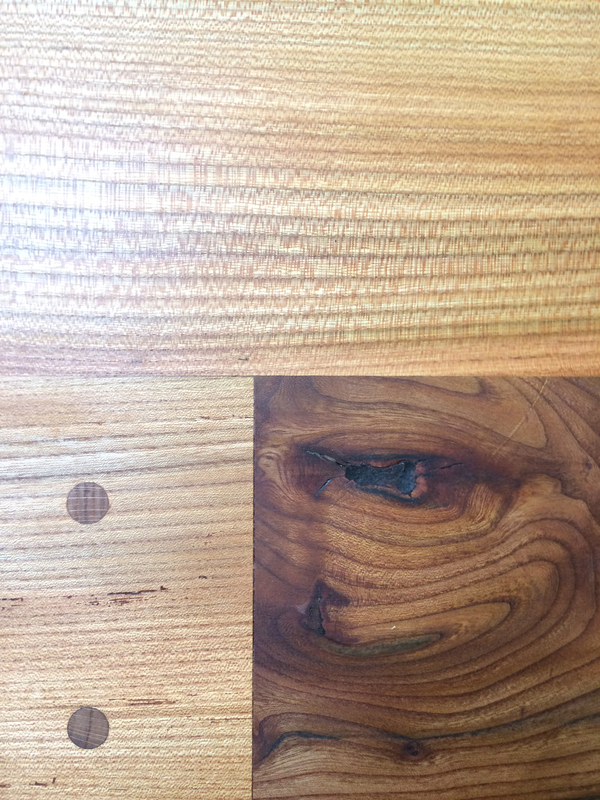 There was even half a face staring our at me. 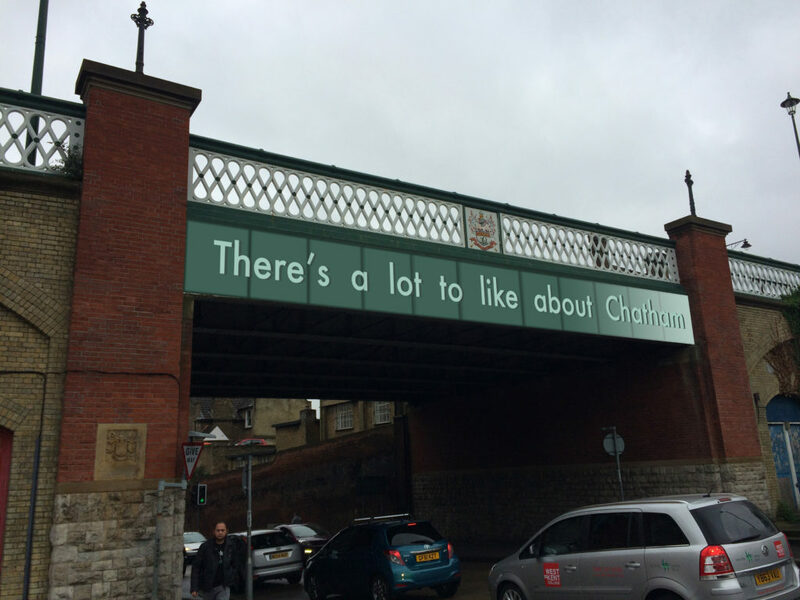 We were really so impressed. 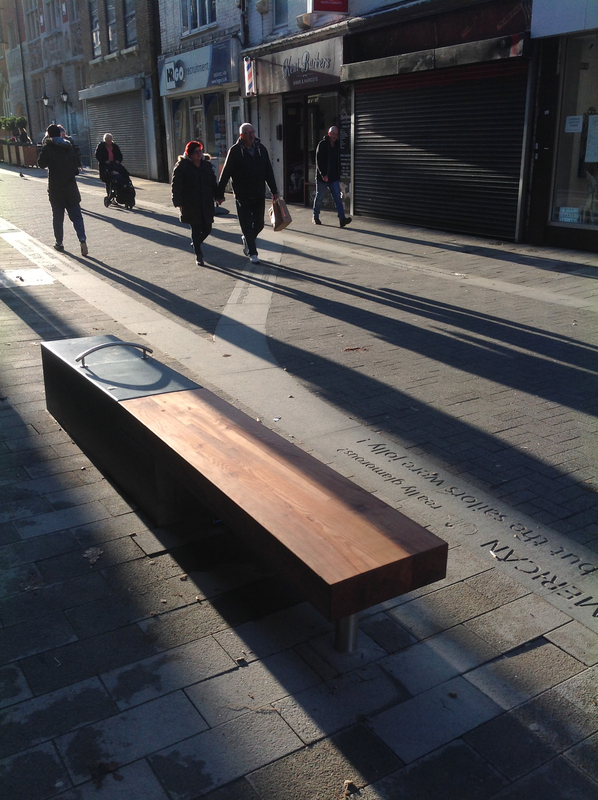 The work was solid, beautiful, resonant and robust, which is just as well as life as a street bench is tough ! 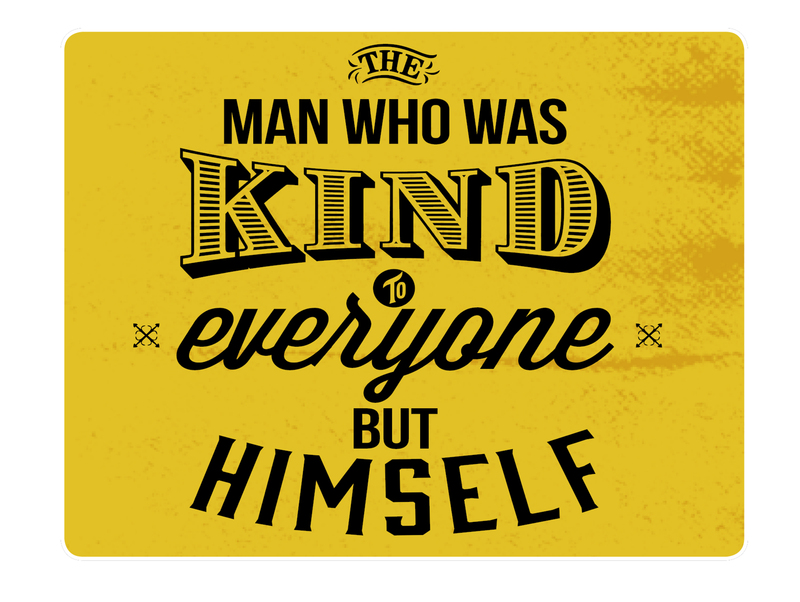 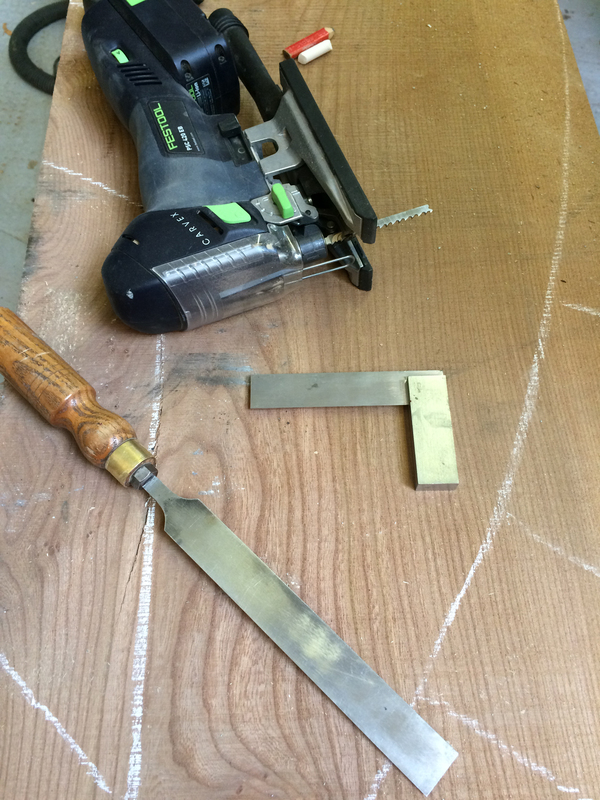 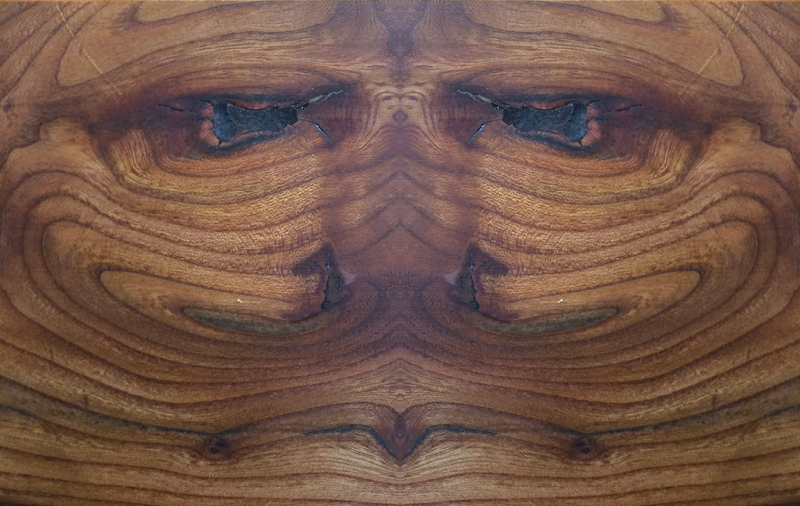 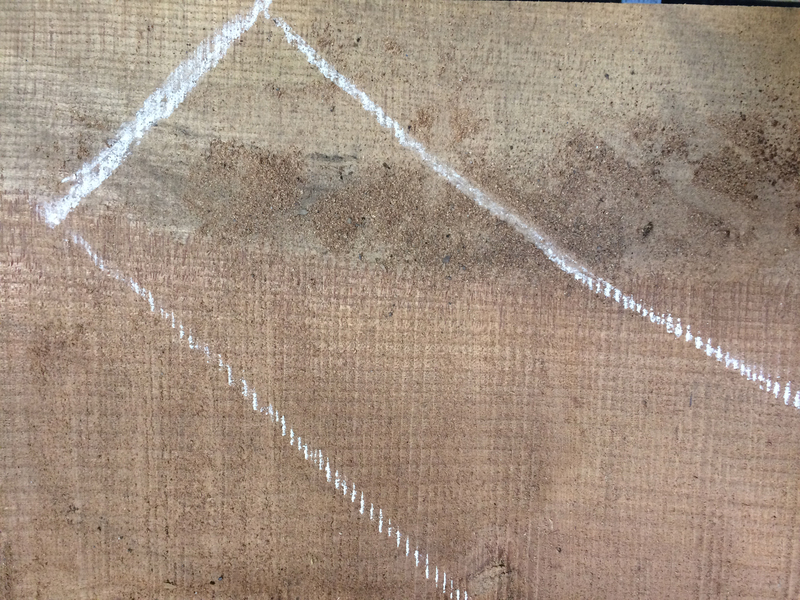 I couldn’t resist creating a mirror image – a portrait in English Elm. 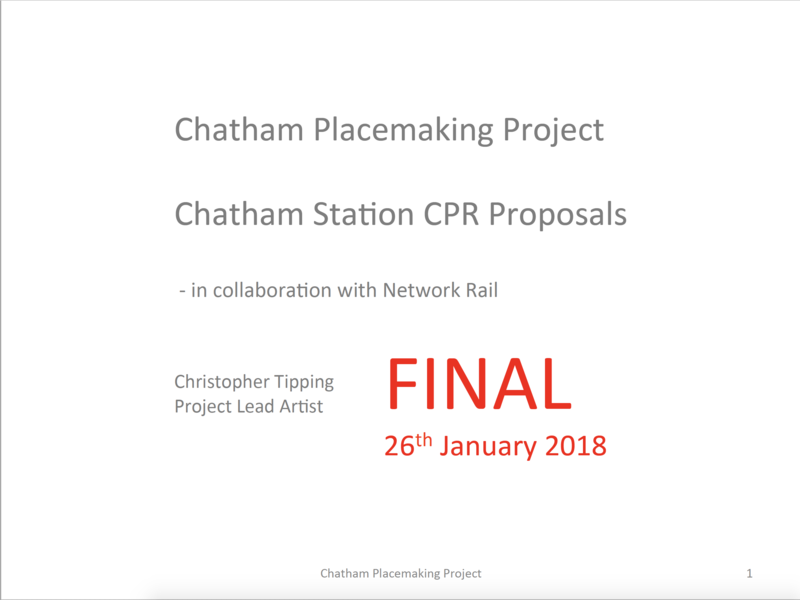 This was great news to see this project being promoted on Linkedin this week by Medway Council. 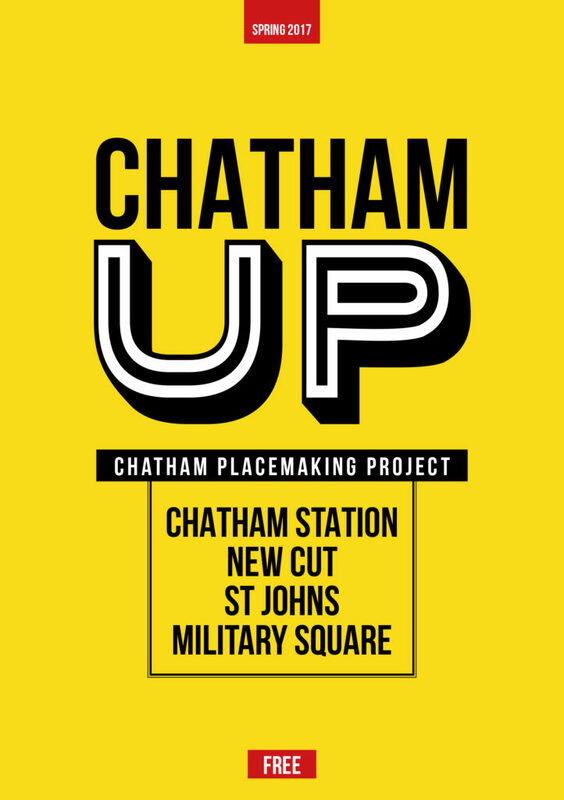 Following the near completion of public realm works and embedded public art along Railway Street and Military Road, including New Cut, St John’s Steps and Military Square, Chatham Railway Station is now about to undergo its long awaited regeneration too, at the head of our works as part of the Chatham Placemaking Project. 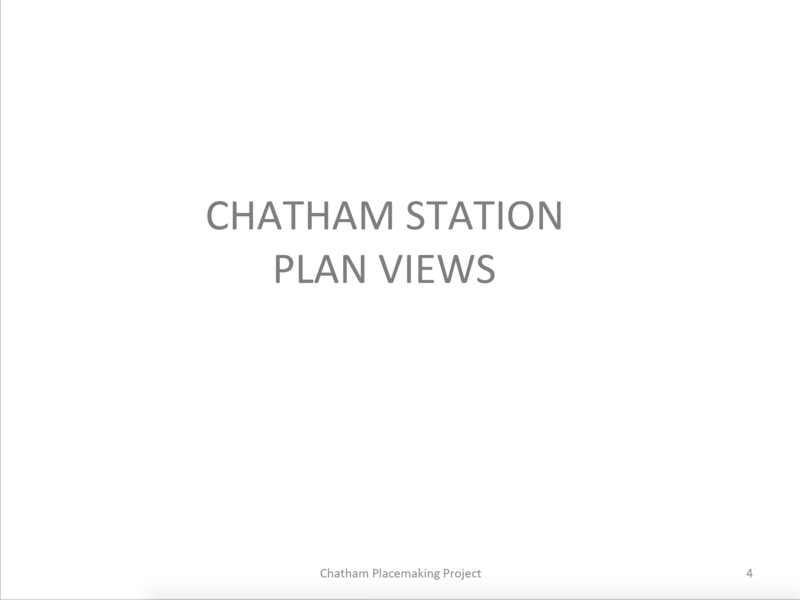 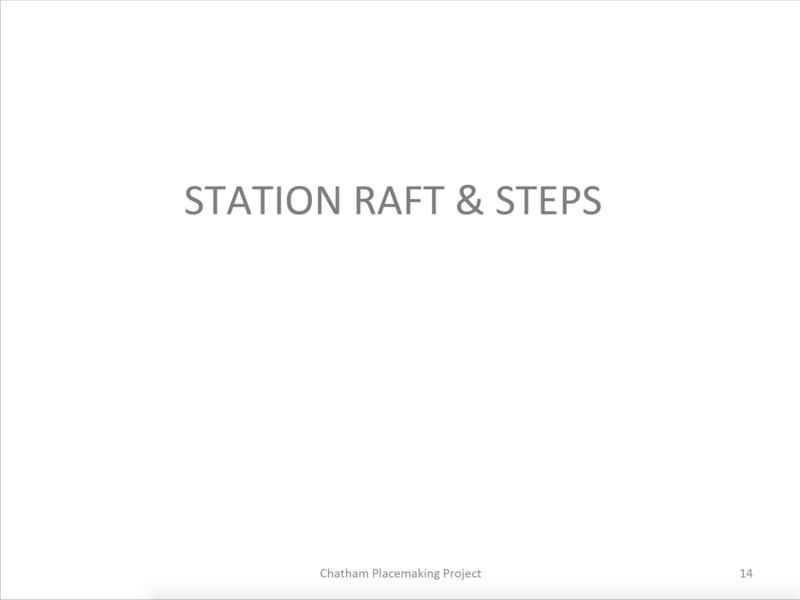 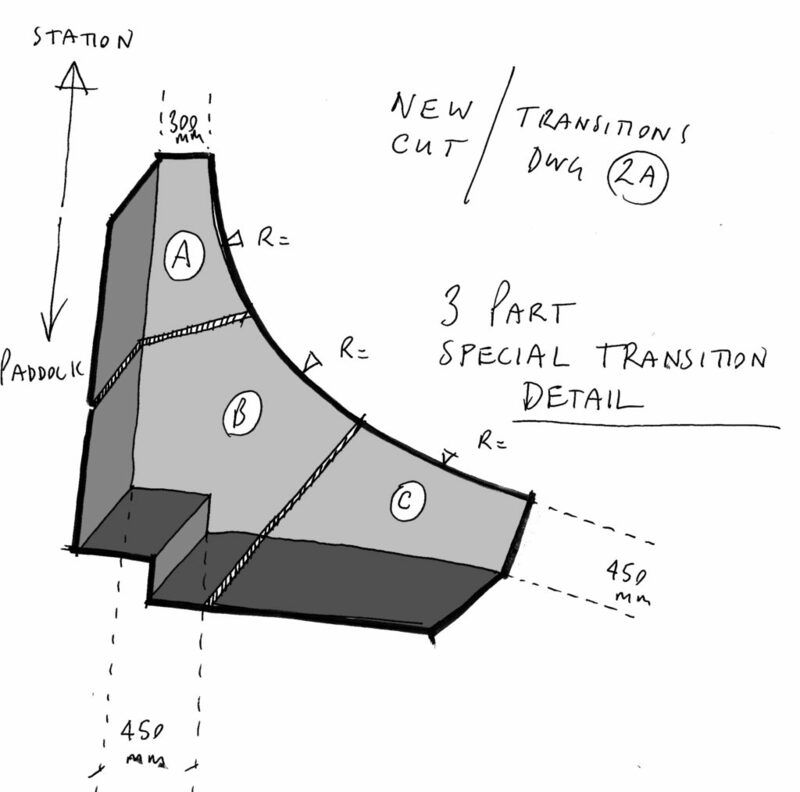 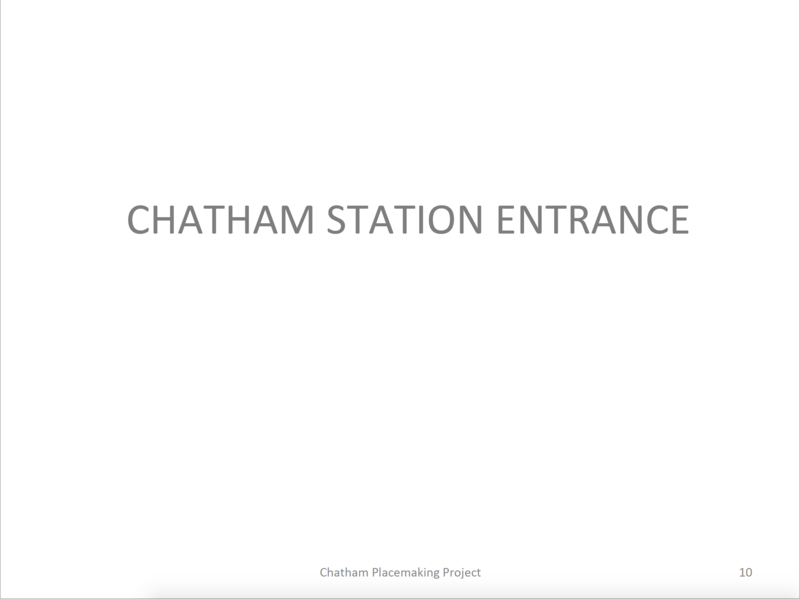 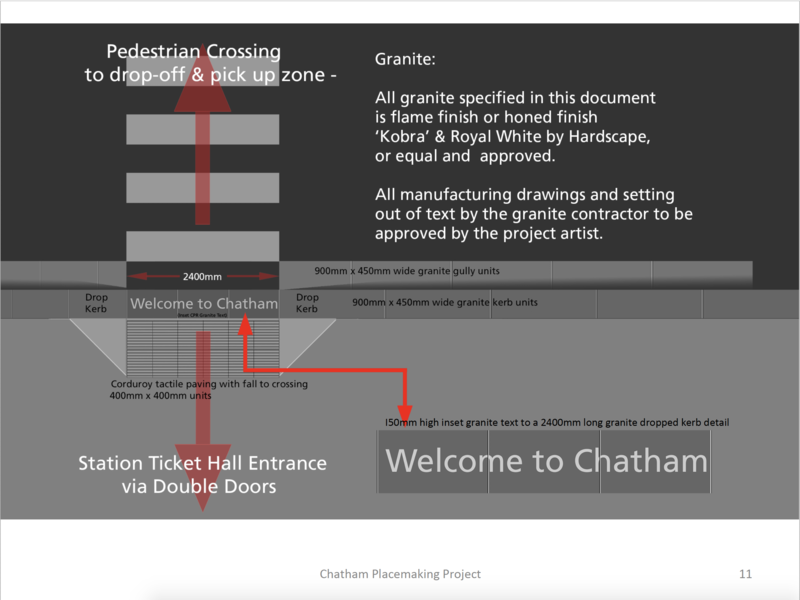 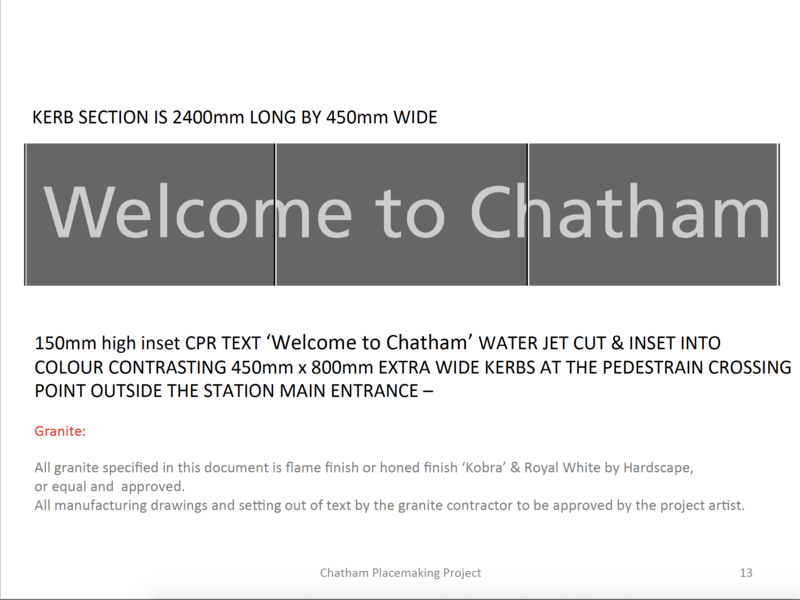 I made one of the first posts about Chatham Station on this blog back in September 2015 in the very early stages of our research and contextual work on the project. 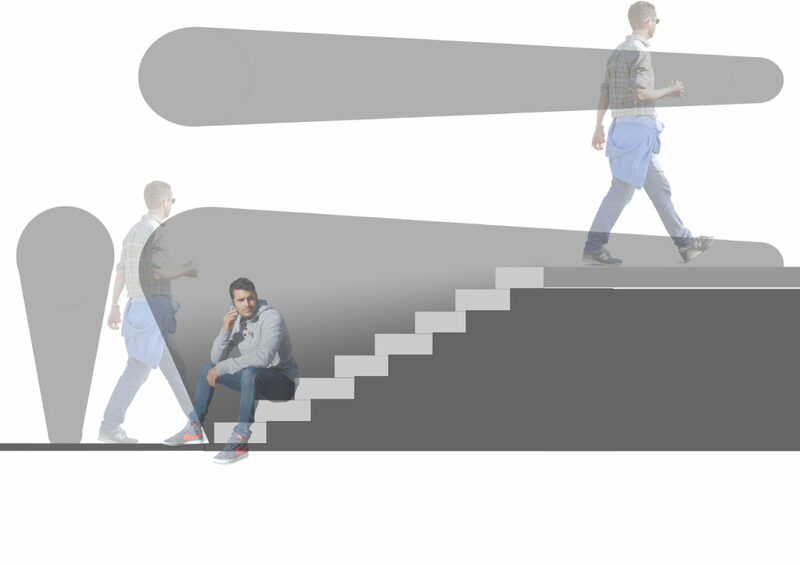 Click on this link for more information. 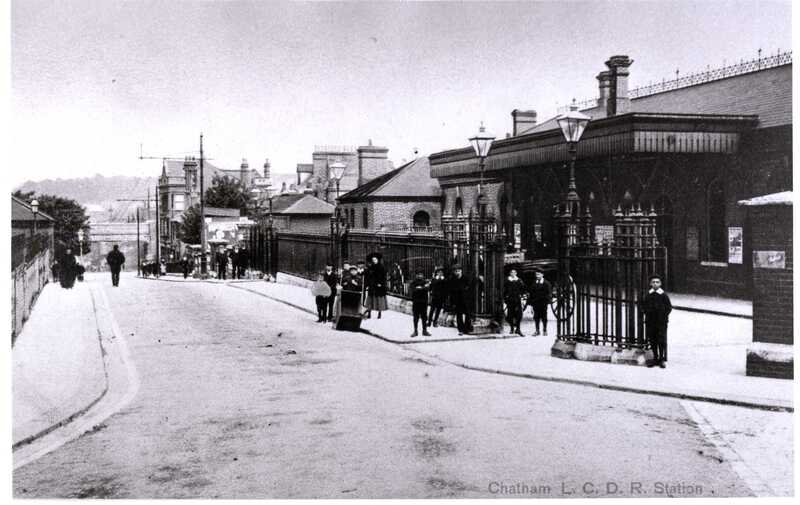 Chatham Railway Station – Date unknown. 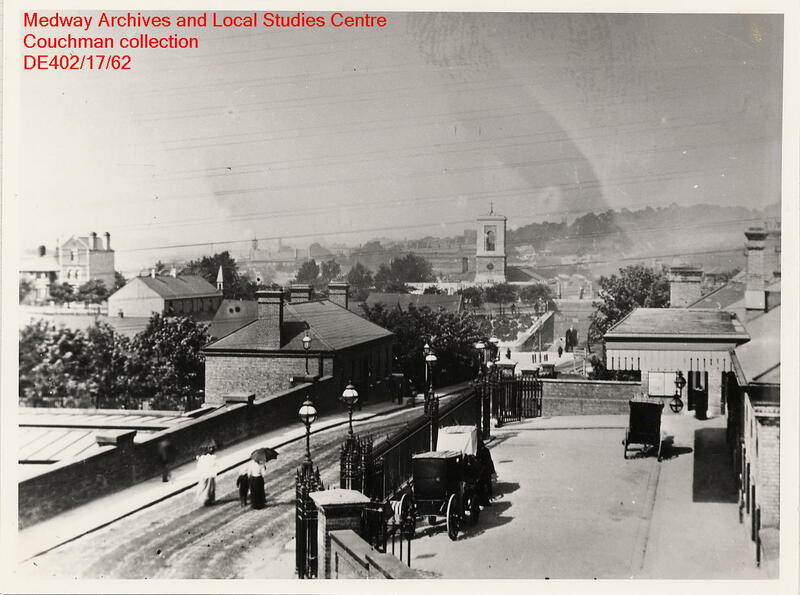 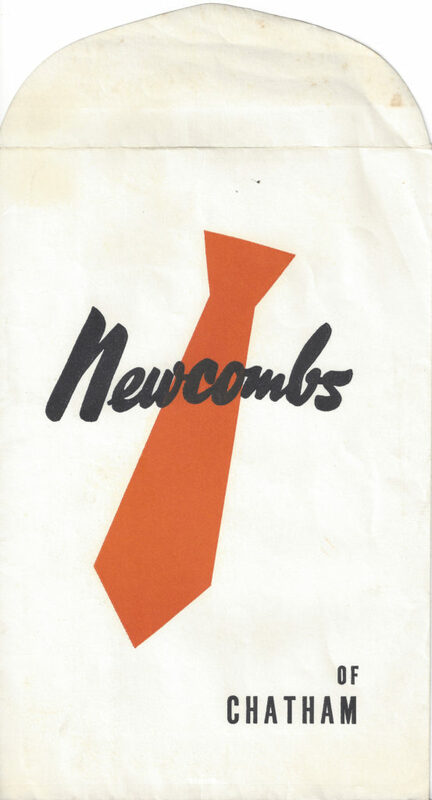 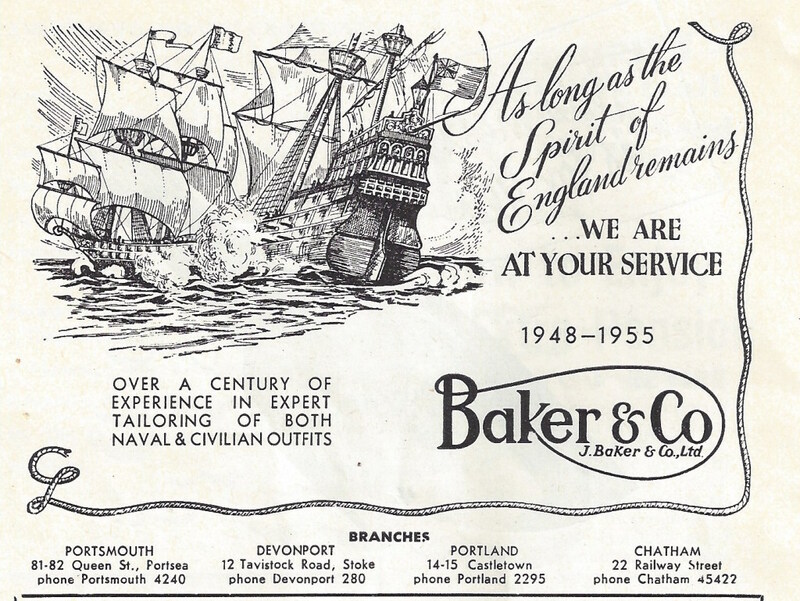 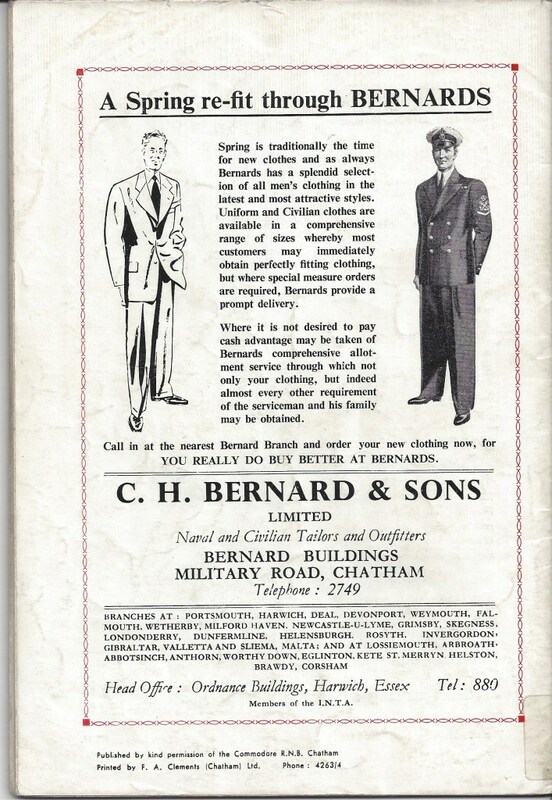 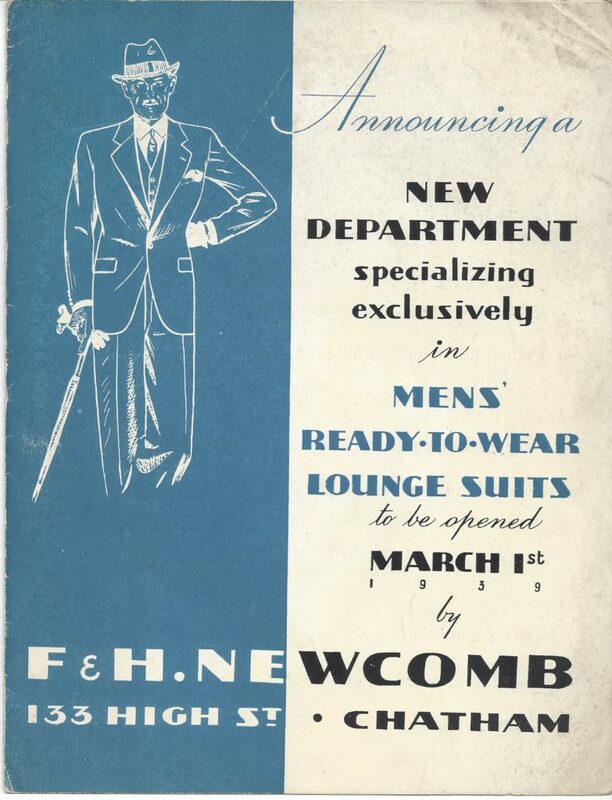 Image: Copyright and by kind permission of Medway Archives and Local Studies Centre – Couchman Collection. 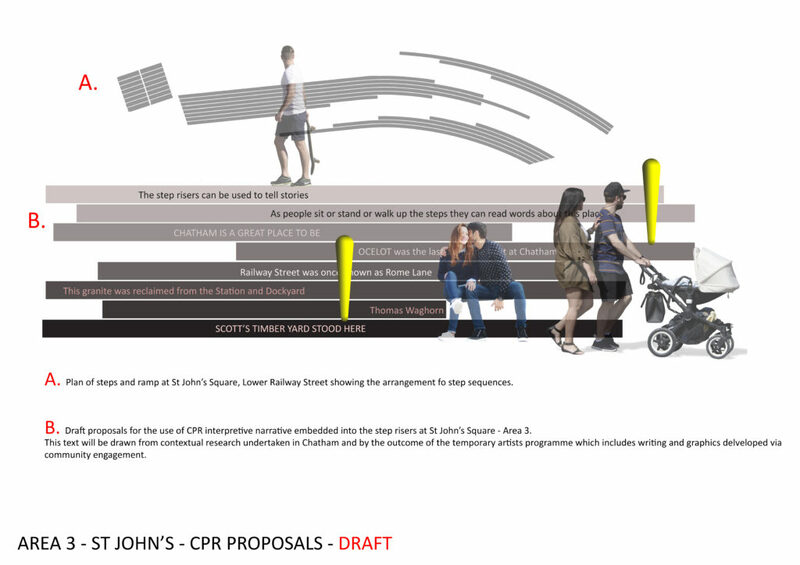 Many draft proposals and developments of conceptual and contextually based responses to the site were developed and considered. 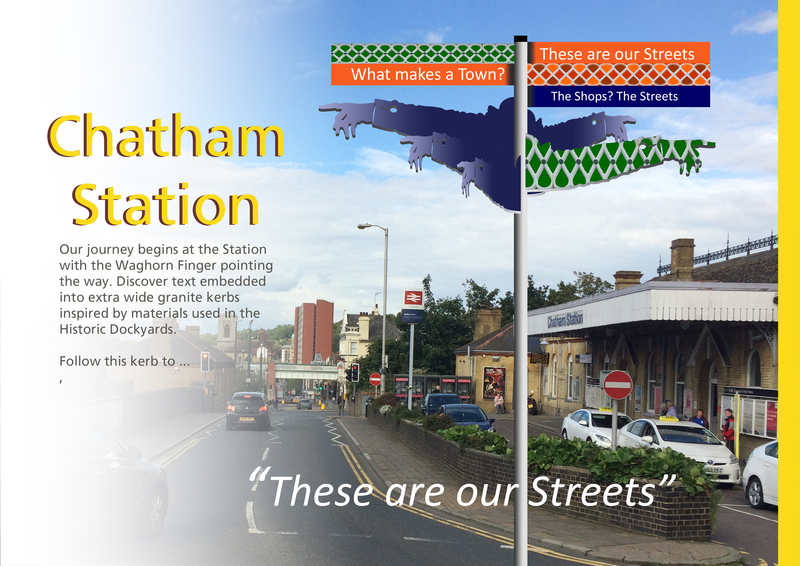 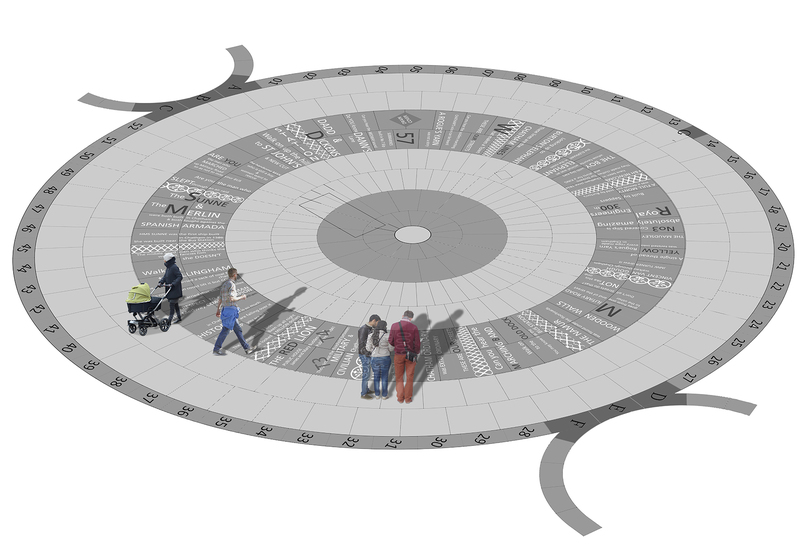 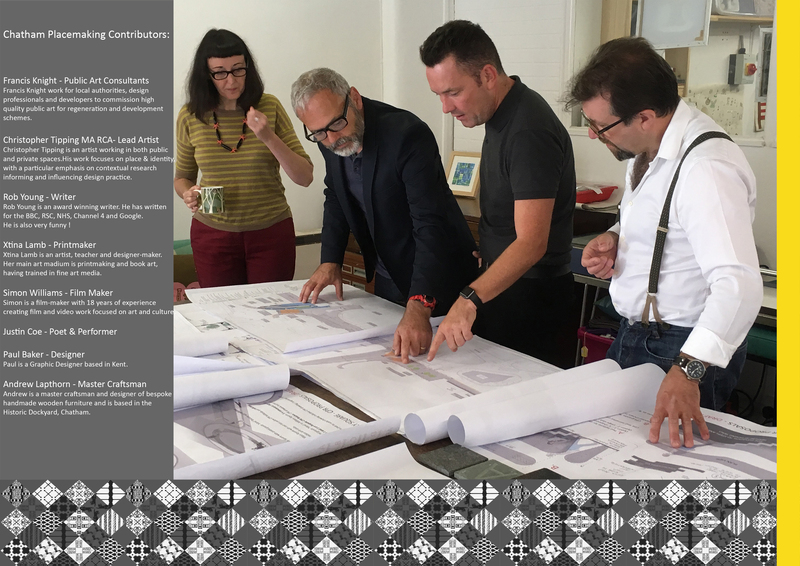 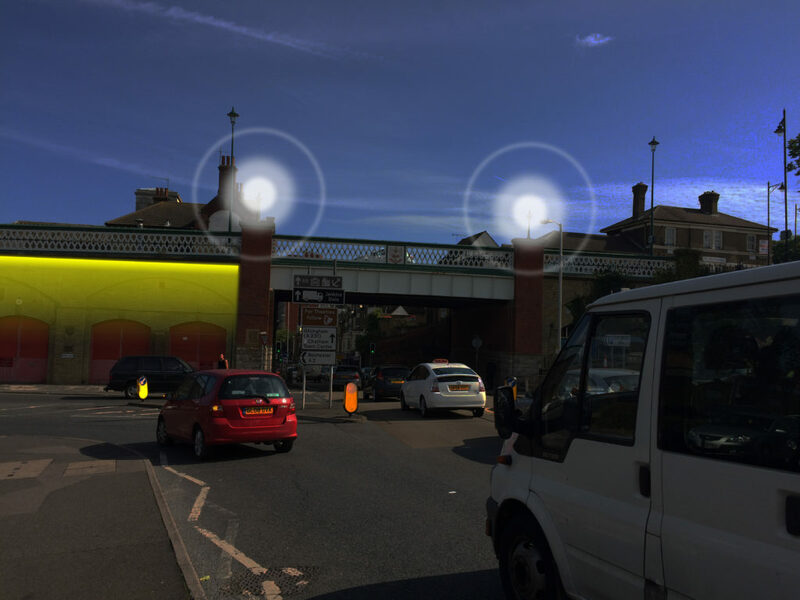 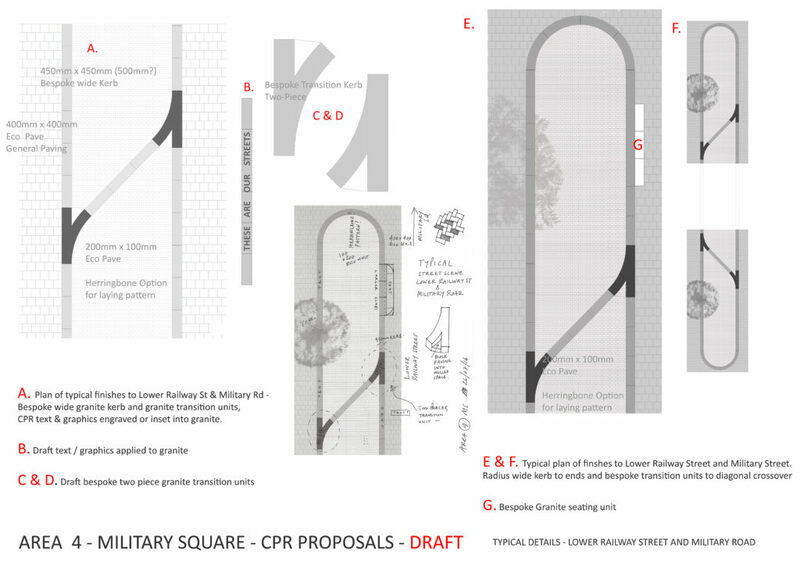 The final detailed designs for public art interventions were presented to Medway Council and their partners Network Rail in January 2018. 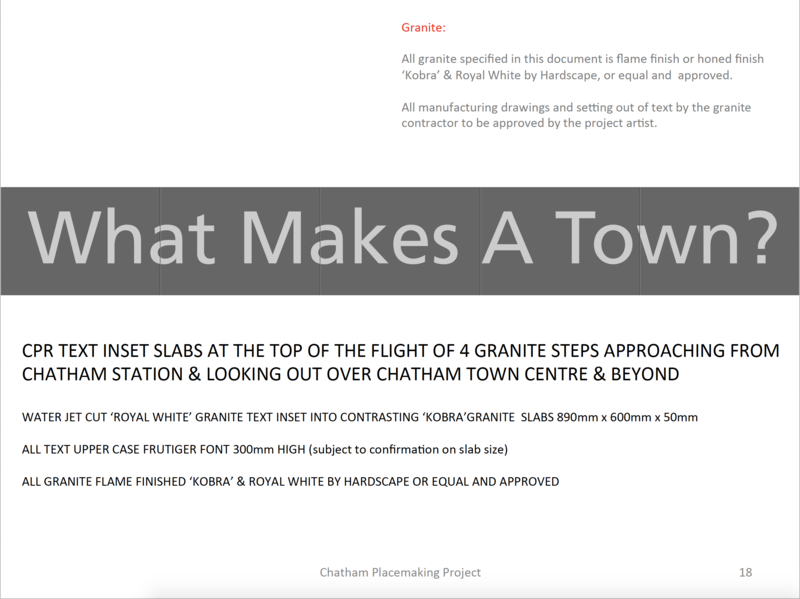 This work dovetails with works already carried out and continues themes and material choices and finishes established at the outset of the scheme. 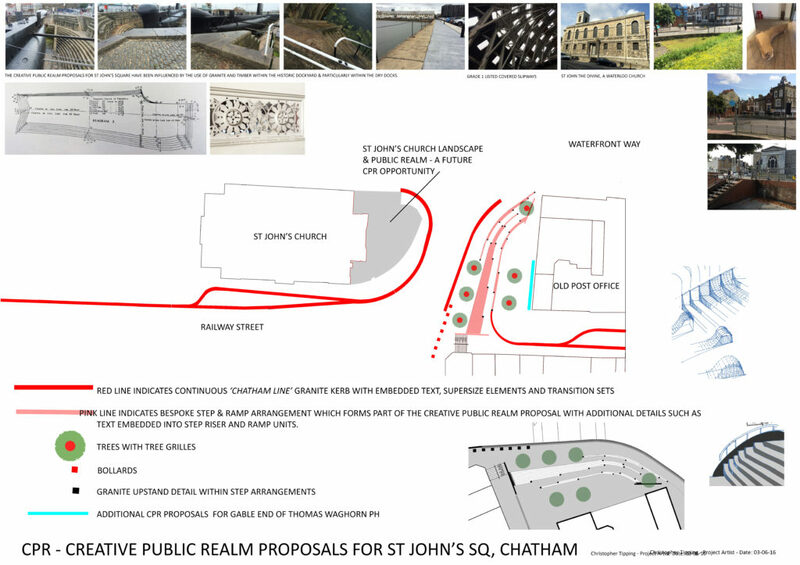 The following images highlight the proposals we put forward at the beginning of 2018. 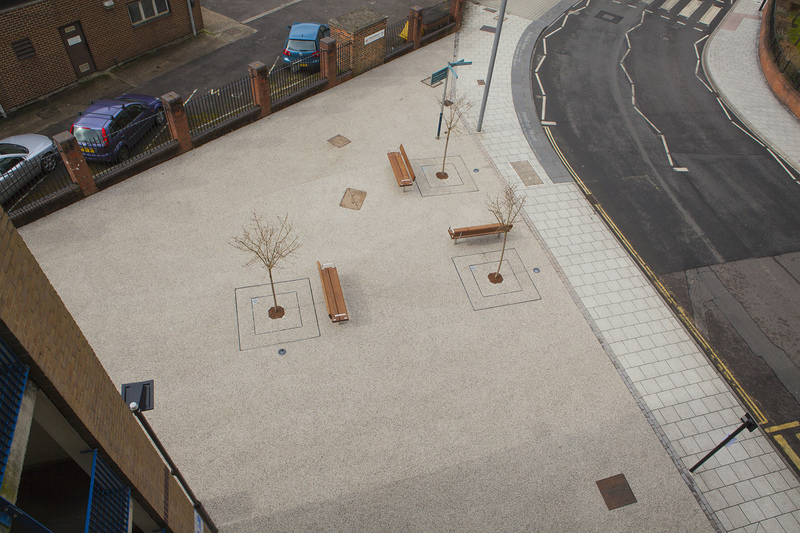 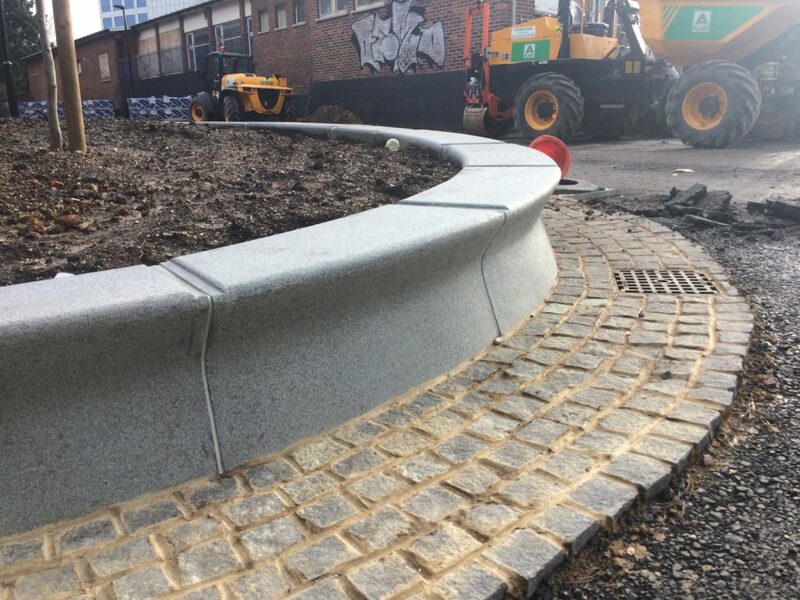 The regeneration and public realm works in Military Square, Chatham have very nearly been completed. 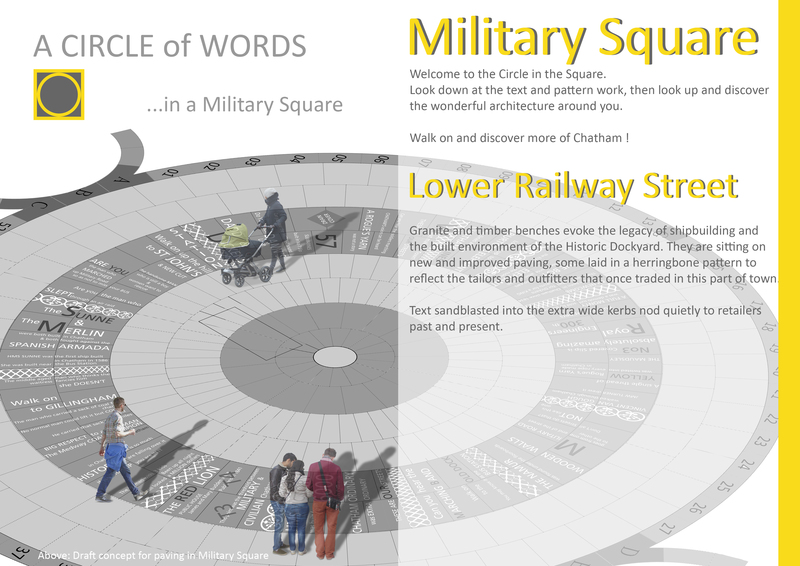 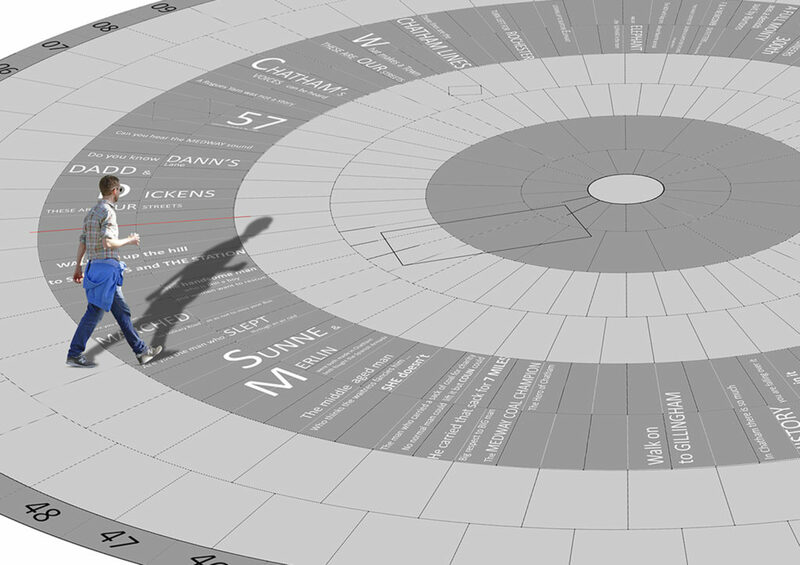 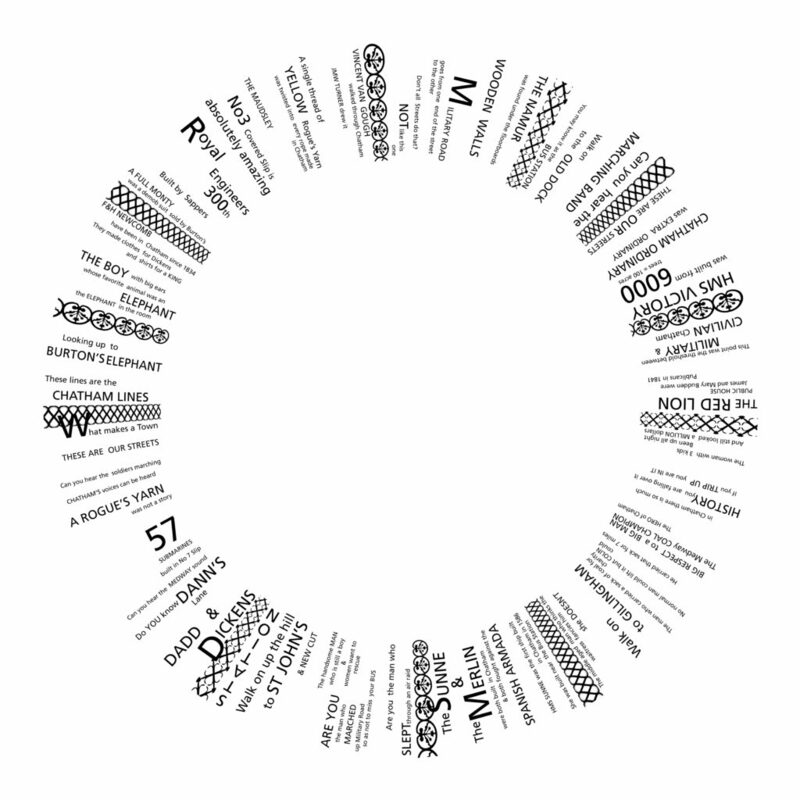 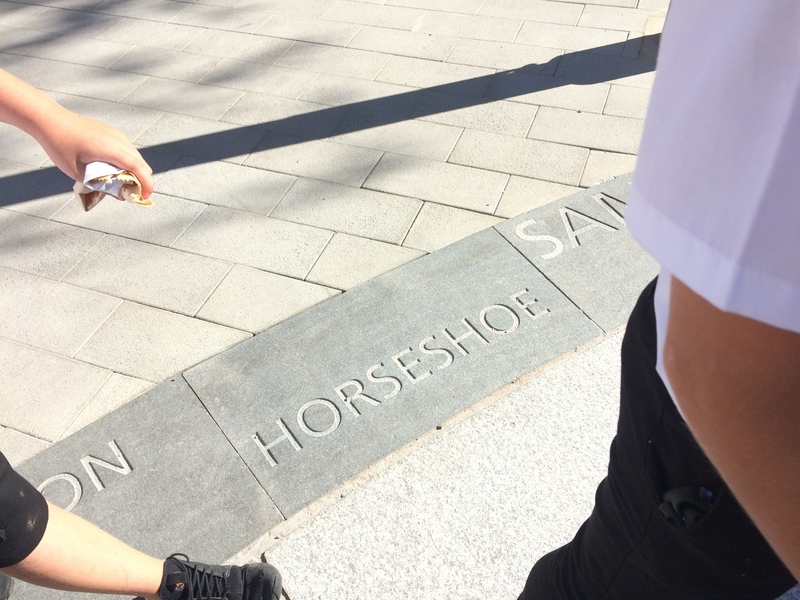 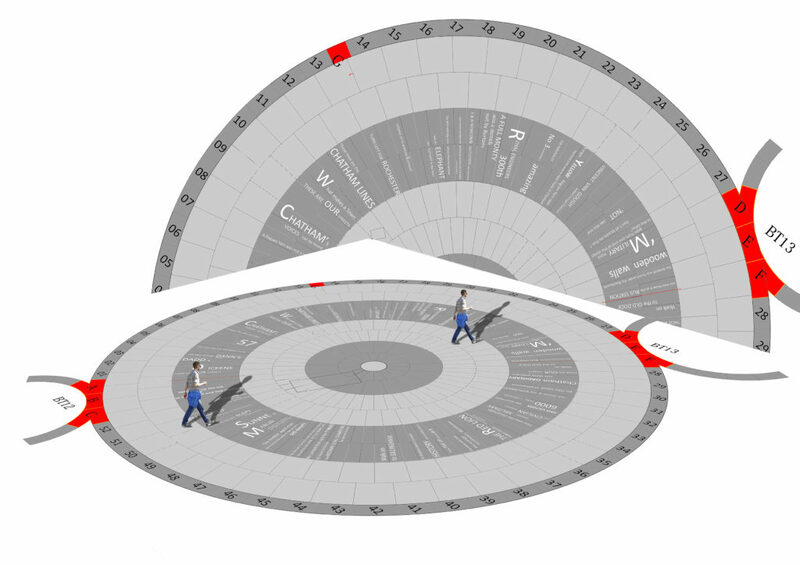 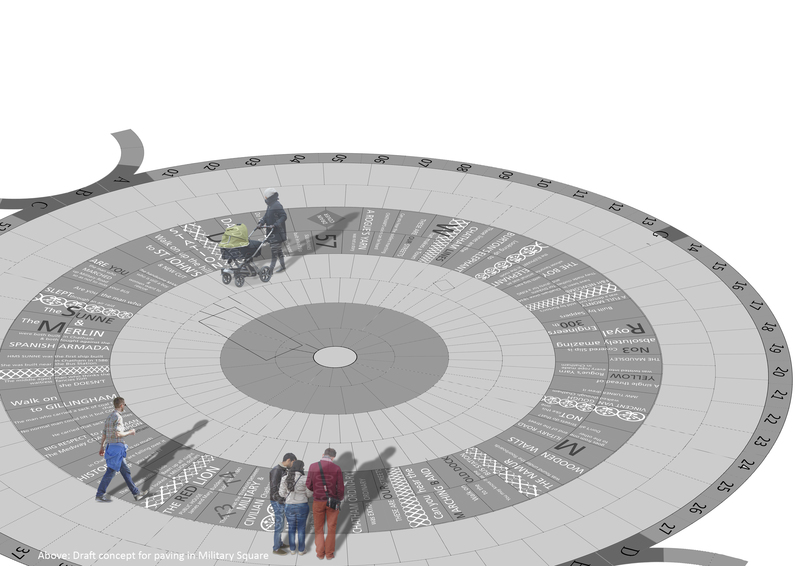 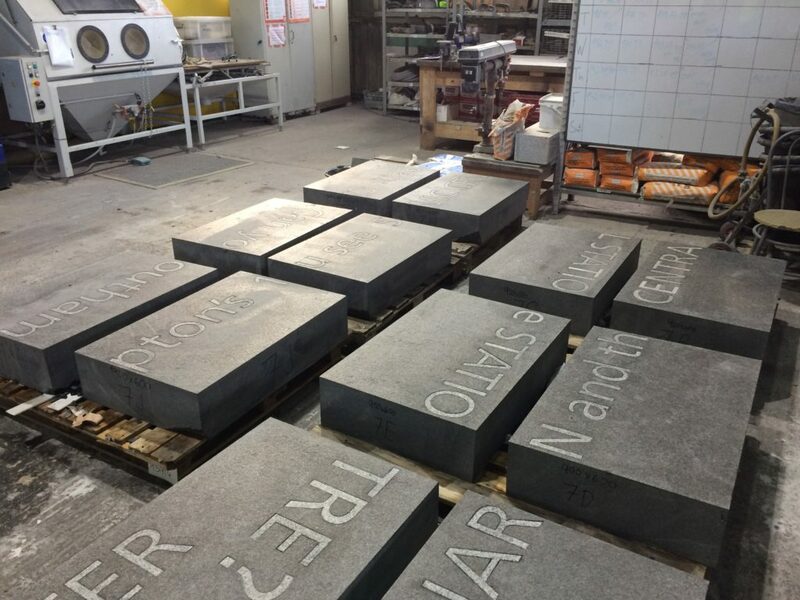 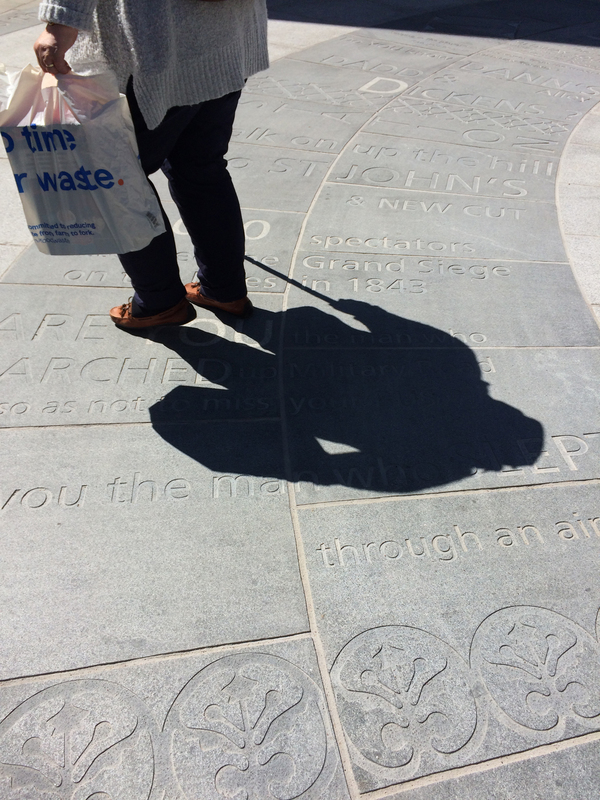 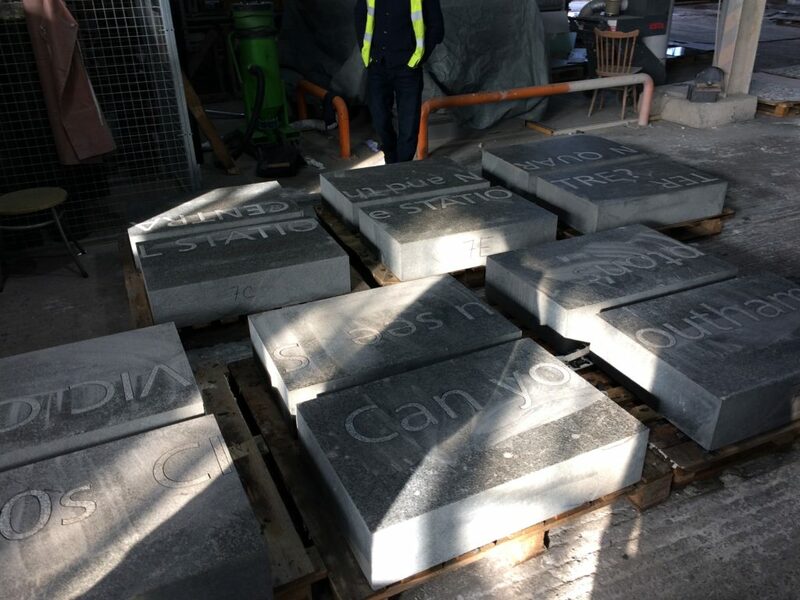 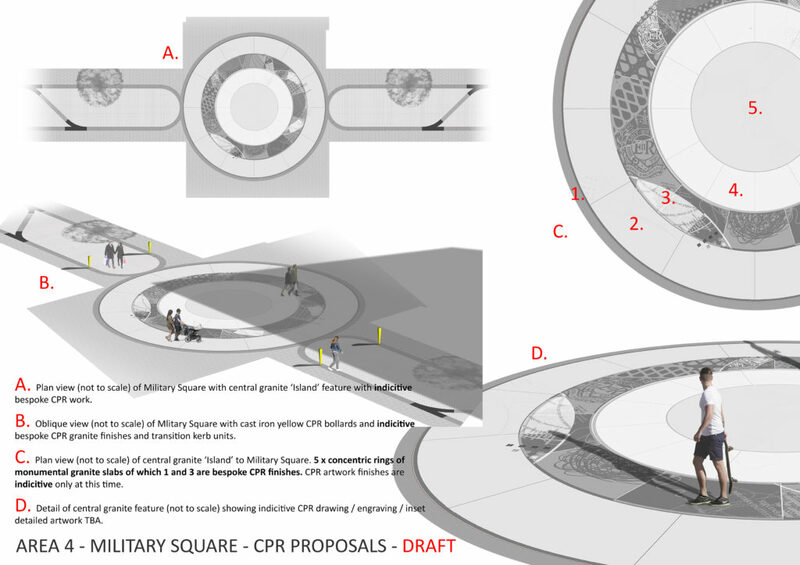 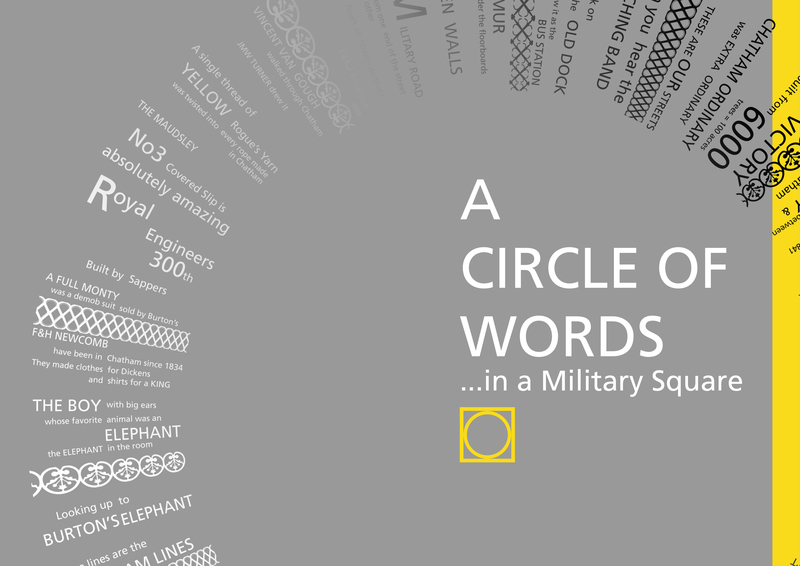 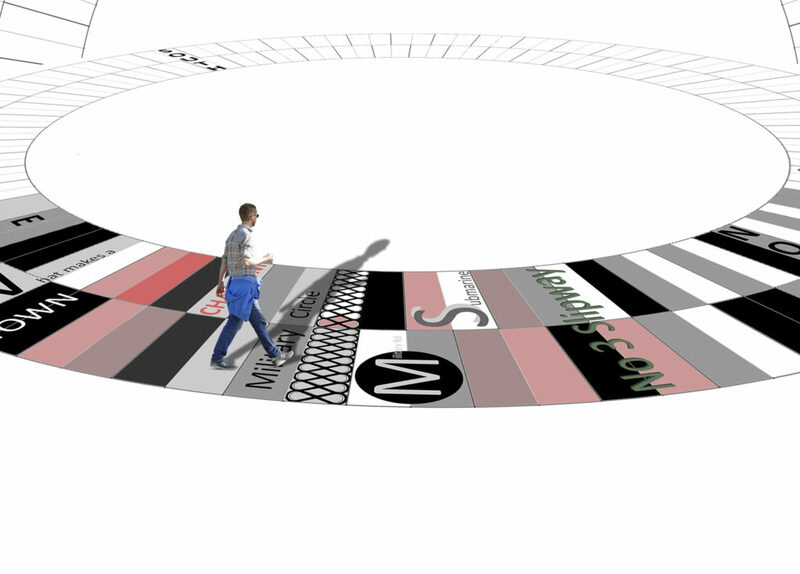 This involves the installation of 400 bespoke radius-cut monolithic blocks of granite set into 17m diameter circle, putting a circle of words at the centre of a Military Square! 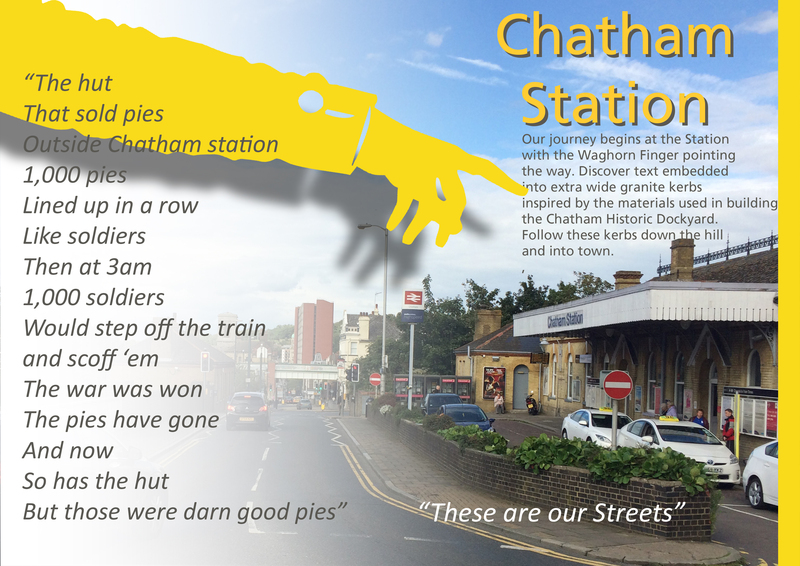 Local school children & people working in local businesses were asked for their comments. 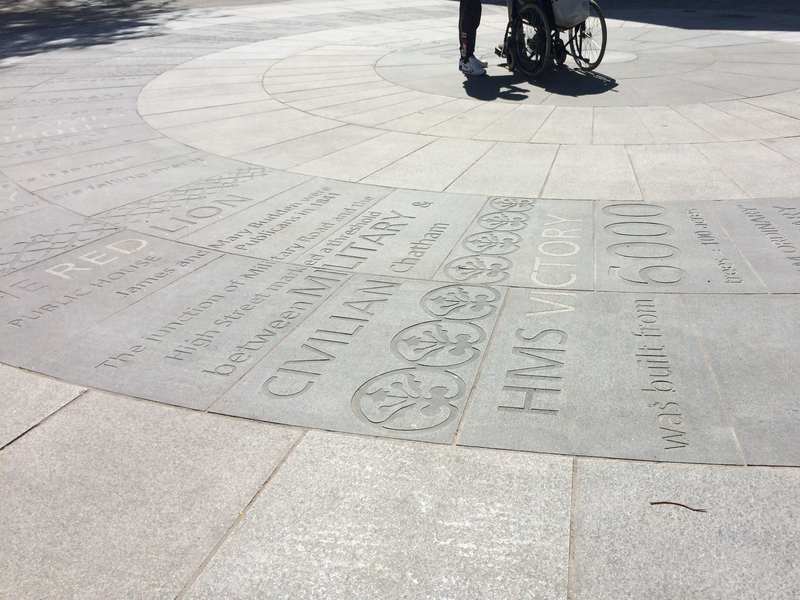 We listened to them & heard their stories. 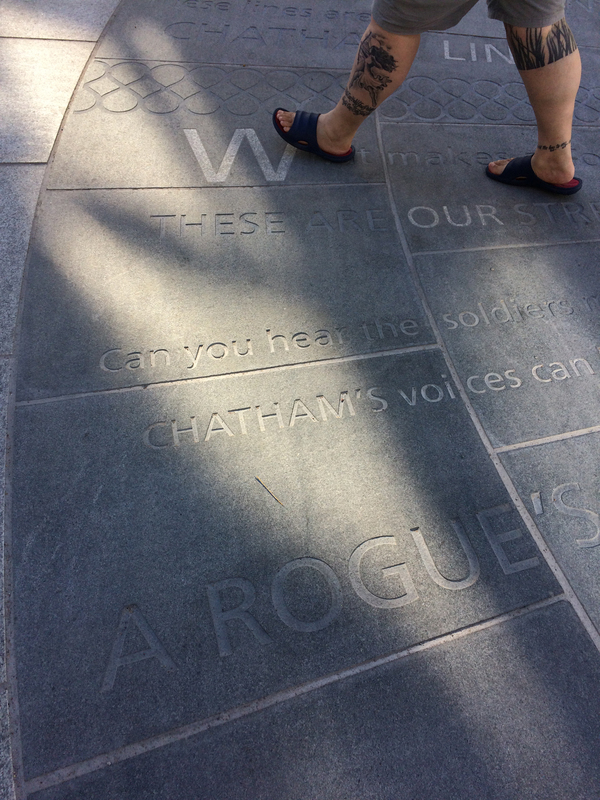 We listened to the sound of their lives. 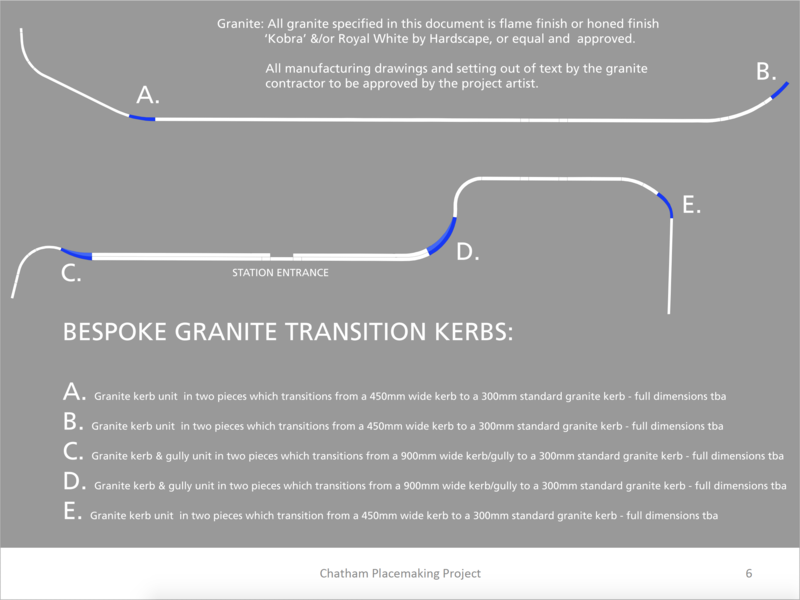 There is an overwhelming sense of common ownership in this project. 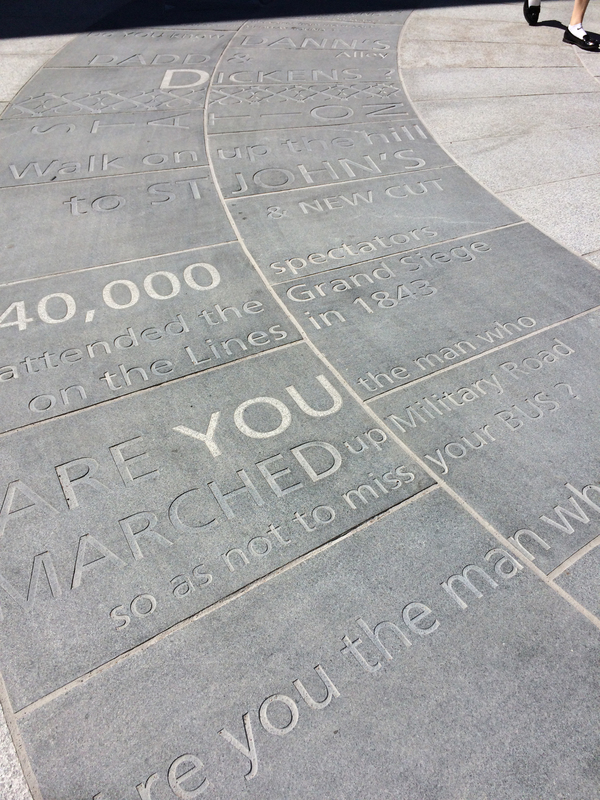 These words are not ours. 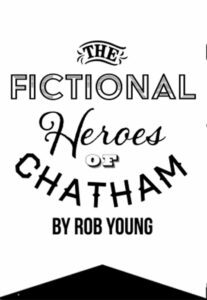 They belong to Chatham. 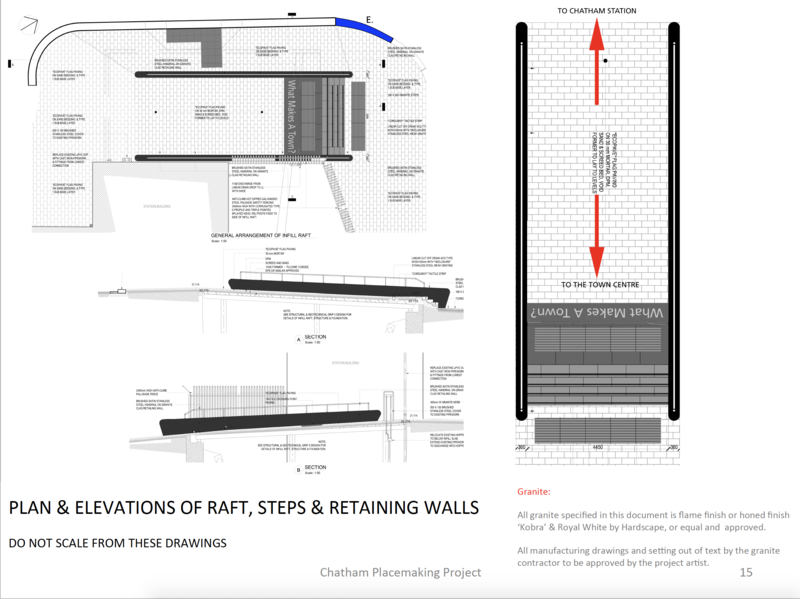 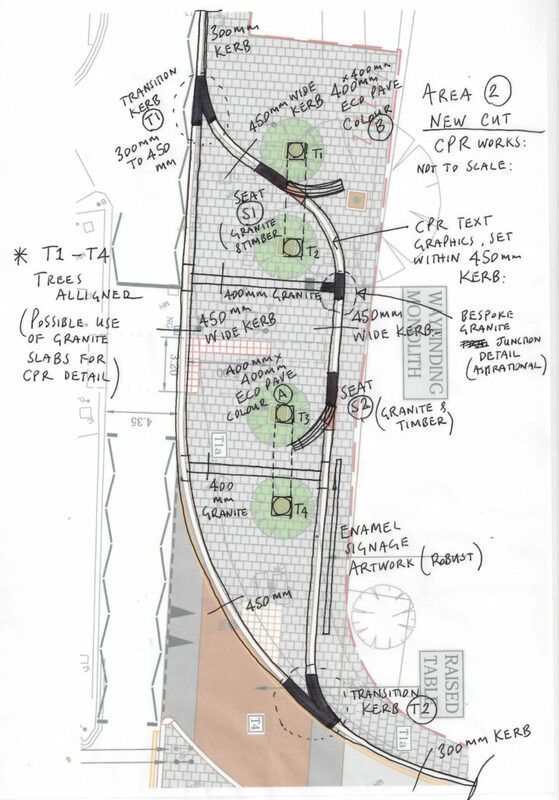 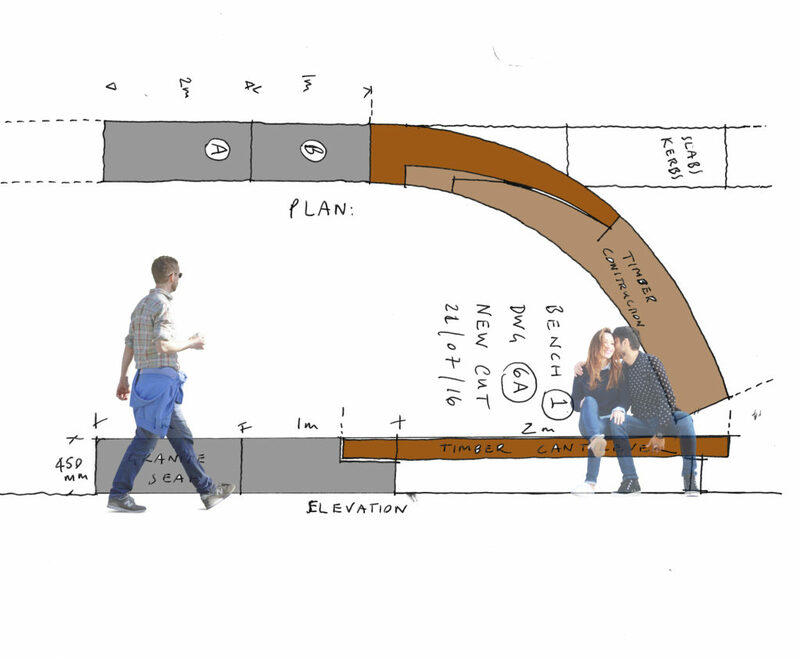 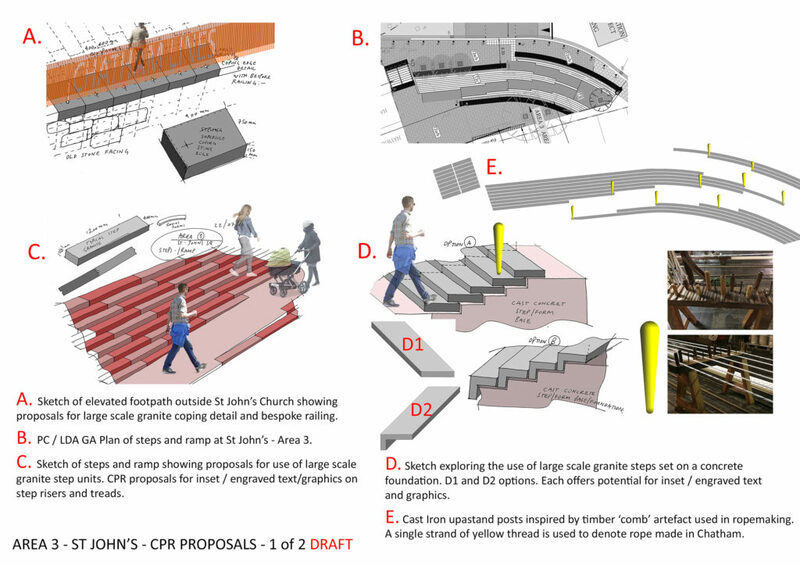 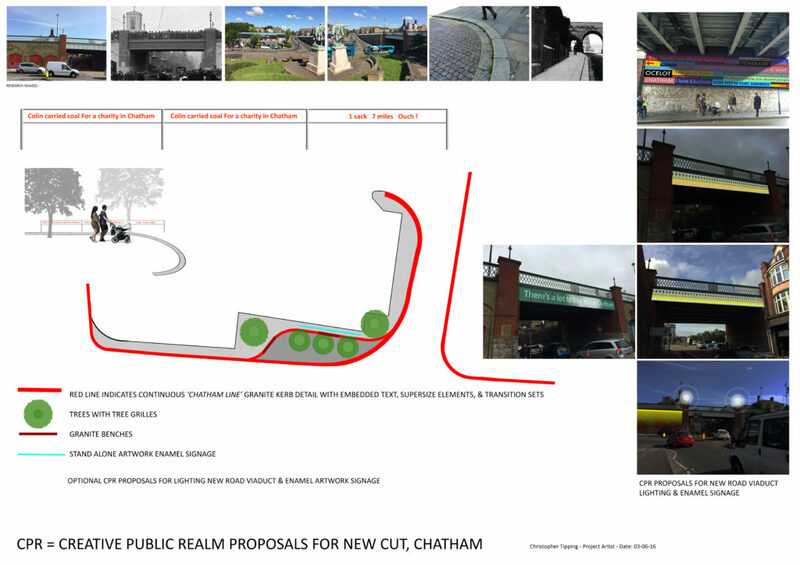 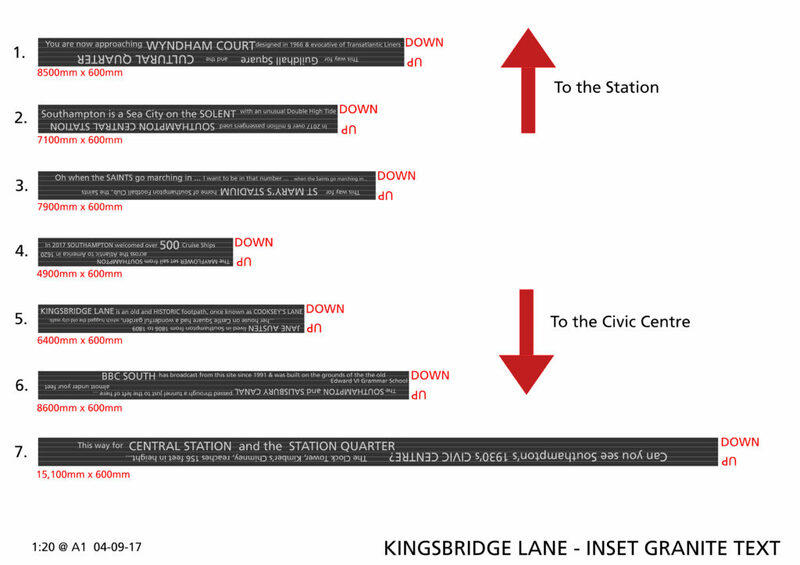 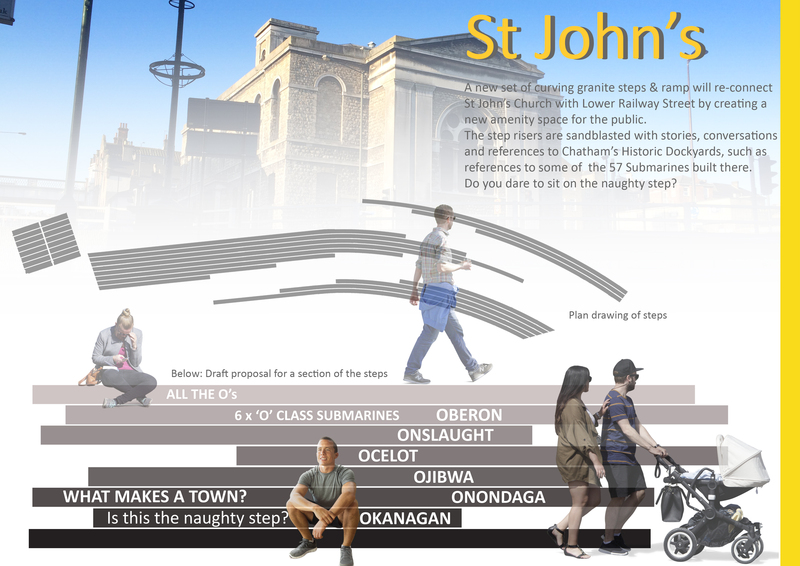 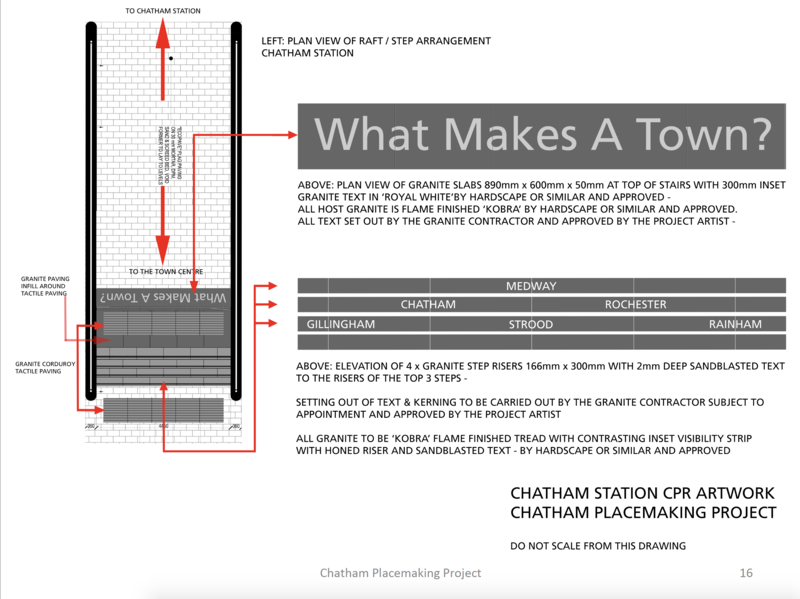 You may know that the aim of this public realm project was to upgrade the route from Chatham Station to the Waterfront. 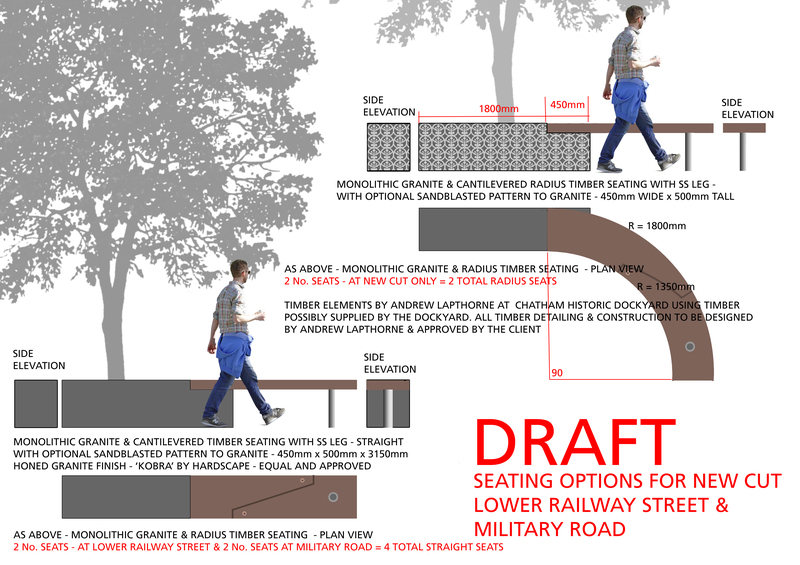 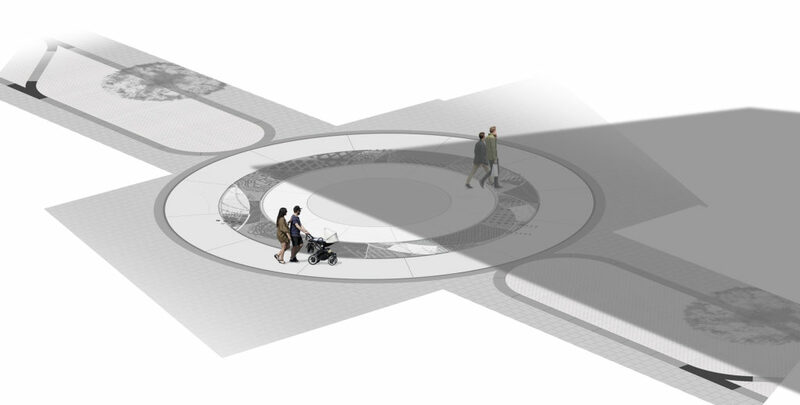 This includes pedestrian and cycle routes as well as crossing points, upgrading paving materials, improving steps and ramps, opening up the public realm and streamlining access and pedestrian permeability. 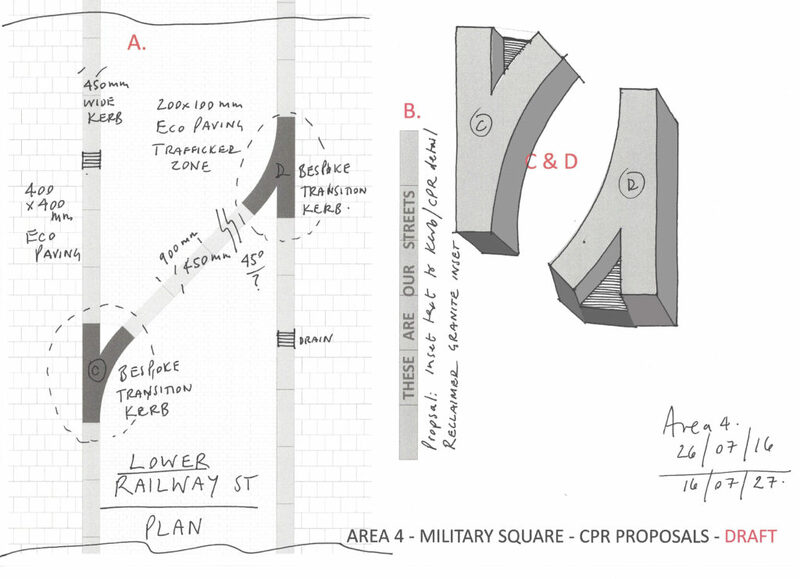 Francis Knight, Public Art Consultants, managed the Public Art Project. 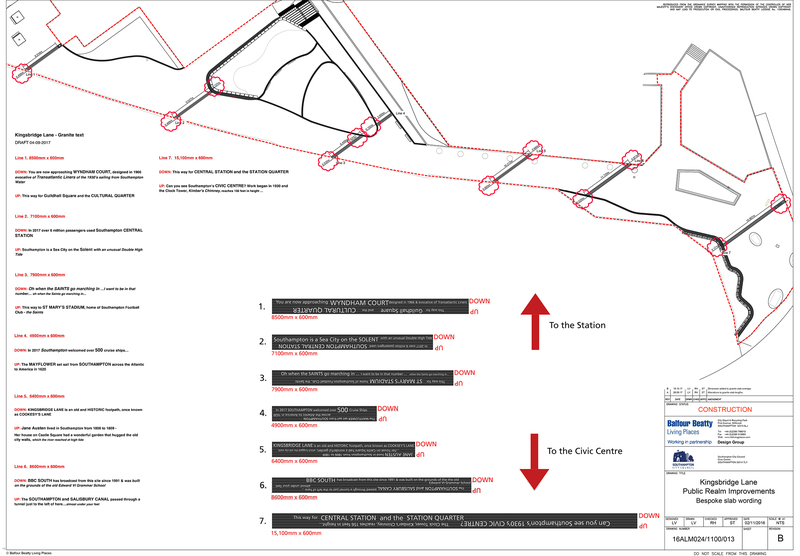 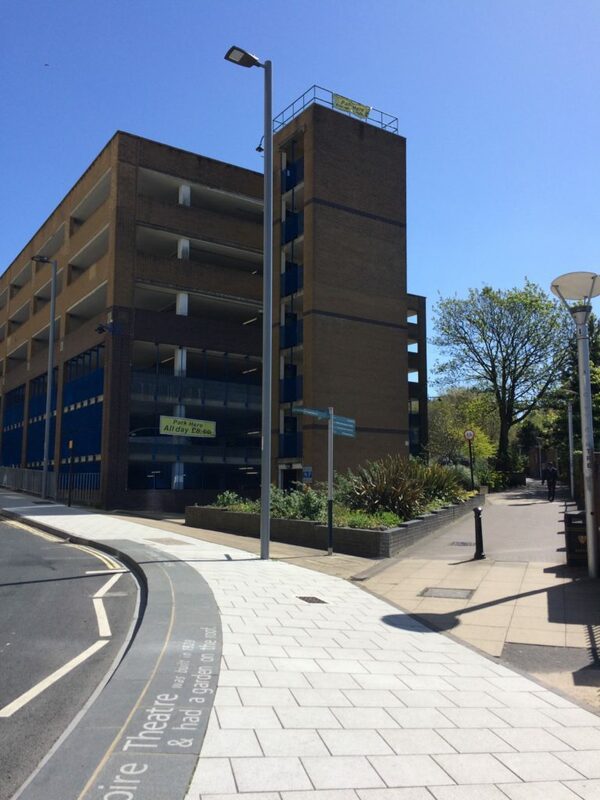 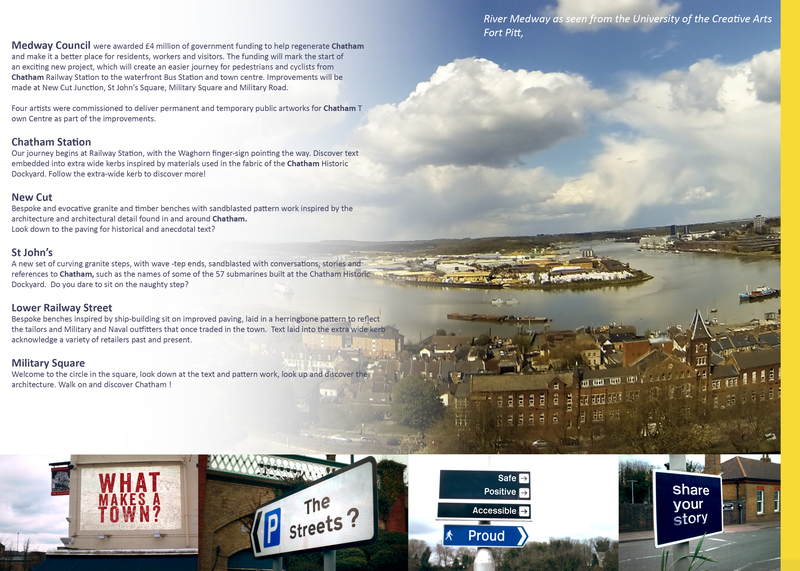 Our project collaborators and consultants to Medway Council were LDA Design and Project Centre. 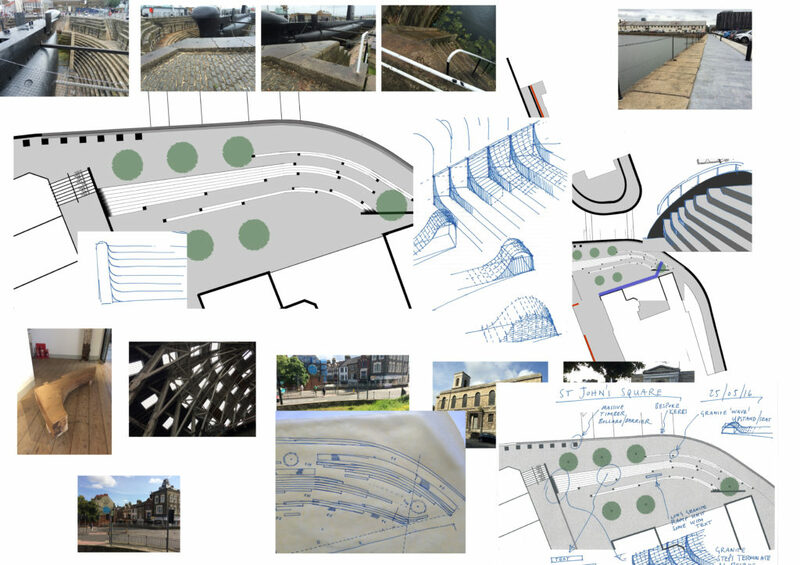 We have worked within these parameters, using the language of public realm and materials, which are robust and stand the test of time. 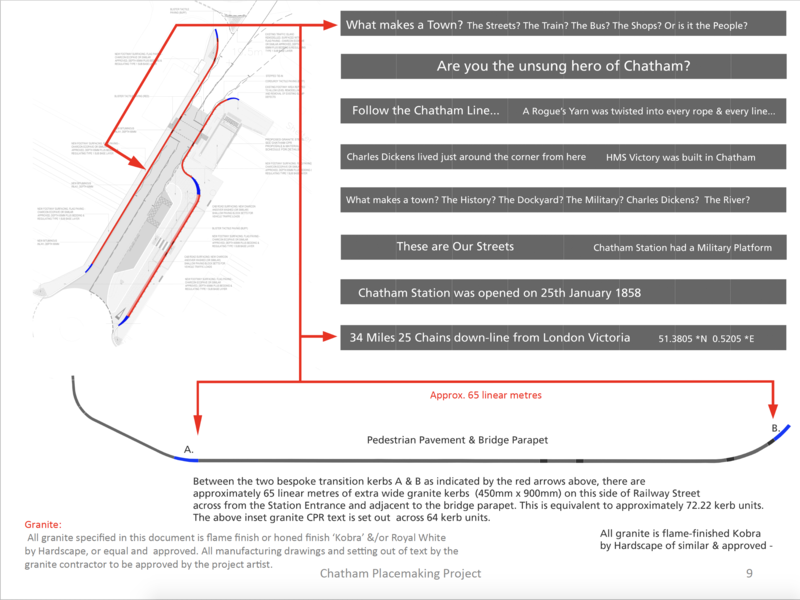 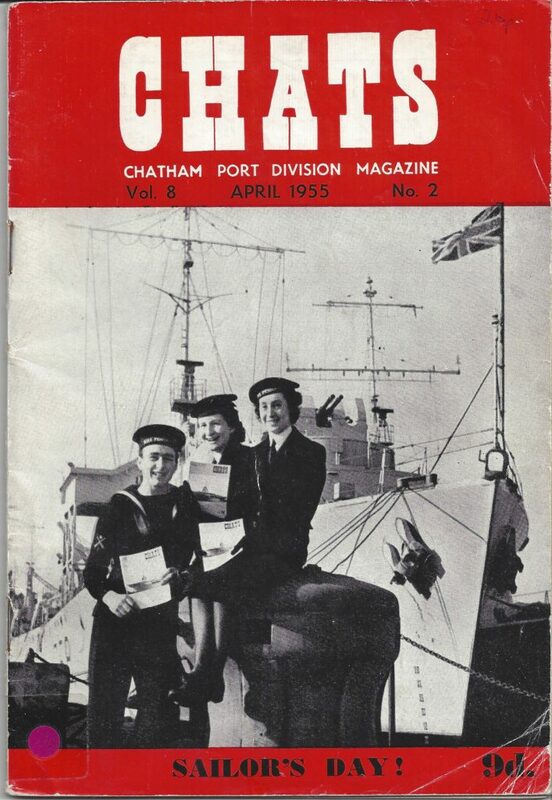 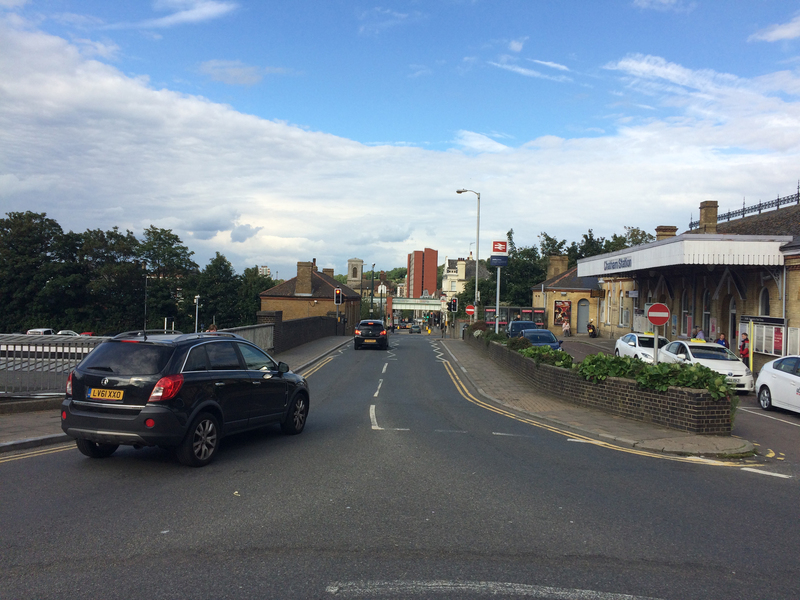 We have created a quiet ‘narrative’ thread – a story about Chatham – & more specifically about events and places along this route. 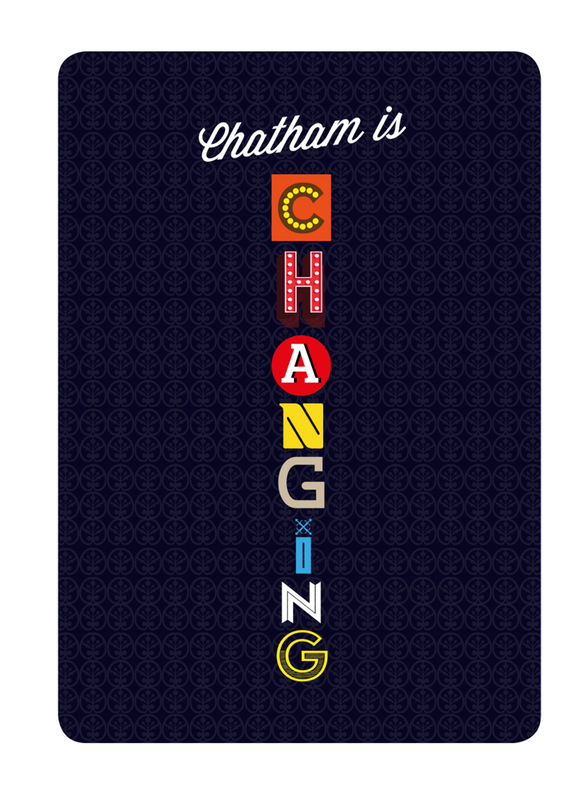 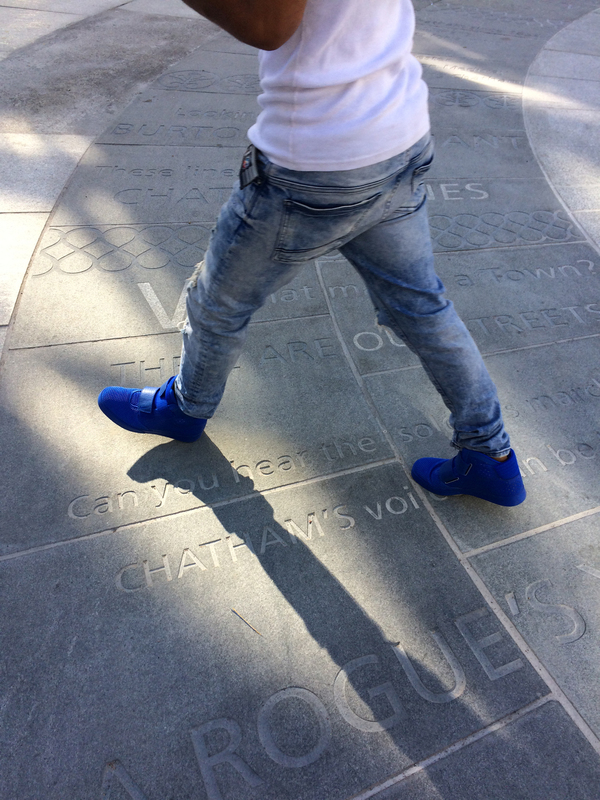 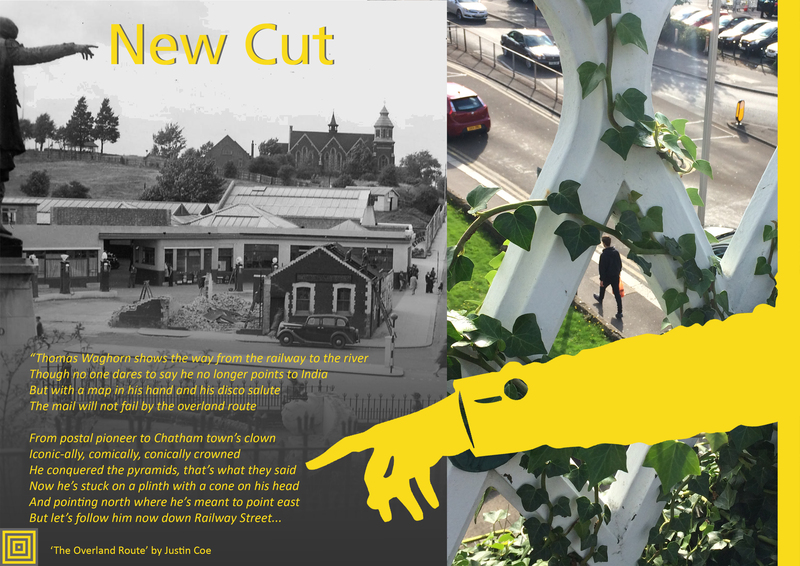 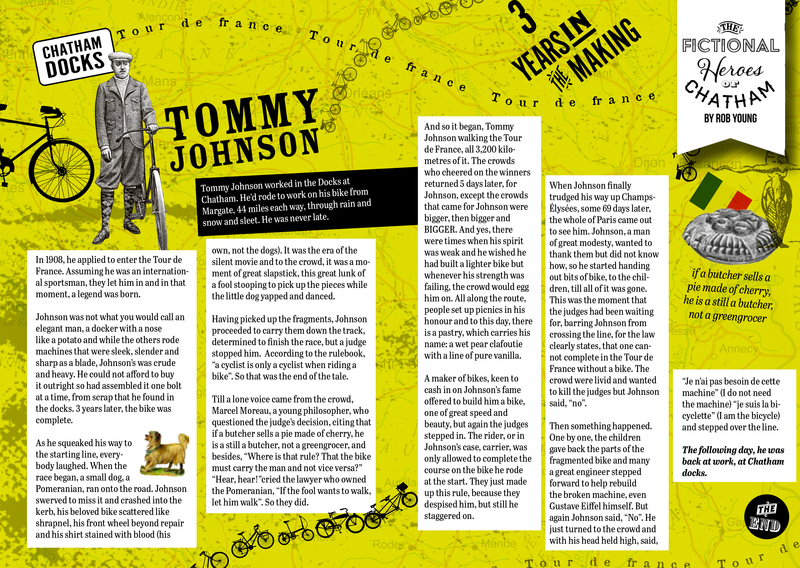 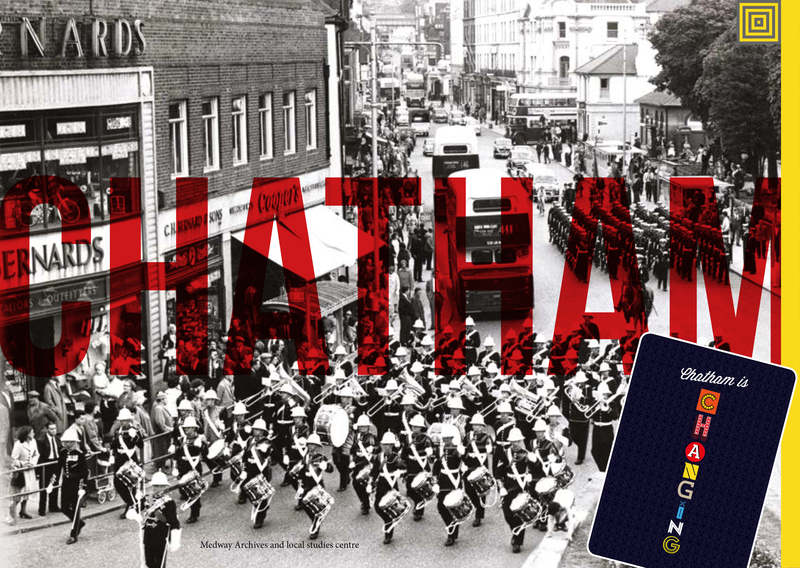 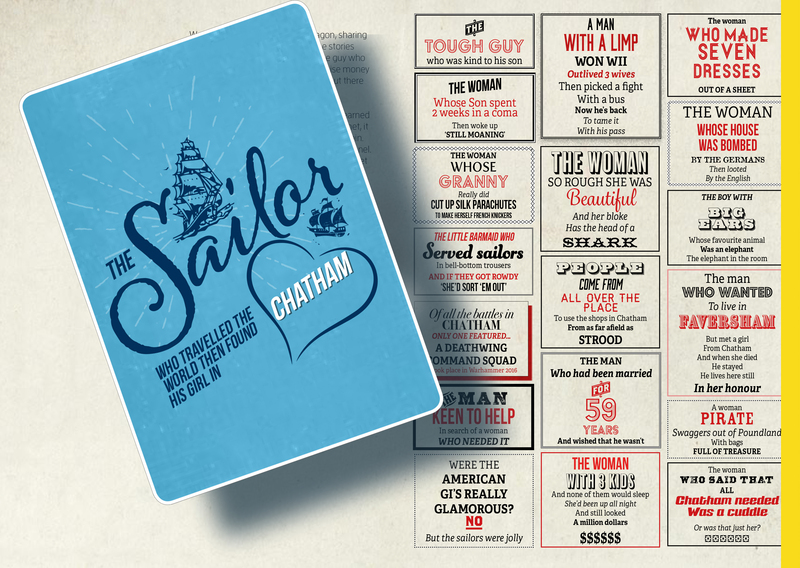 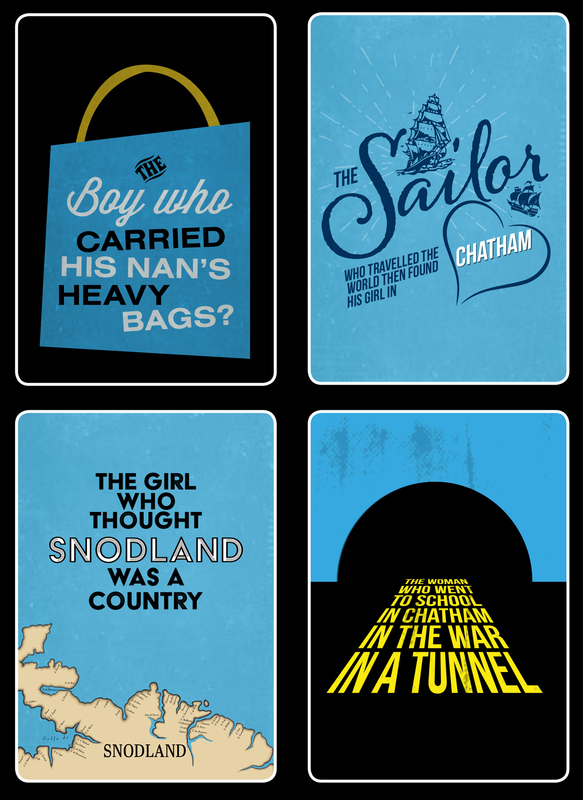 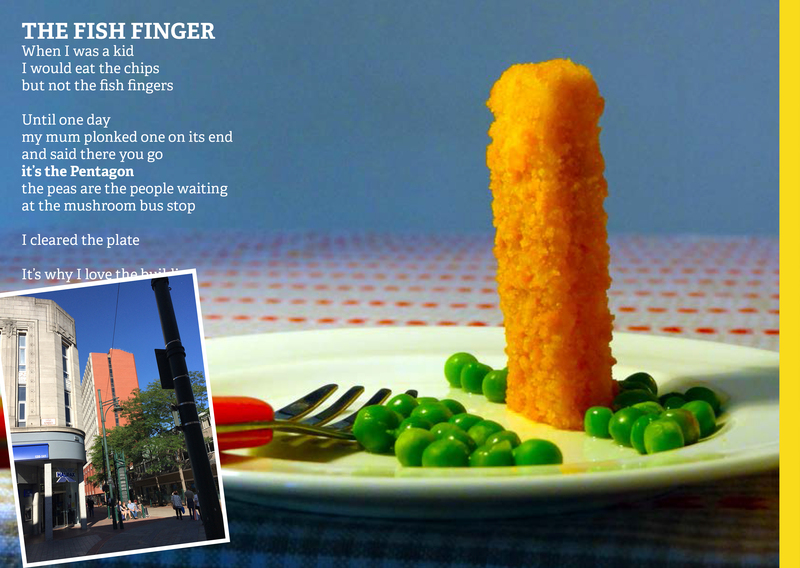 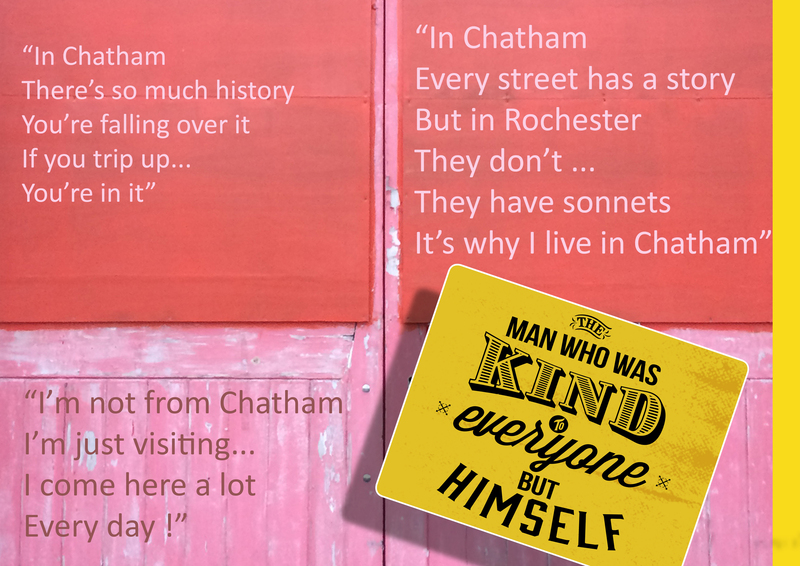 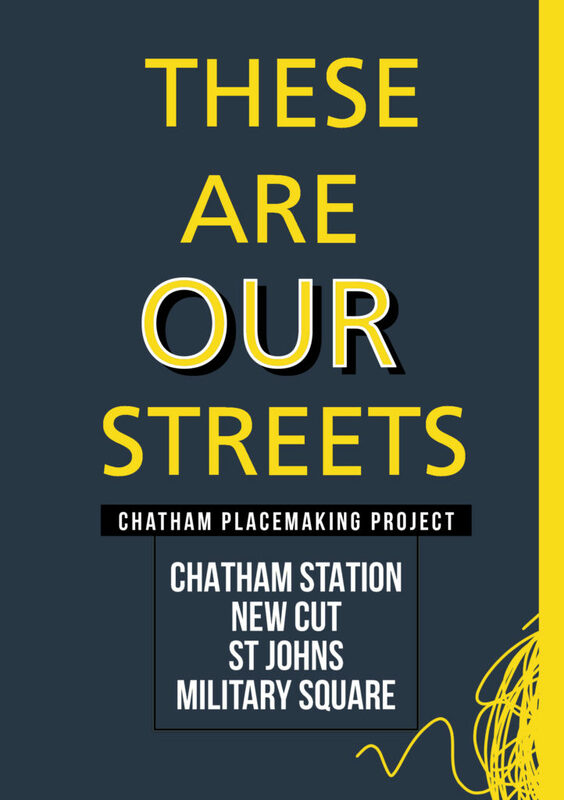 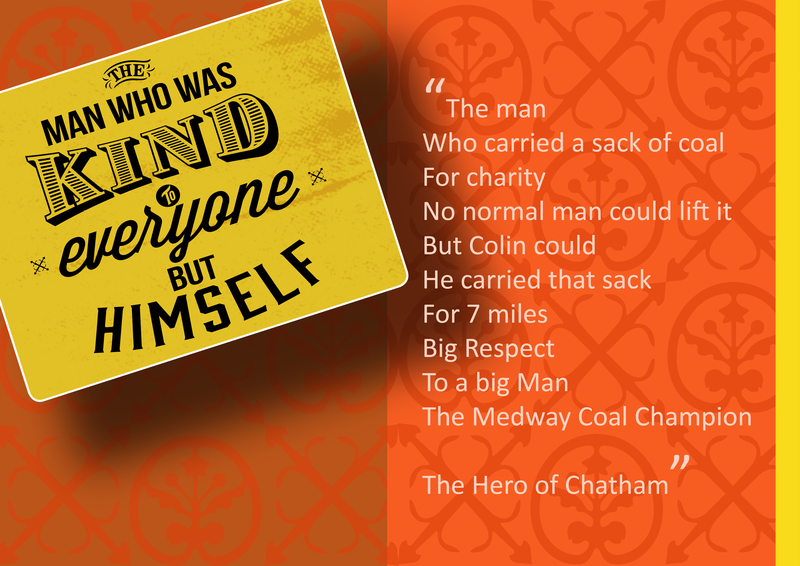 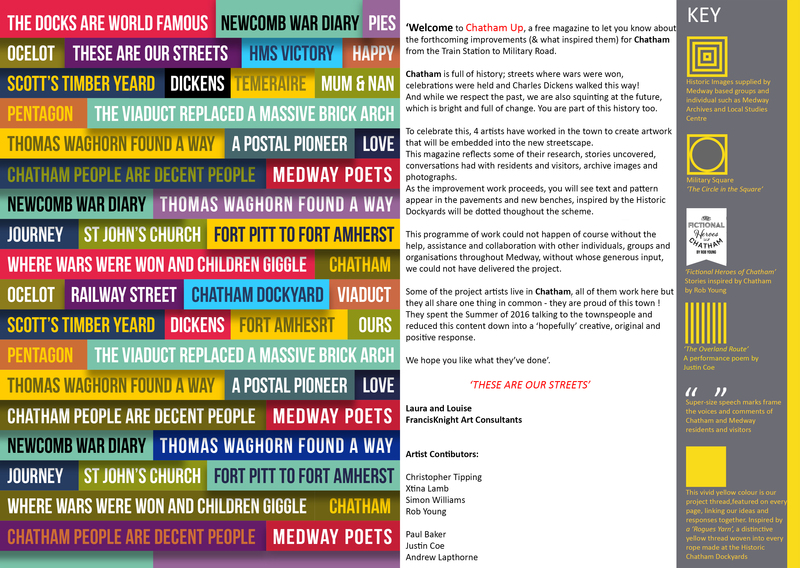 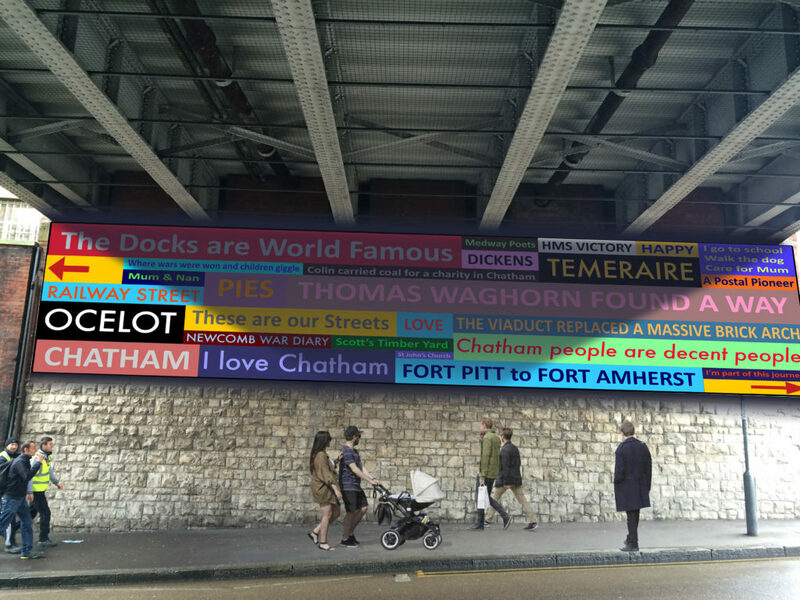 We wanted the streets to speak quietly, confidently & with good humour about Chatham…WHAT MAKES A TOWN? 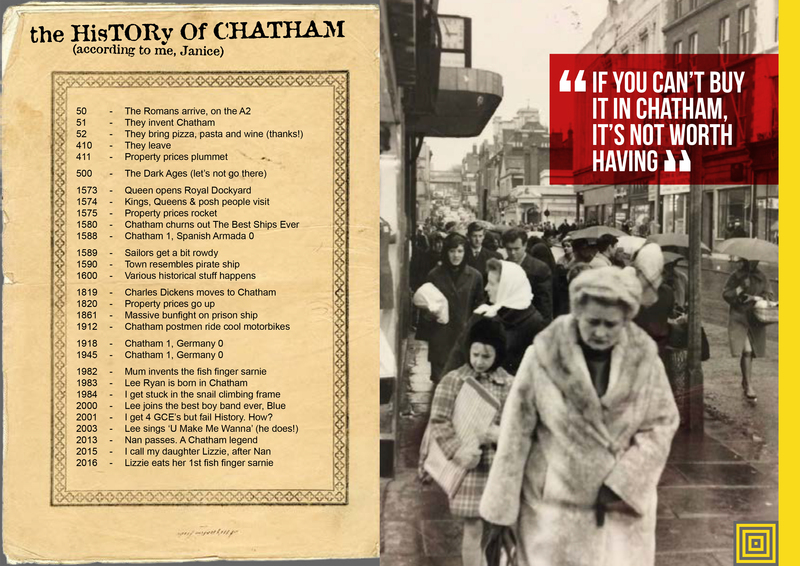 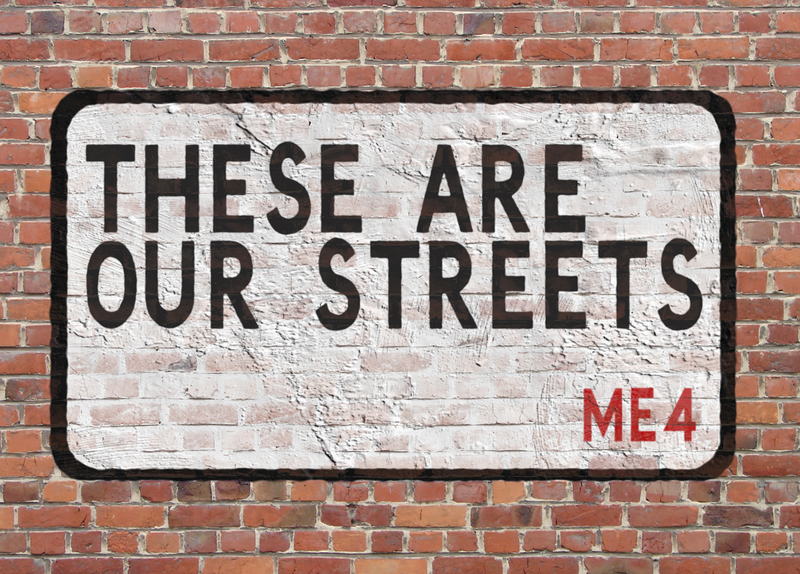 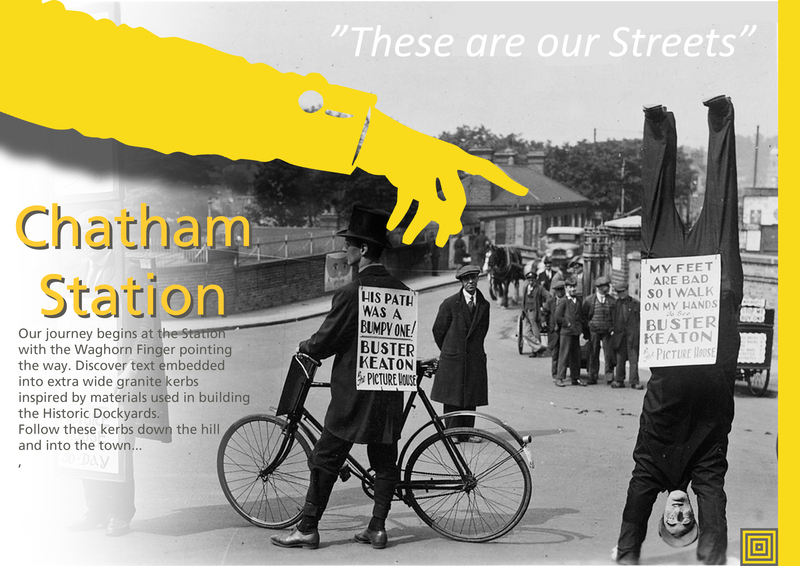 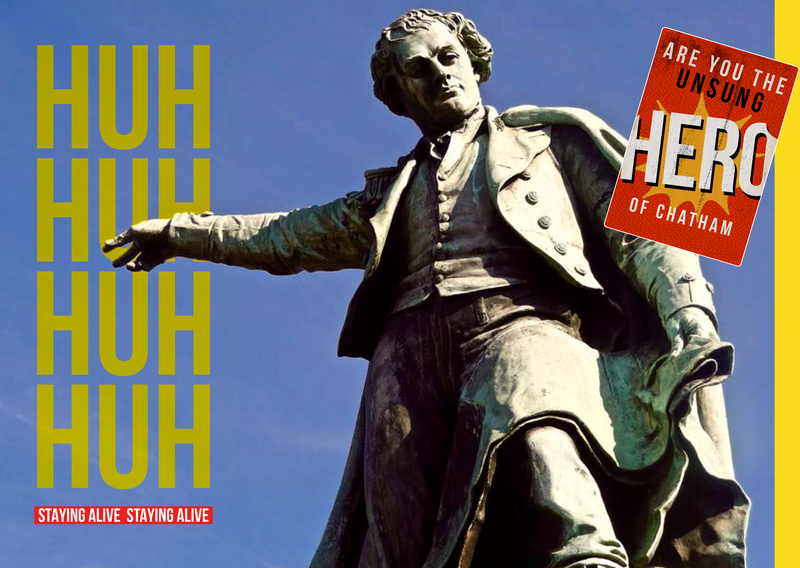 …THESE ARE OUR STREETS…part memorial, part living voice…but mostly a celebration of the rich heritage and community of Chatham. 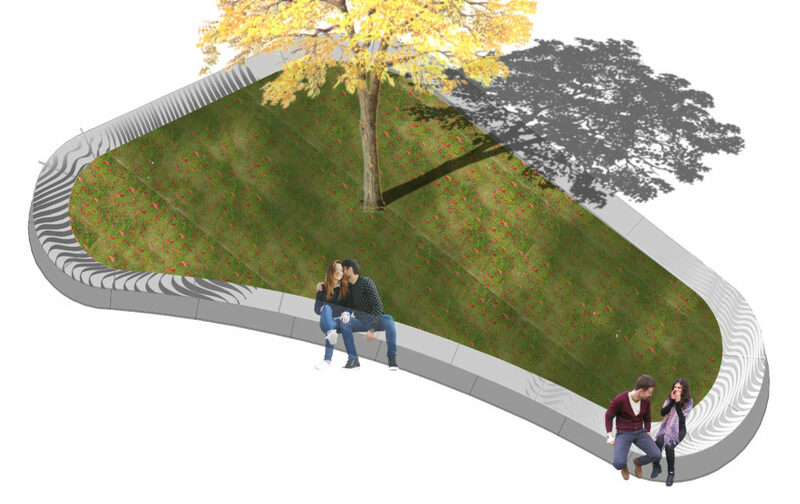 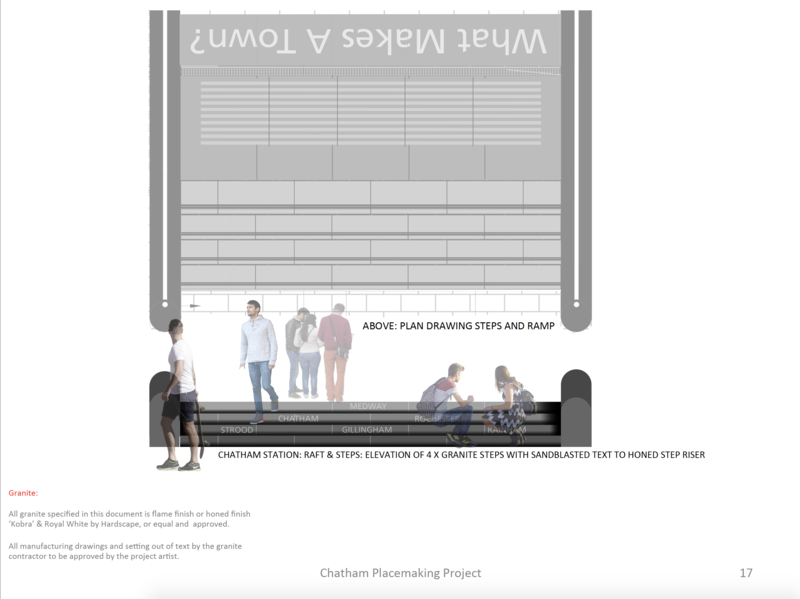 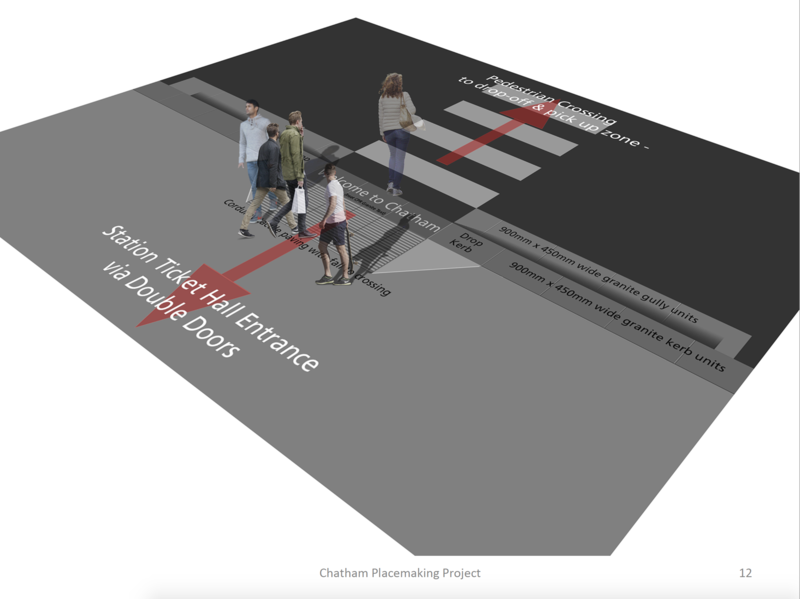 As an artist and designer of public spaces, this project has been an opportunity to influence our surroundings in a way that ‘speaks’ of Chatham and its people. 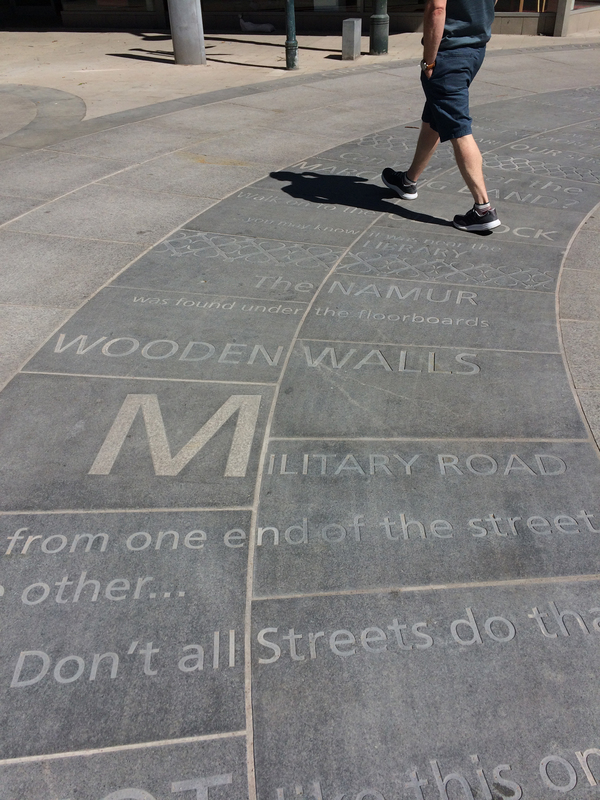 We mostly take our pavements for granted, but these spaces have often developed from historic pathways and tracks linking communities and towns across the wider region. 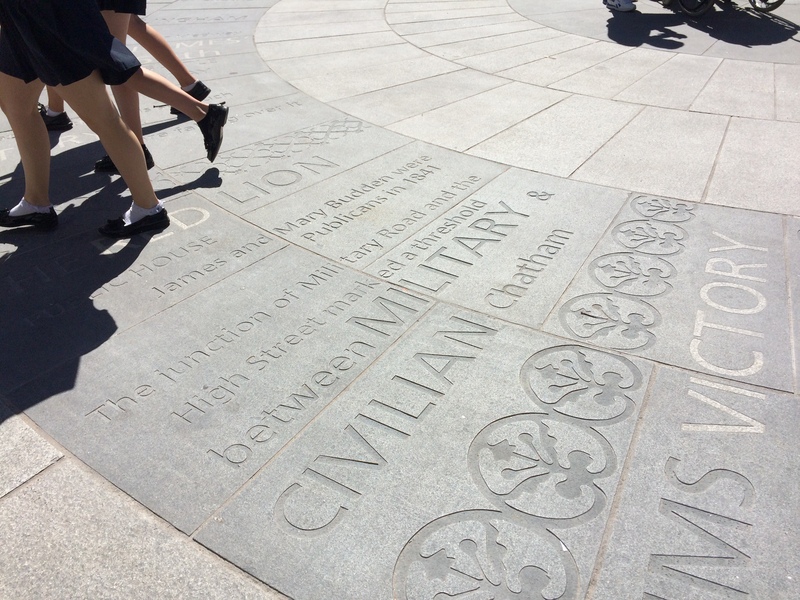 They have a resonance and a ‘voice’, …and echo with history. 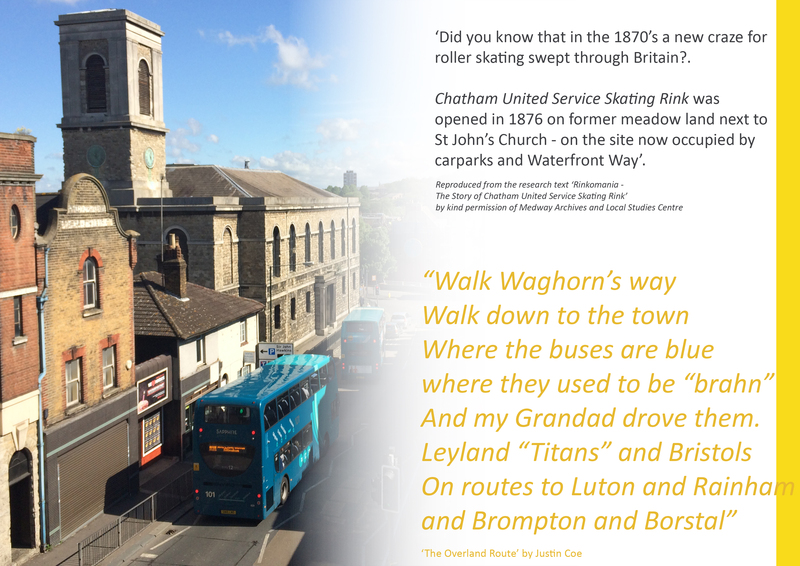 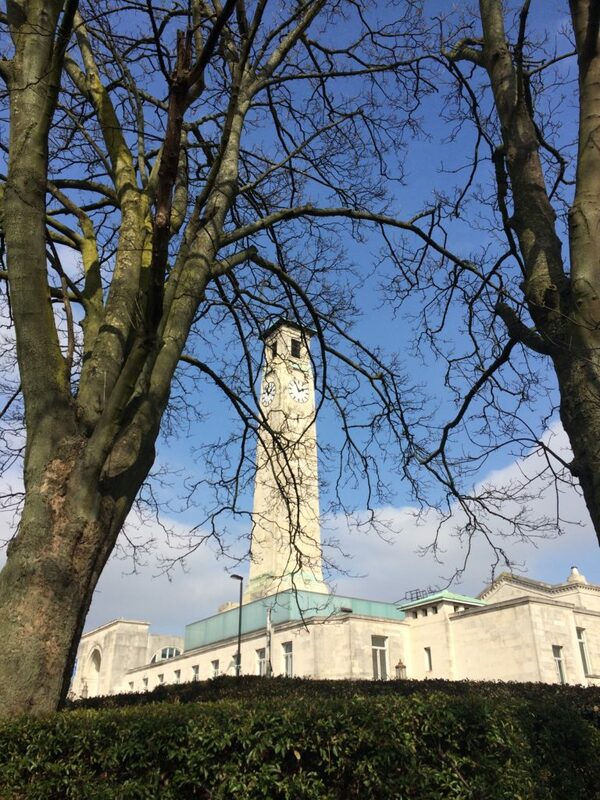 The route from the Station to the Waterfront takes us down Railways Street & Military Road – in doing so we pass several key places, such as New Cut (a former farmyard), St John’s (a Grade II Listed Waterloo Church) – Military Square, considered the Heart of the Town. 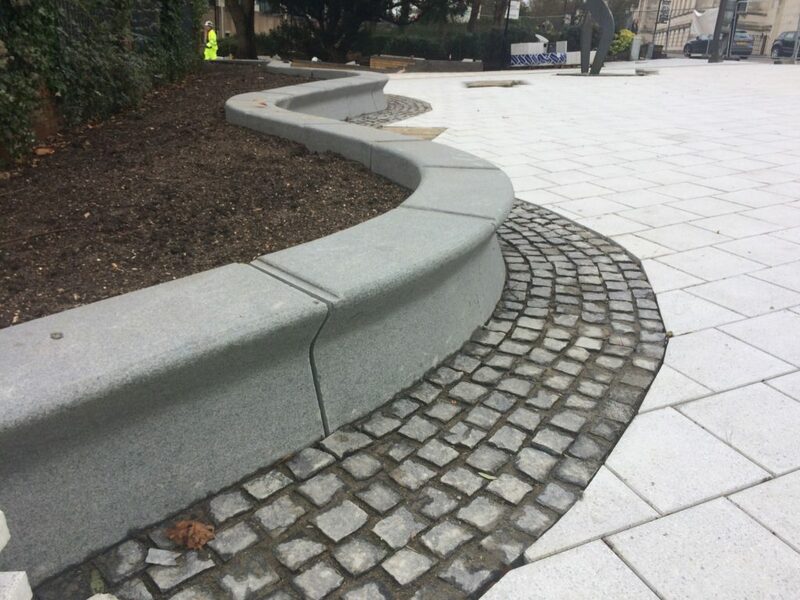 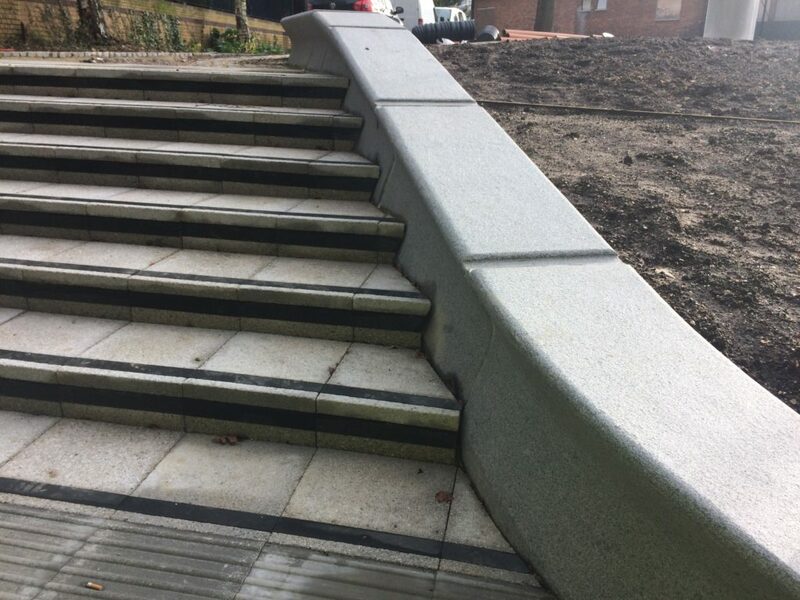 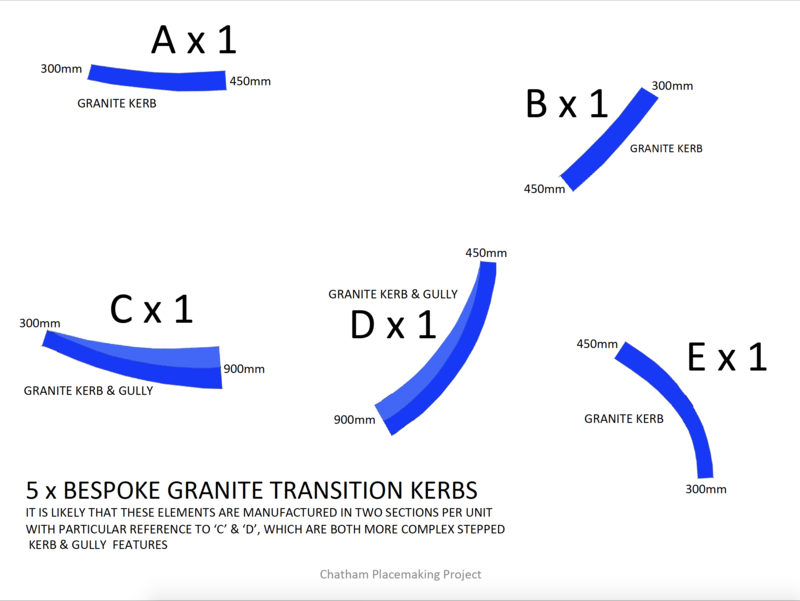 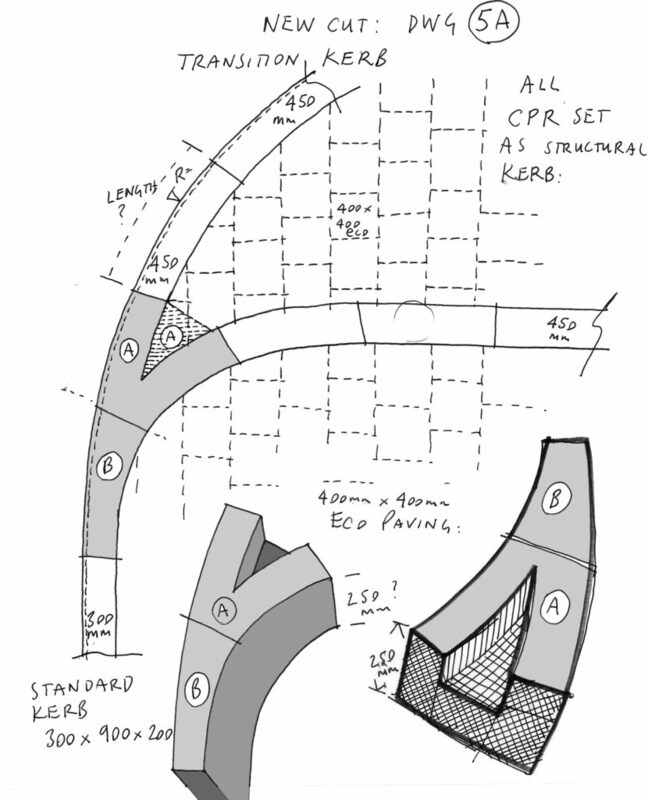 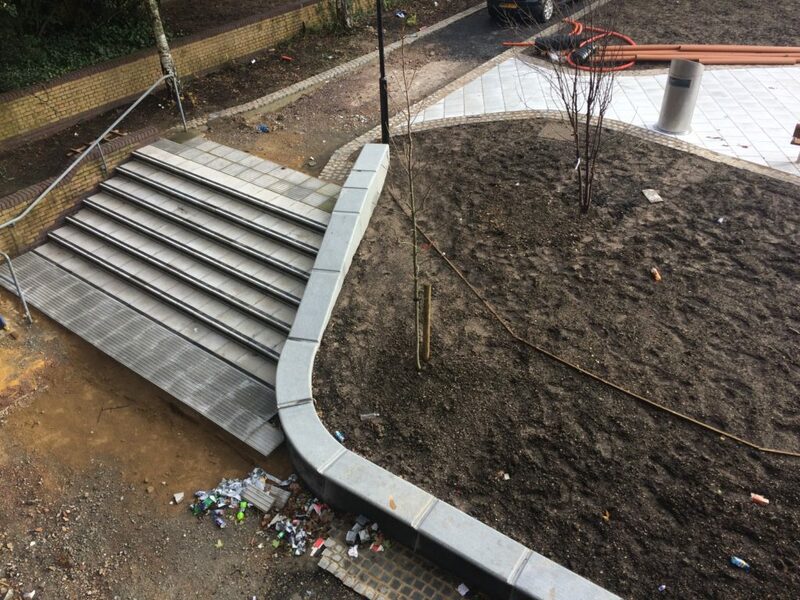 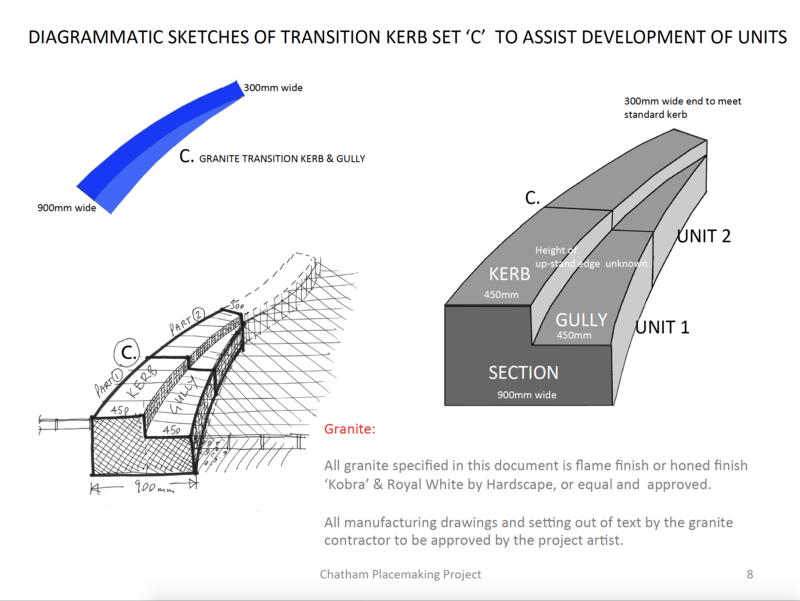 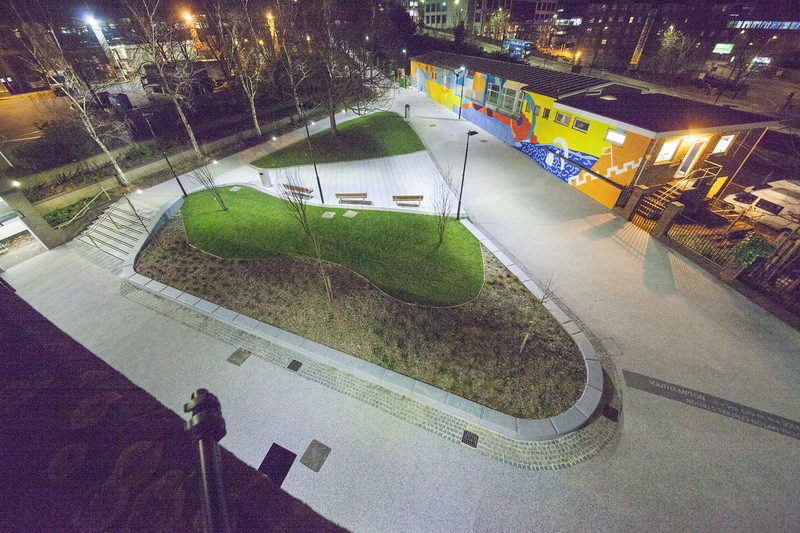 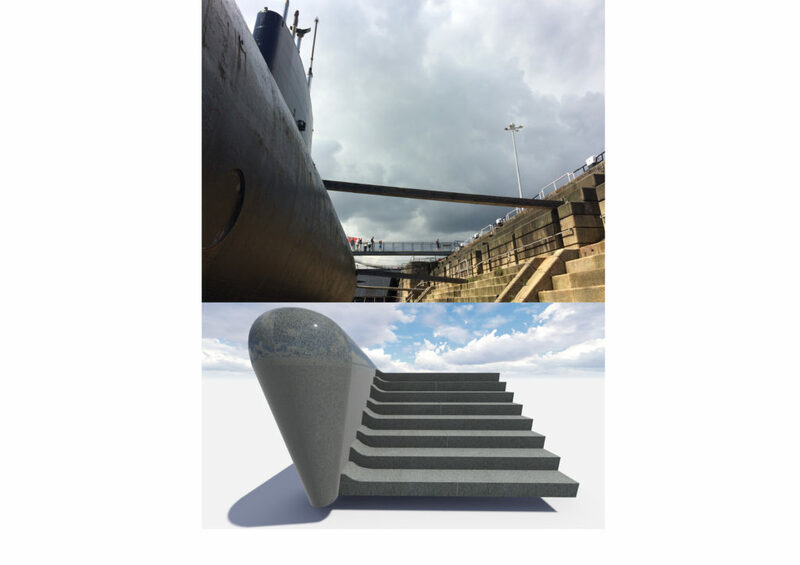 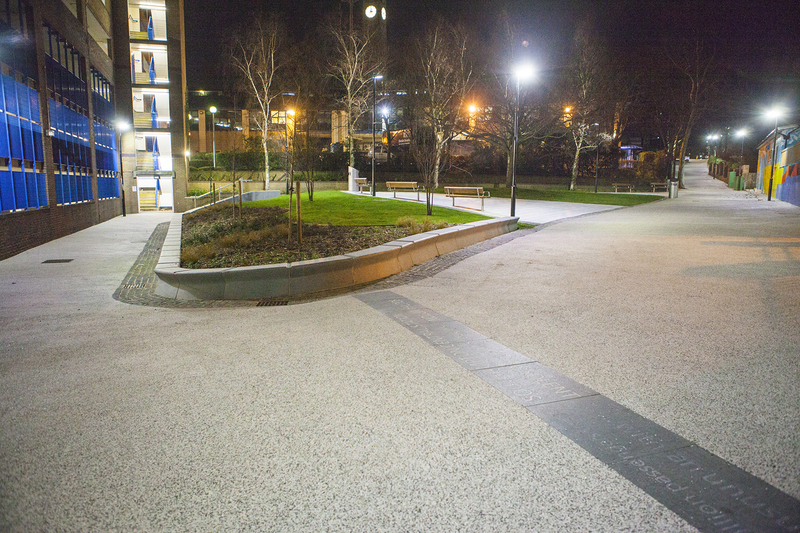 At these important sites, we have made interventions to articulate the granite kerb in ways, which are expressive and of interest, whilst still maintaining functionality. 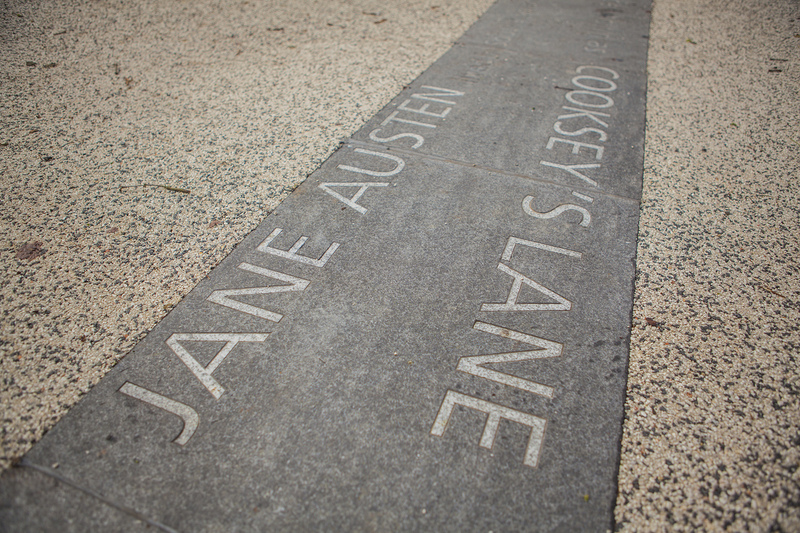 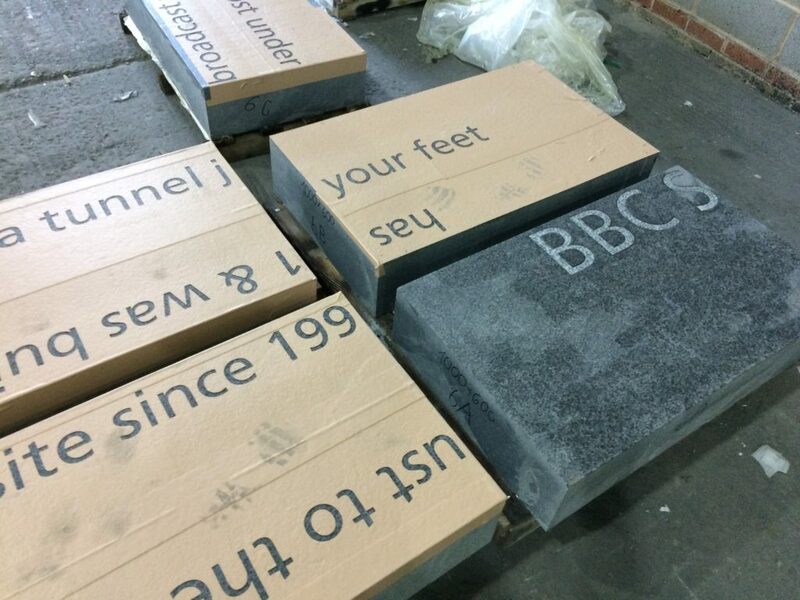 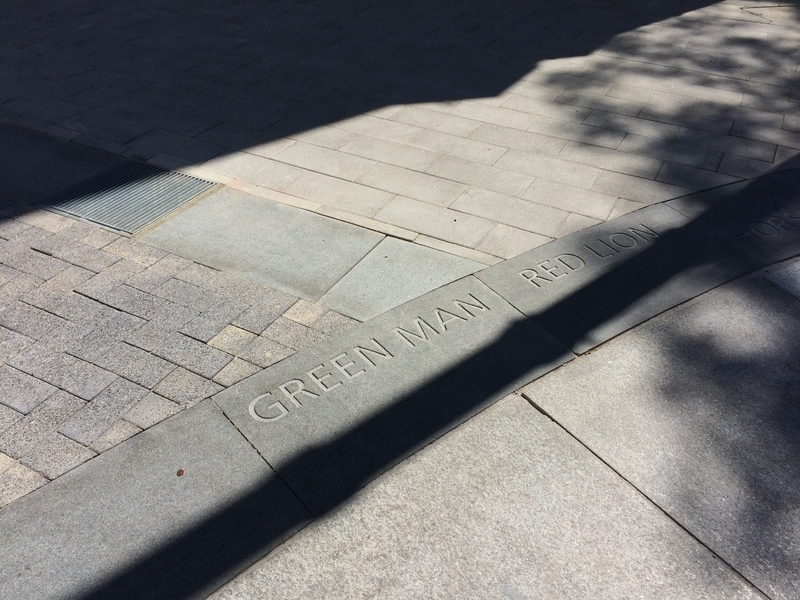 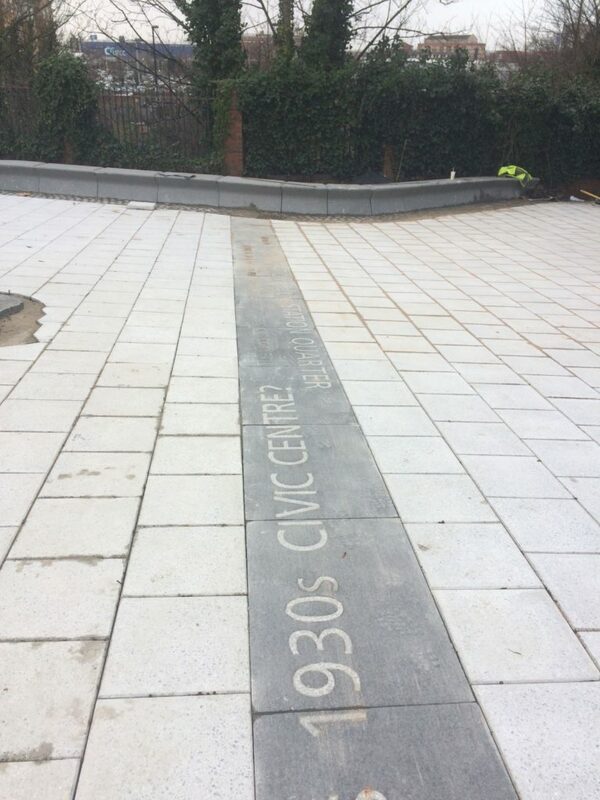 Text – white granite inset into contrasting black granite. 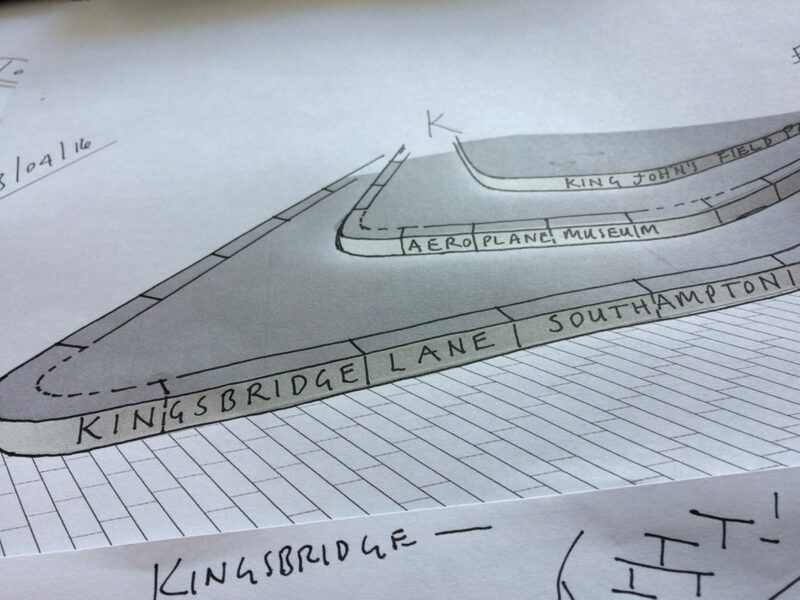 Kingsbridge Lane in Southampton is a historically important and longstanding pedestrian-only route with no vehicular access. 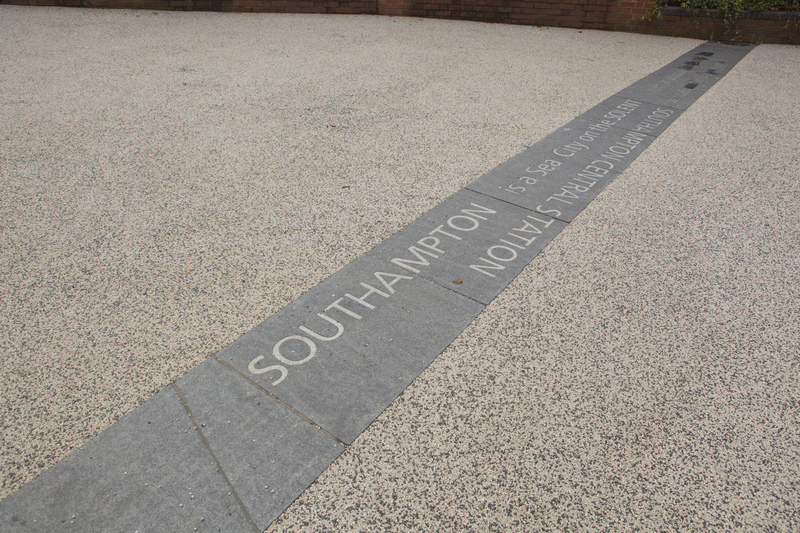 This makes the site significant to Southampton. 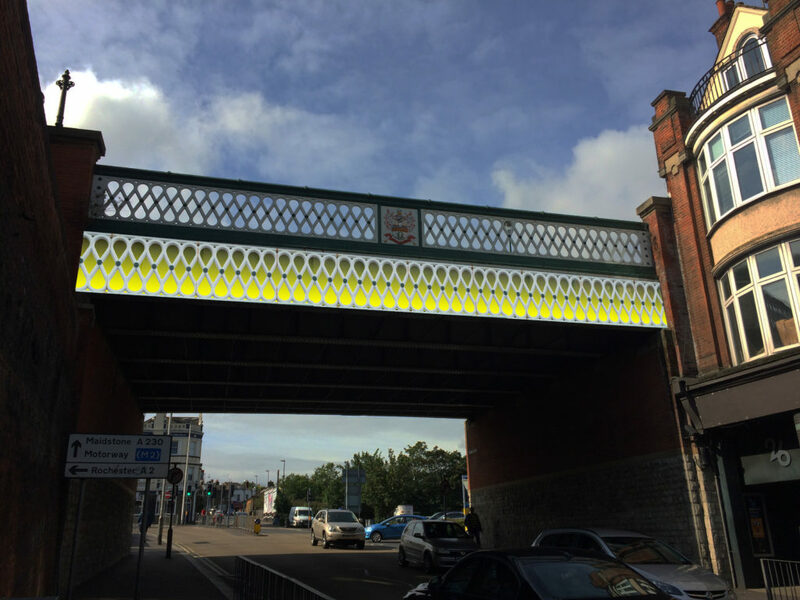 It is a long surviving link to the western route in and out of Southampton along the coastal strand, which formed the northern shore of the River Test Estuary until the early 20thCentury. 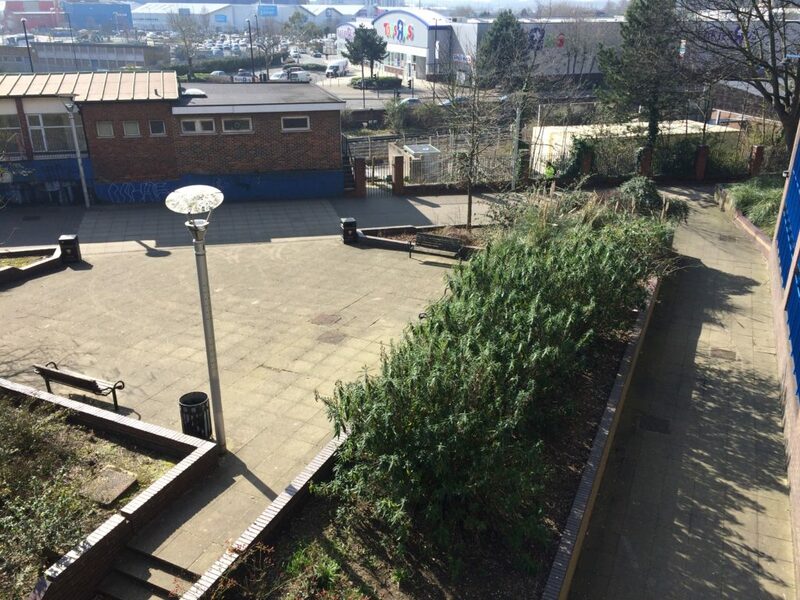 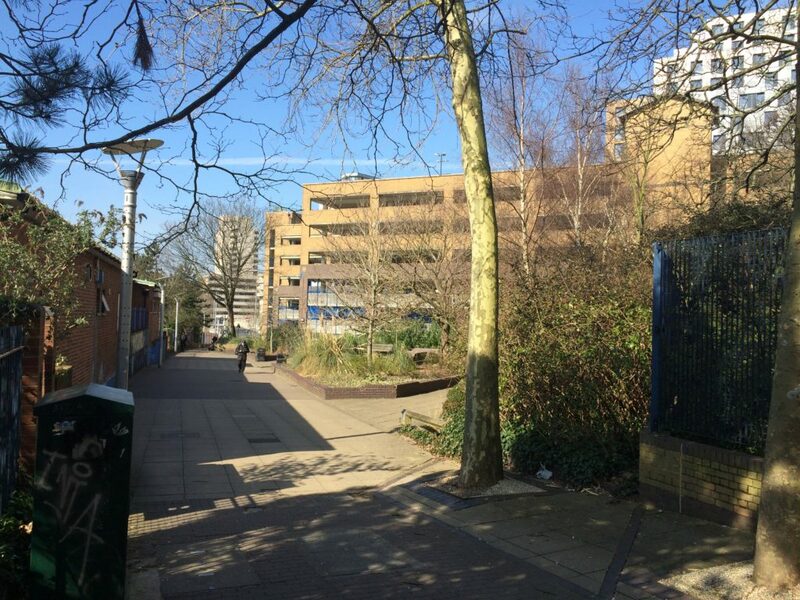 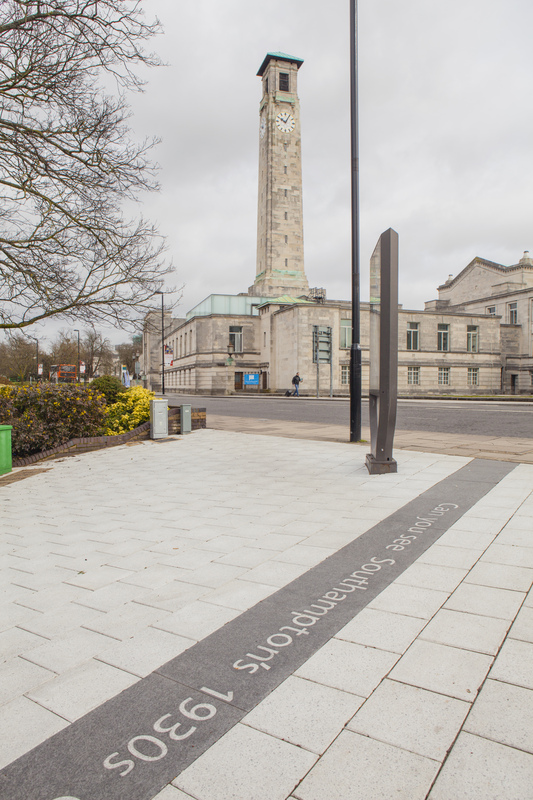 The footpath runs along a narrow strip of land between the existing railway tunnel and the historic and long abandoned tunnel of the Southampton to Salisbury Canal, which ran along what is now Blechynden Terrace, linking Central Station to the Guildhall Square &Cultural Quarter. 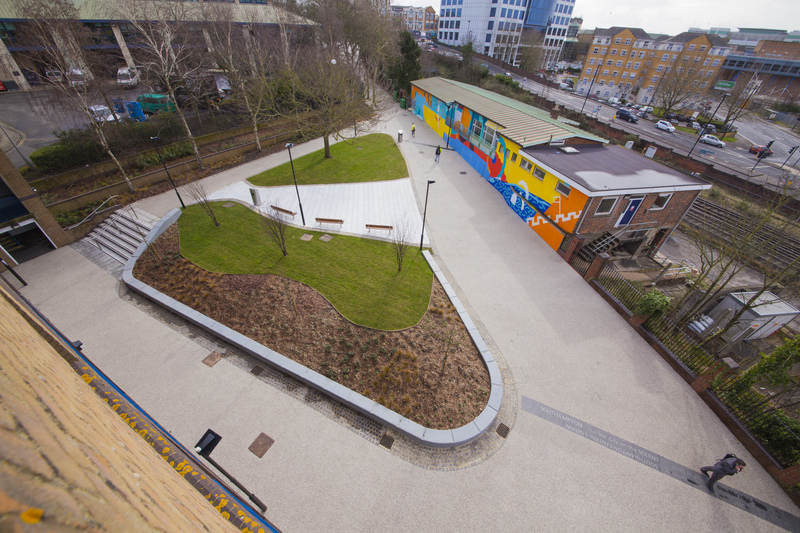 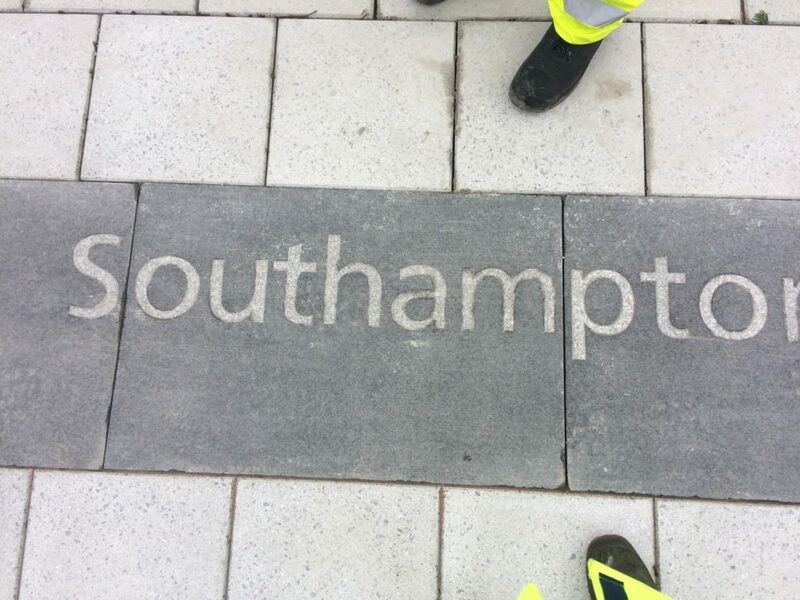 My role within this project was to develop a contextual response to the site, which would, hopefully, influence the landscape design and regenerative design process in collaboration Simon Taylor of Balfour Beatty Living Places , Southampton City Council and Hardscape. 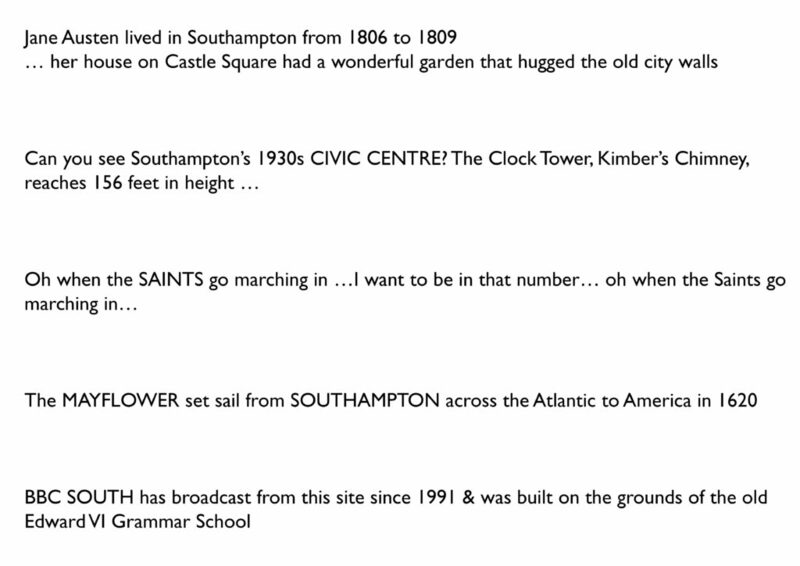 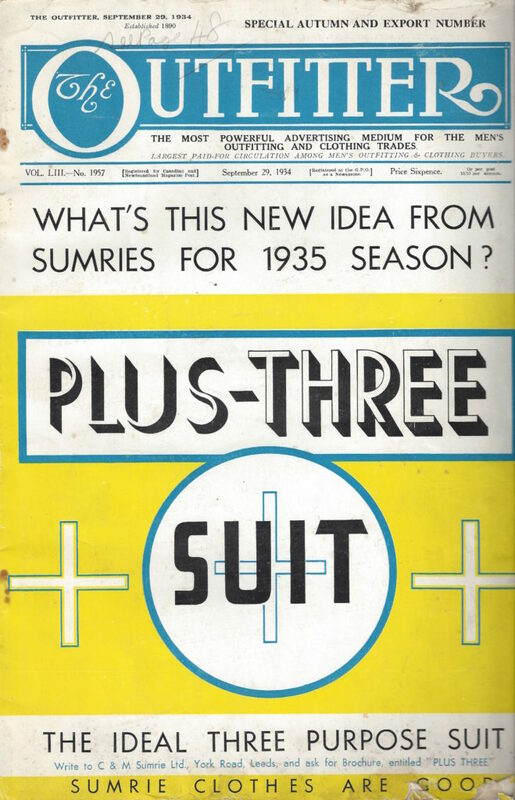 ‘SOUTHAMPTON is a Sea City on the SOLENT …with and unusual Double High Tide’. 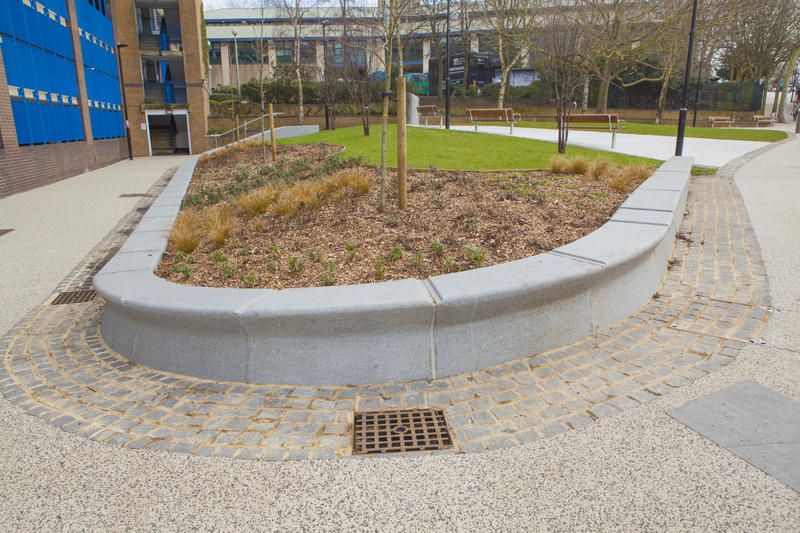 The granite seating and retaining walls by Hardscape are undercut along the front edge suggesting the movement of water throughout the site.